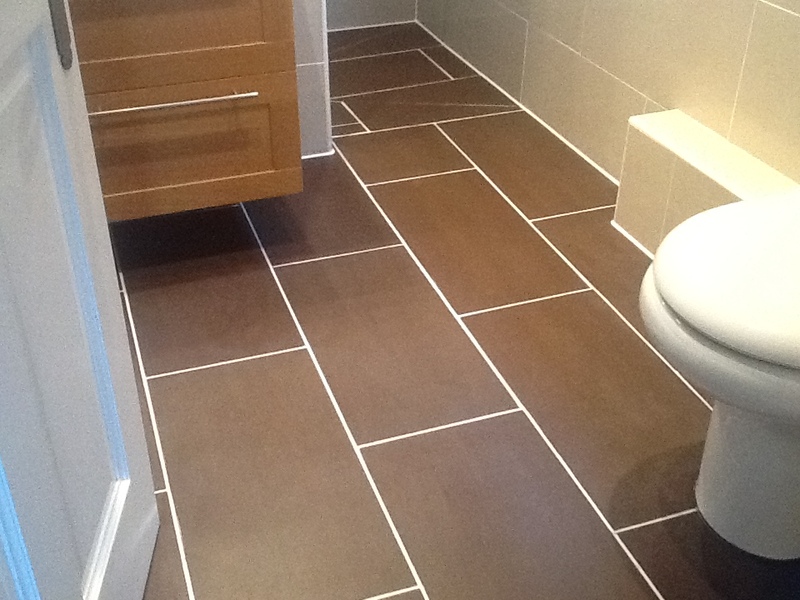 Thanks to all my customers who sent in feedback about my service recently, you probably don’t realise this but your feedback is used to determine the winner of the Tile Doctor of the Year Competition and I’m happy to report that I came 2nd place runner up at the recent Tile Doctor conference in Worcester. 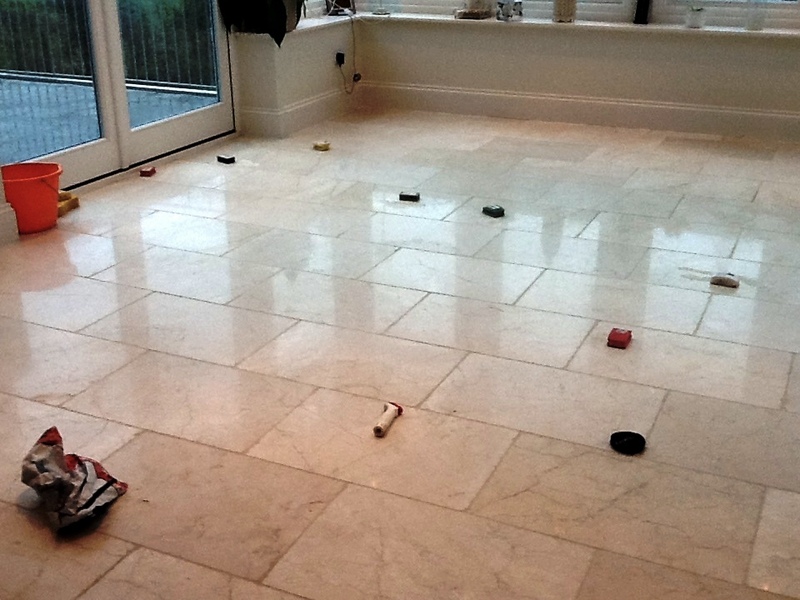 There are around 50 Tile Doctors dotted around the UK so the competition for first place is very tough indeed and I only narrowly escaped being pushed into 3rd place by the Shropshire Tile Doctor. 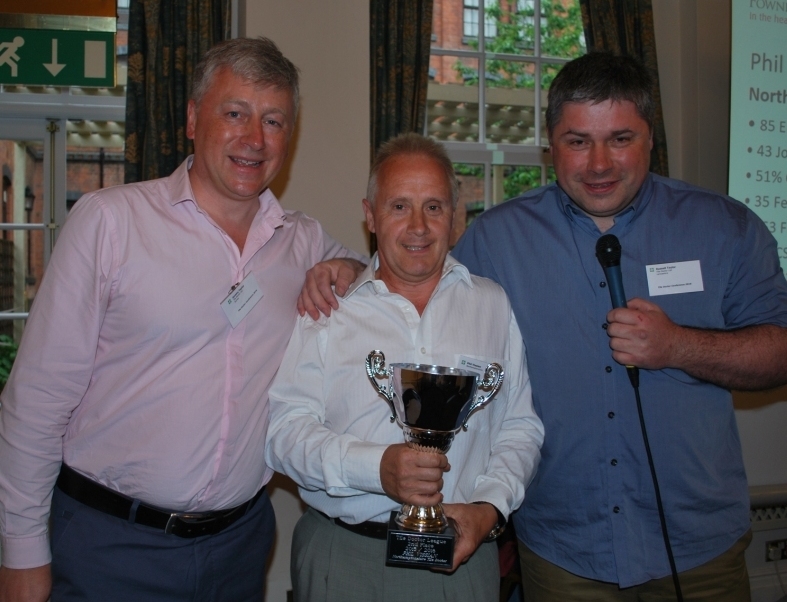 Pictured with me above and presenting the award are Tile Doctor directors Jeremy Taylor (Left) and Russell Taylor (Right). 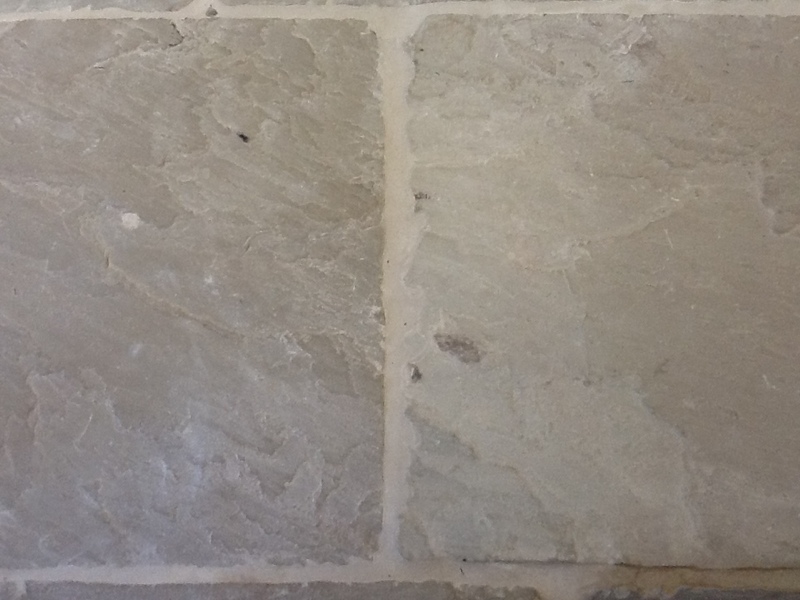 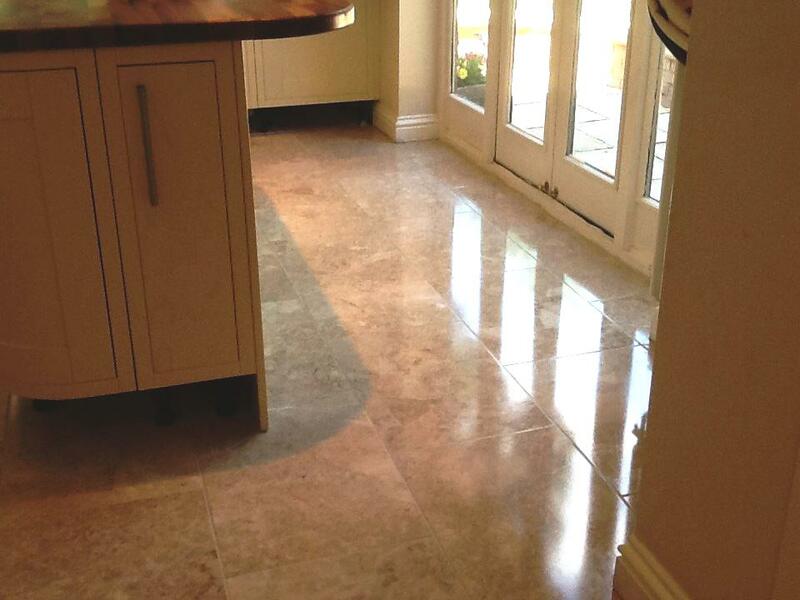 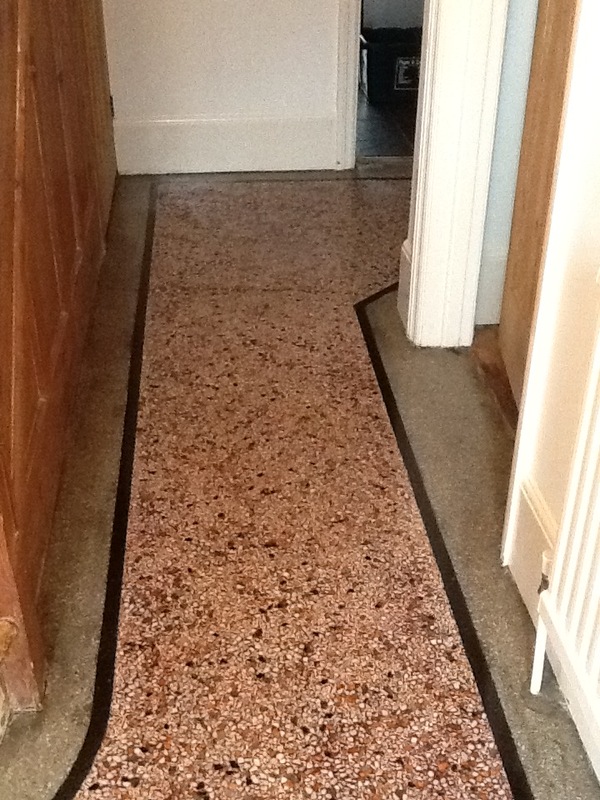 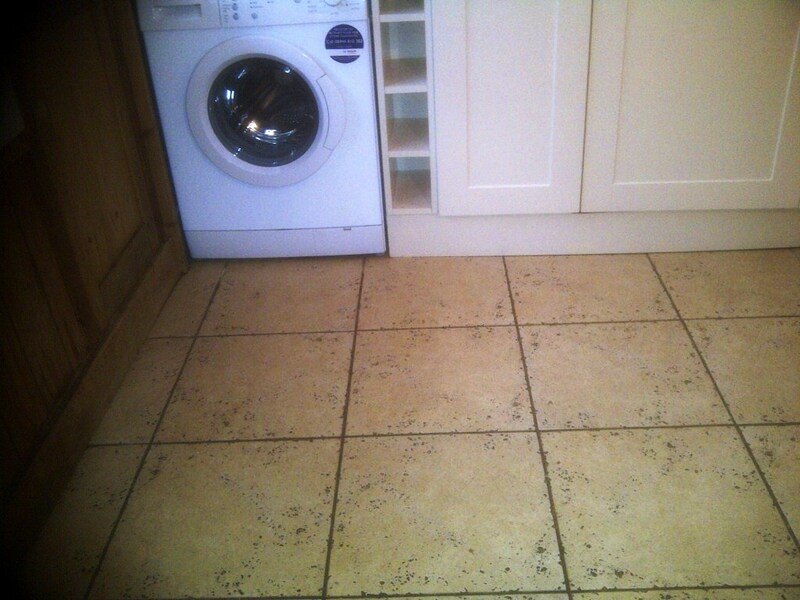 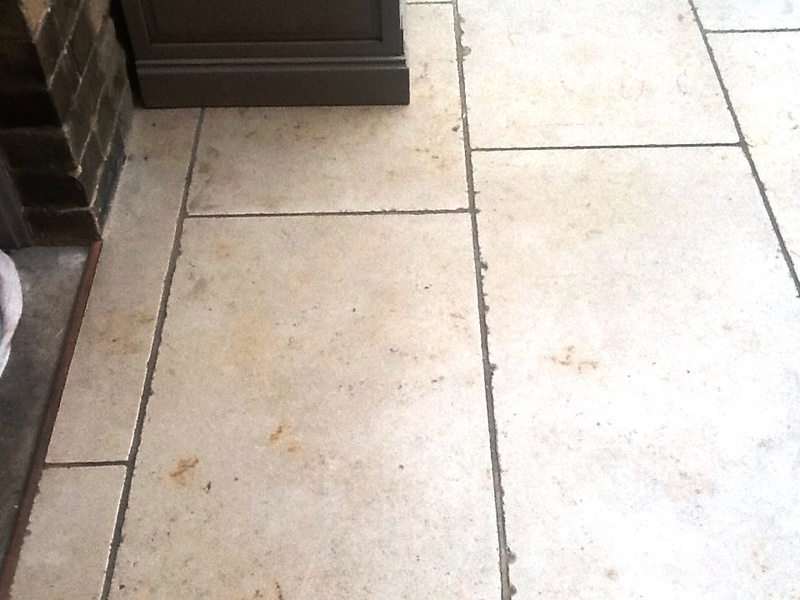 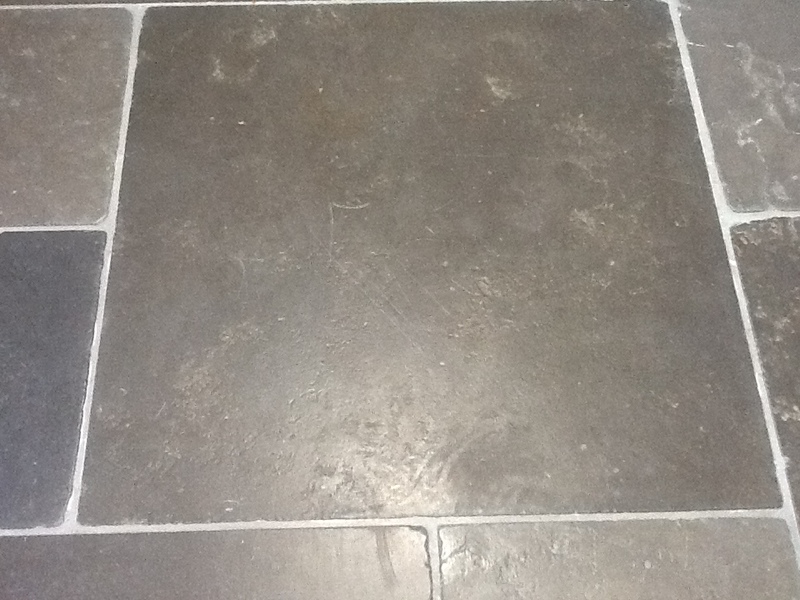 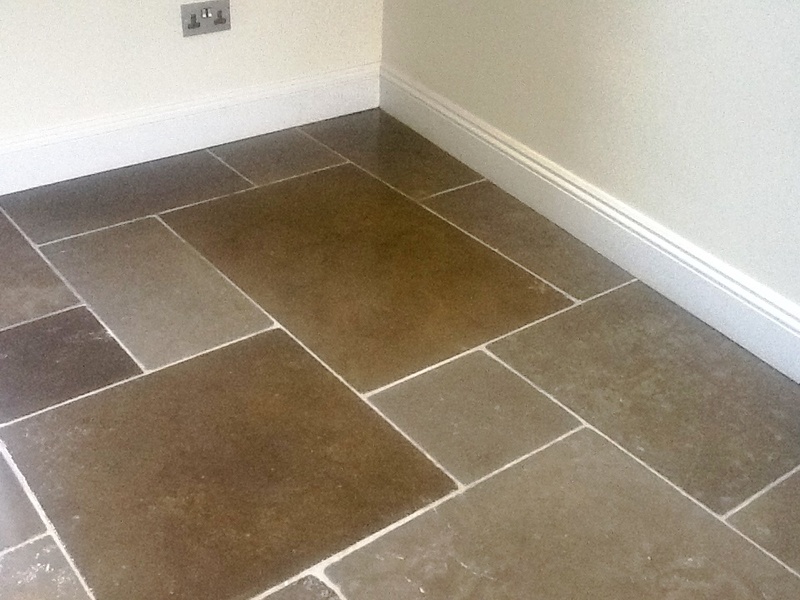 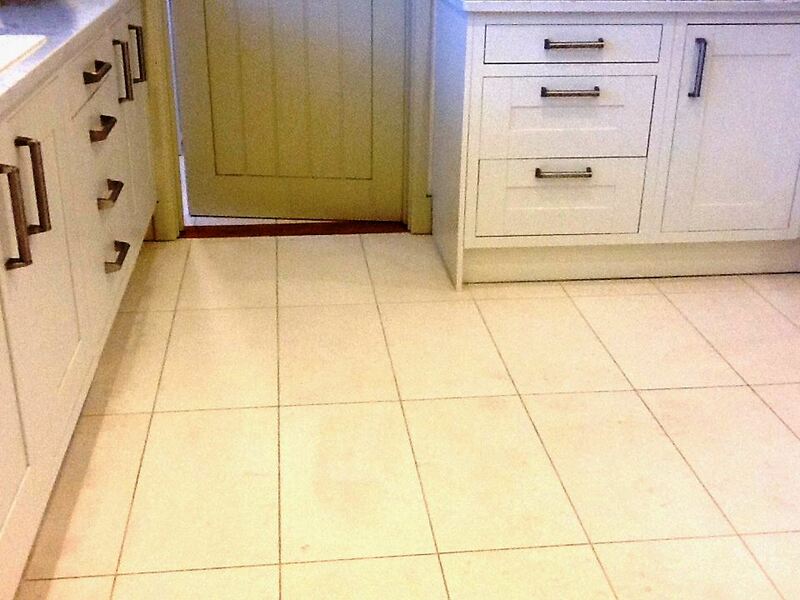 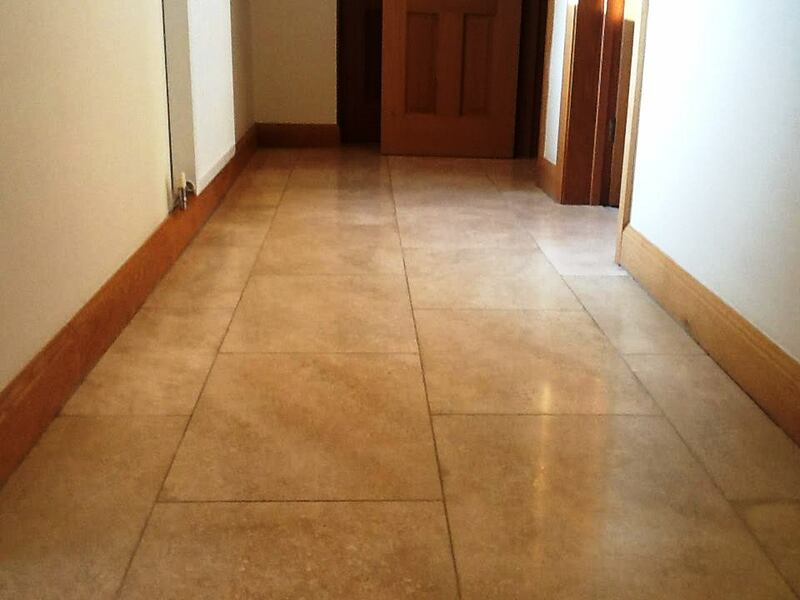 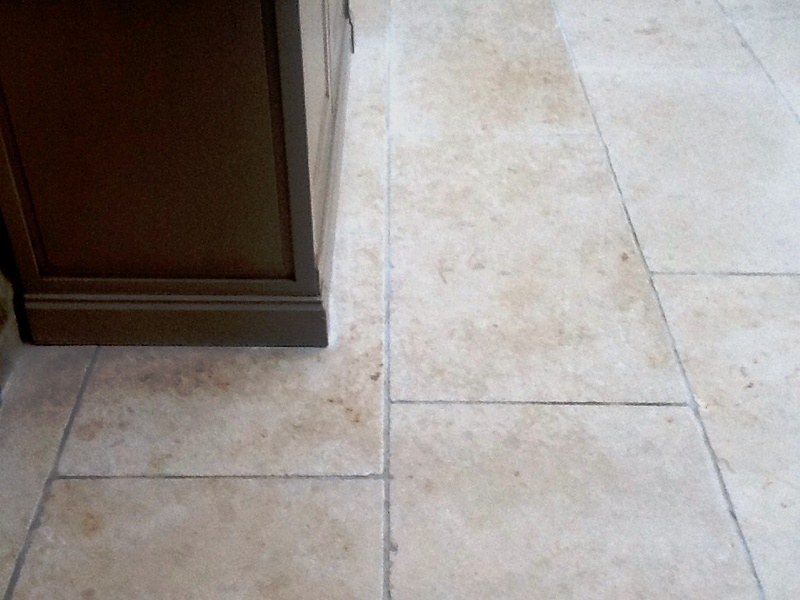 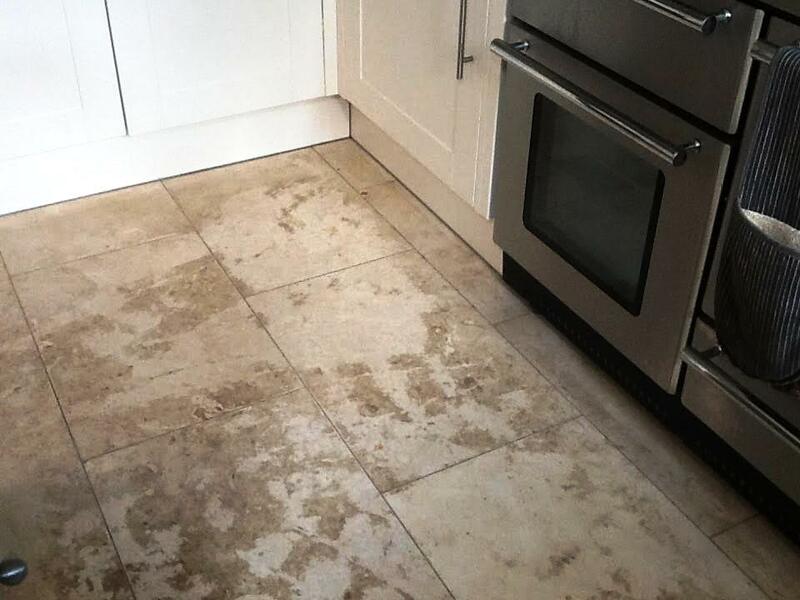 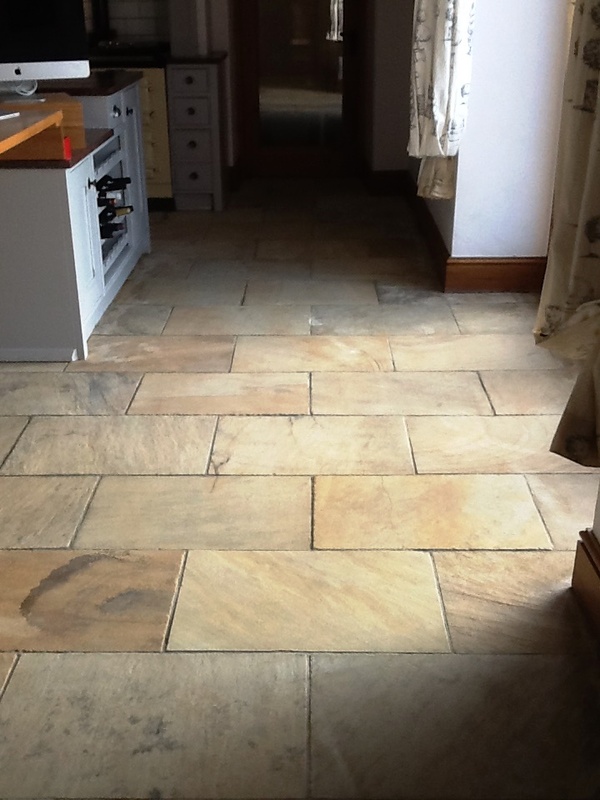 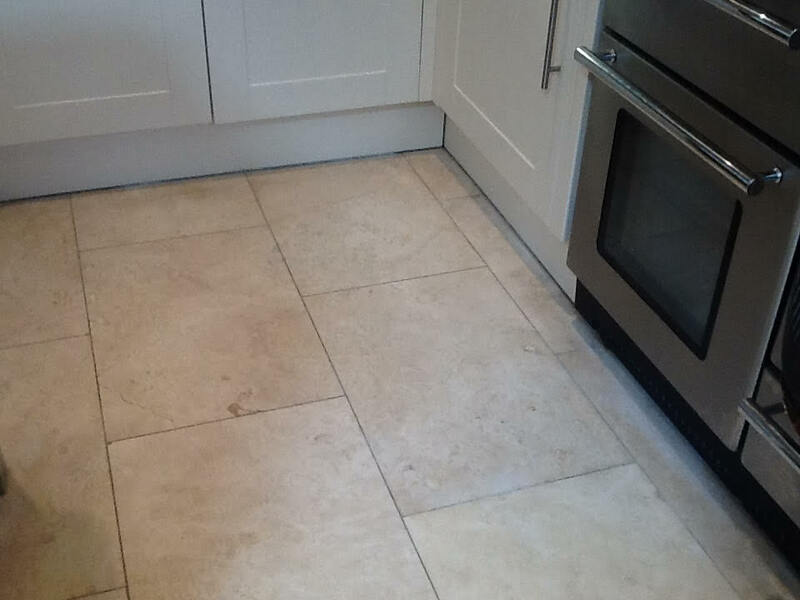 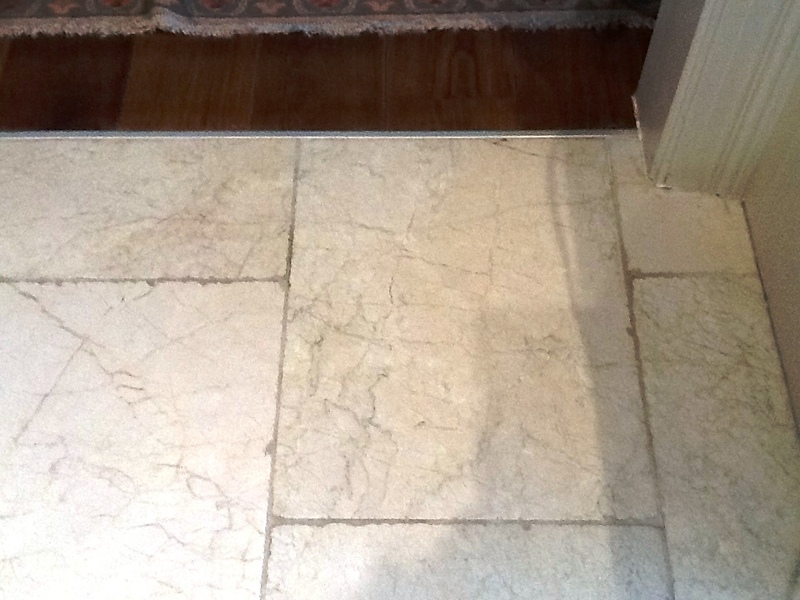 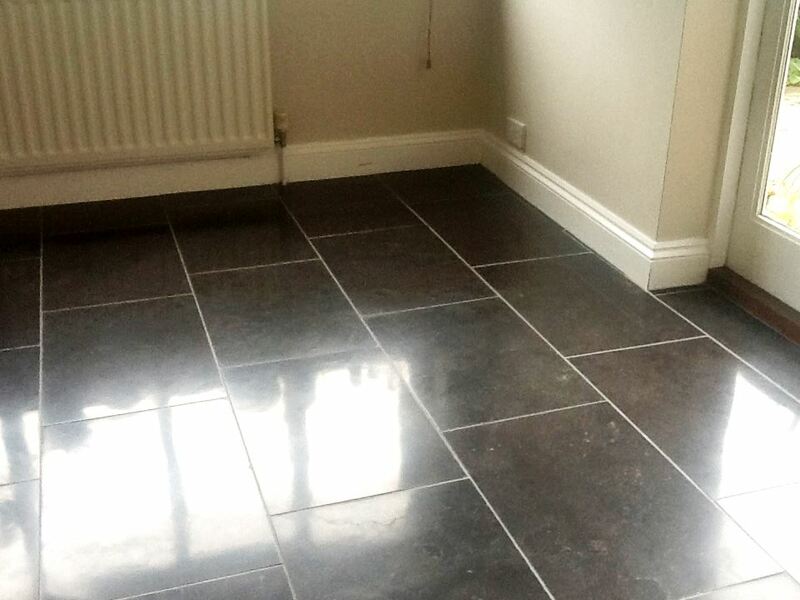 Great testimonial here from the customer who described her floor as “bleak drab grey dull slate with heavily stained brown looking grout”. 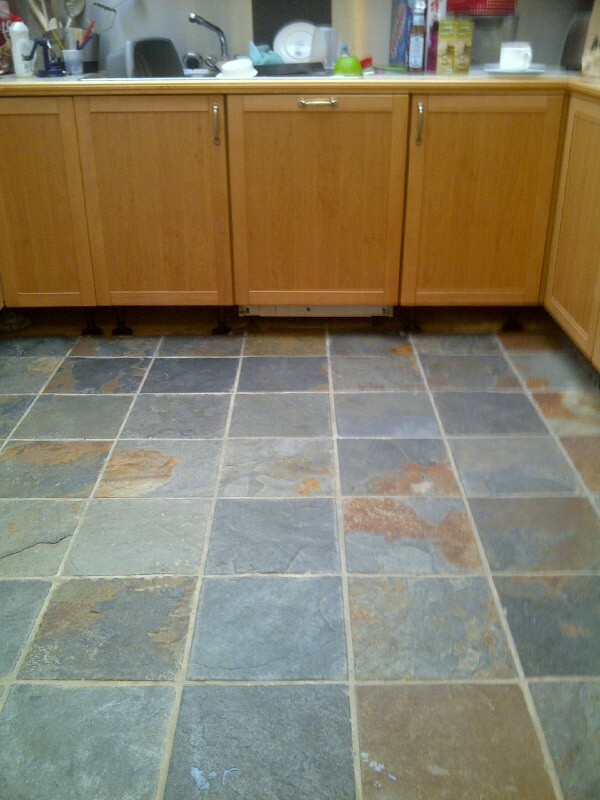 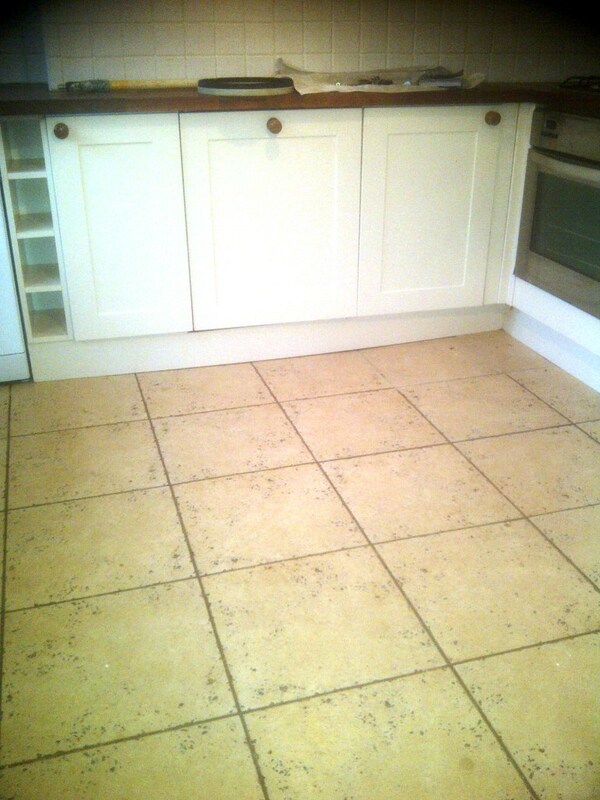 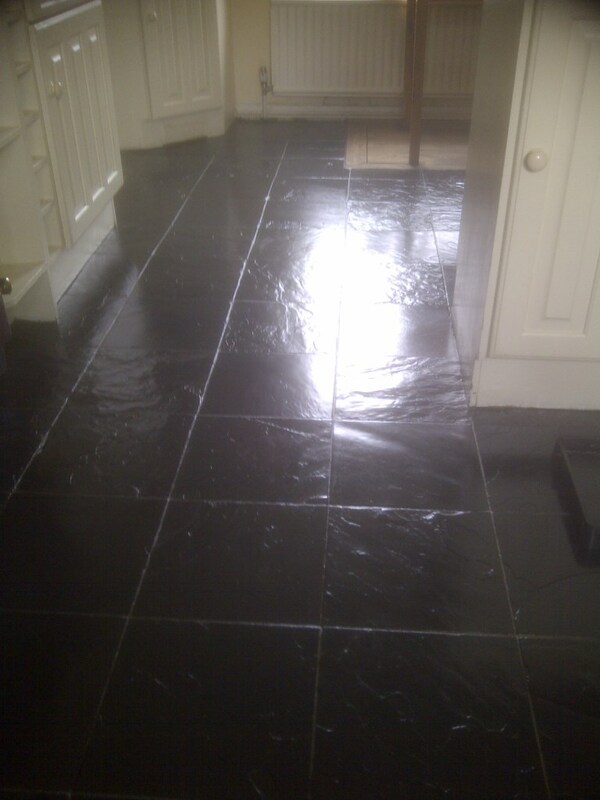 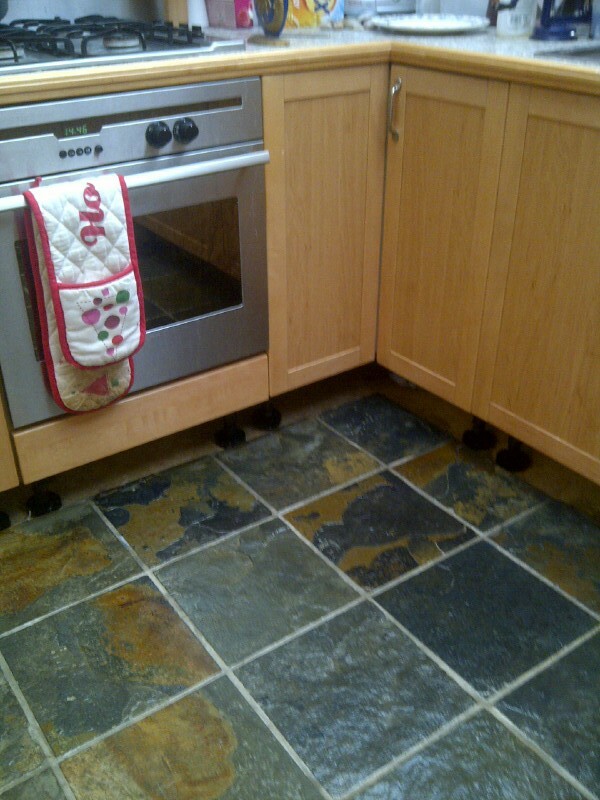 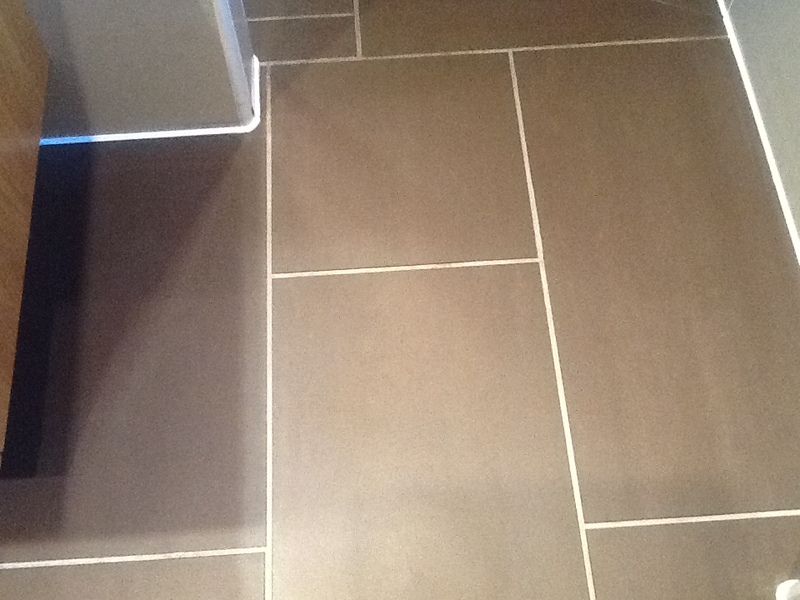 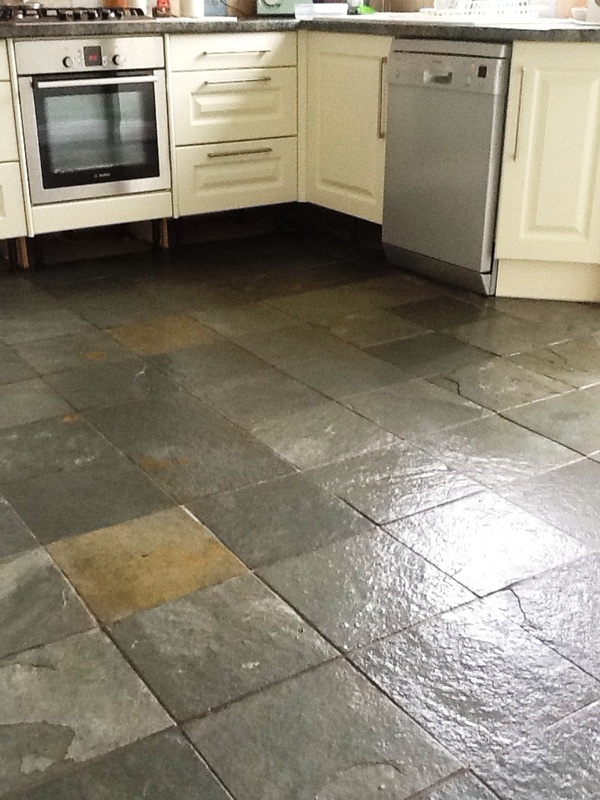 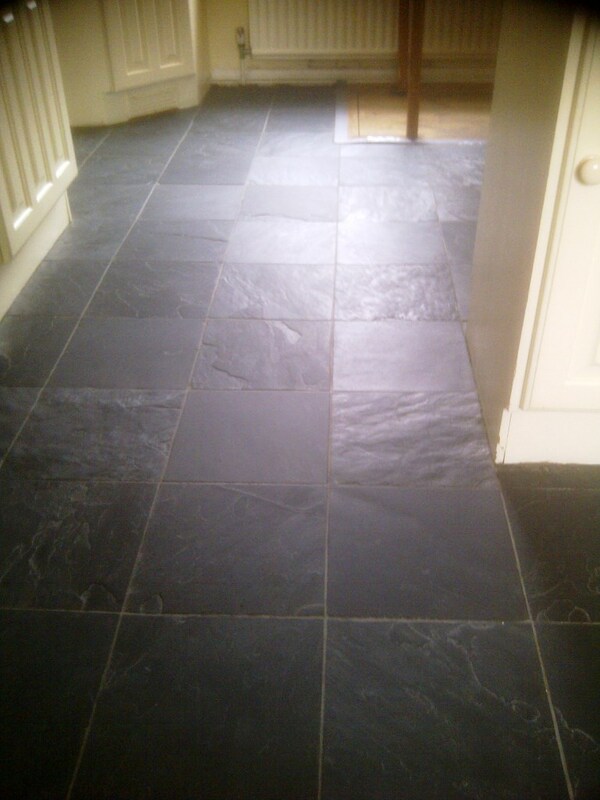 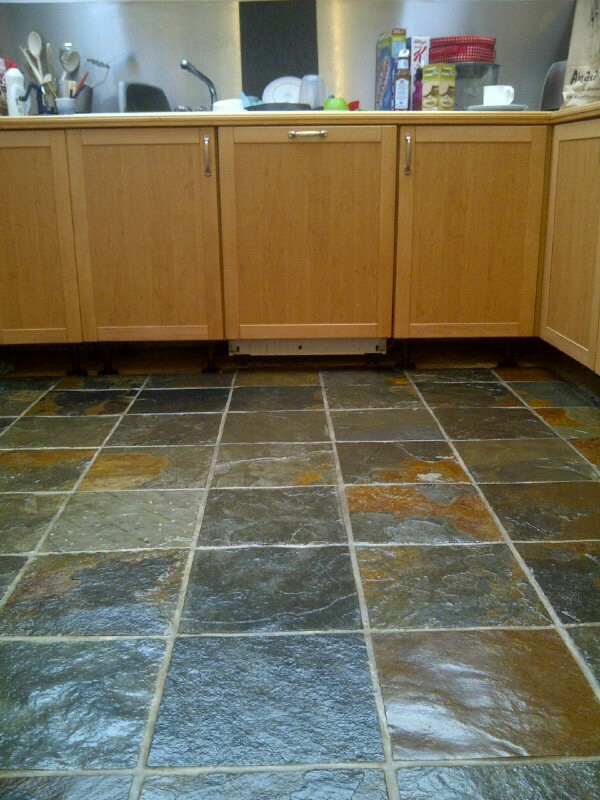 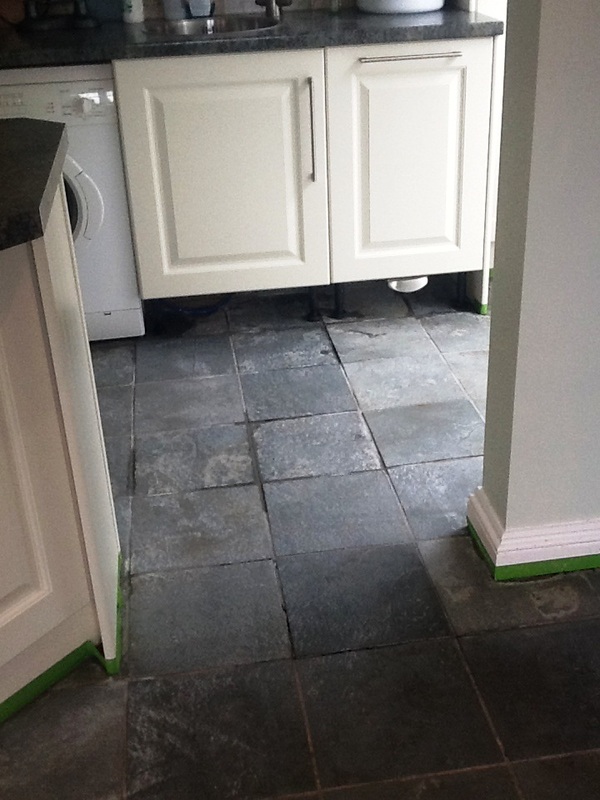 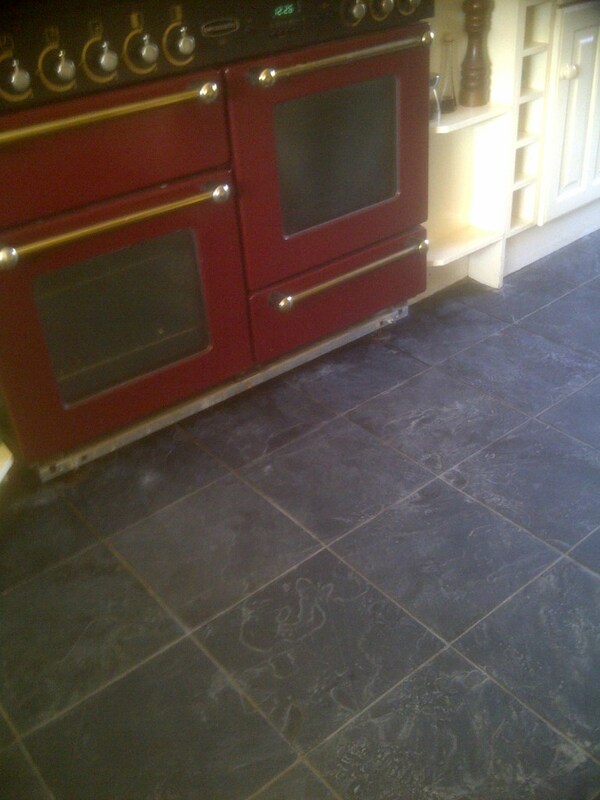 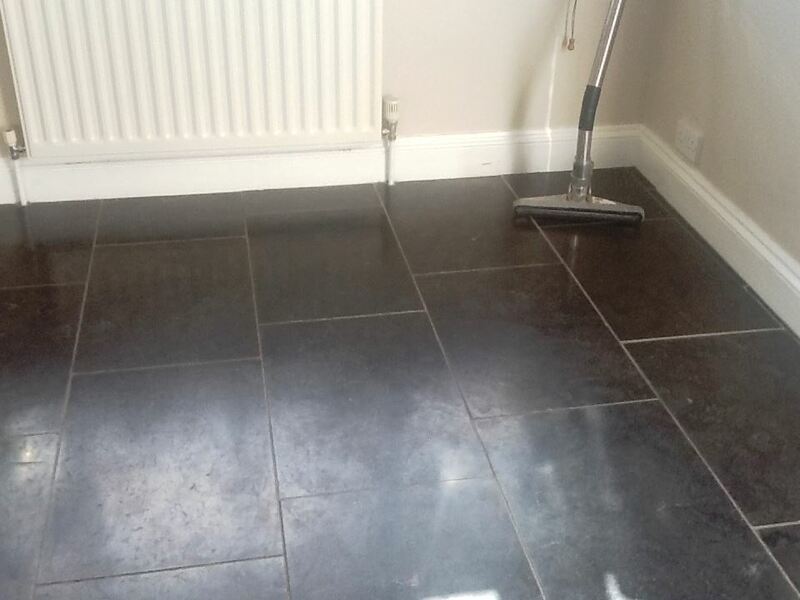 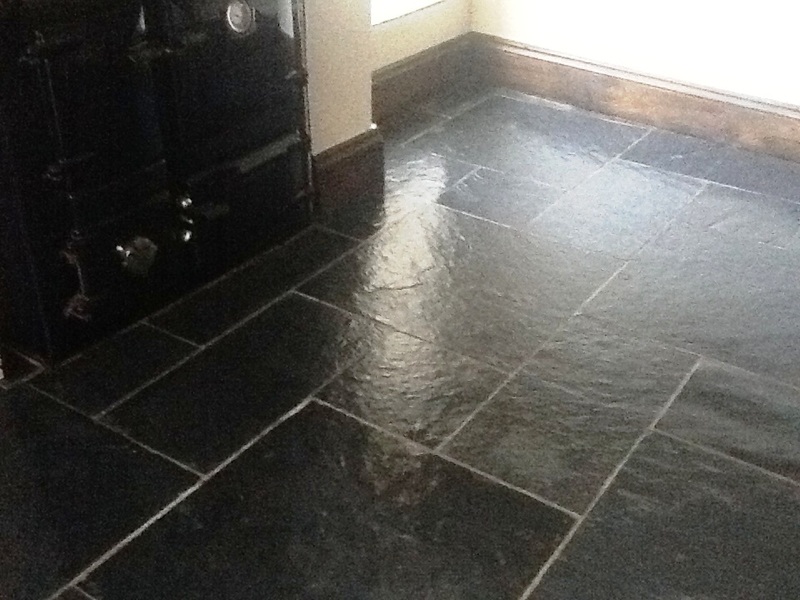 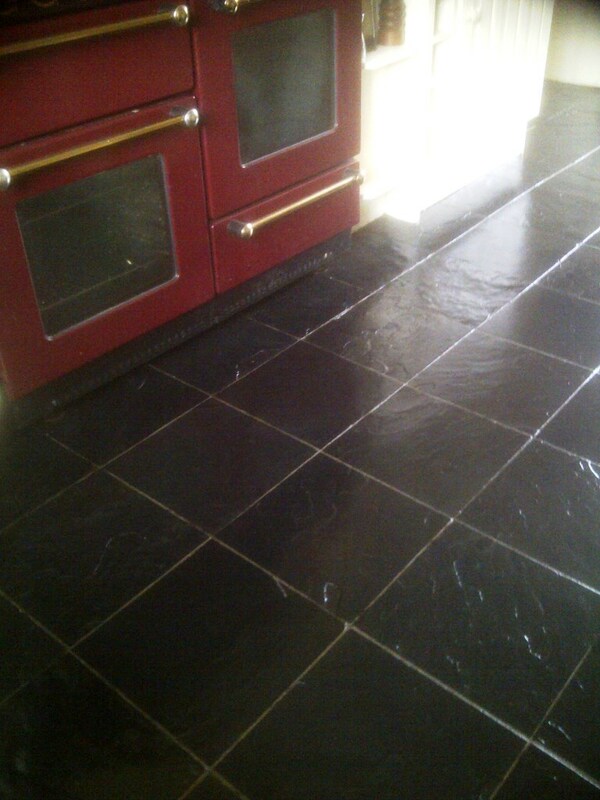 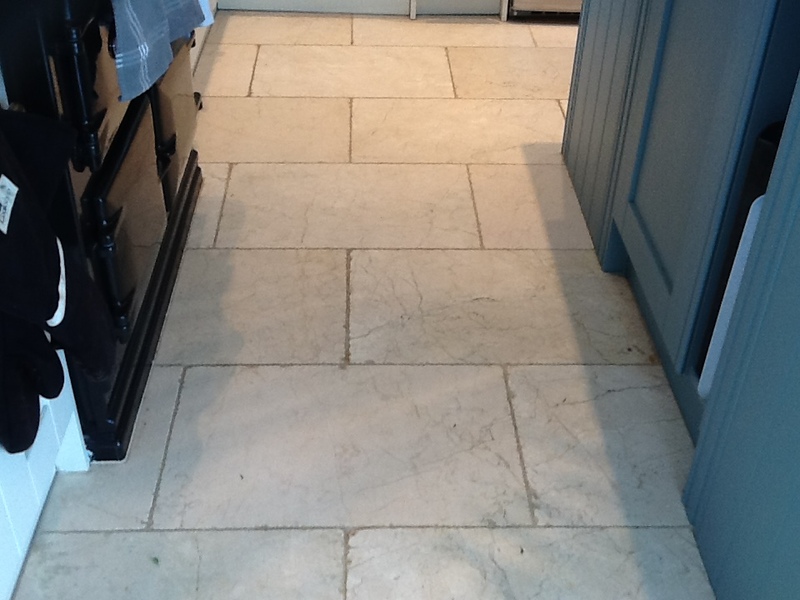 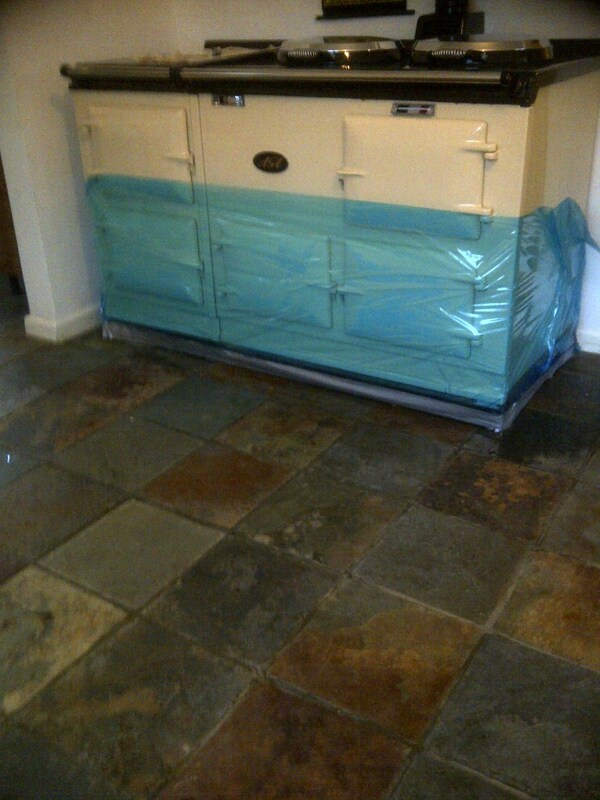 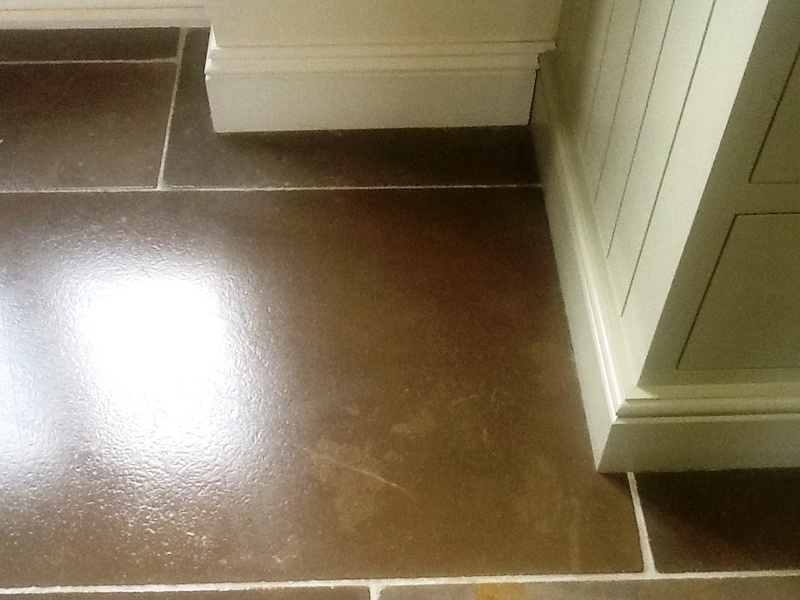 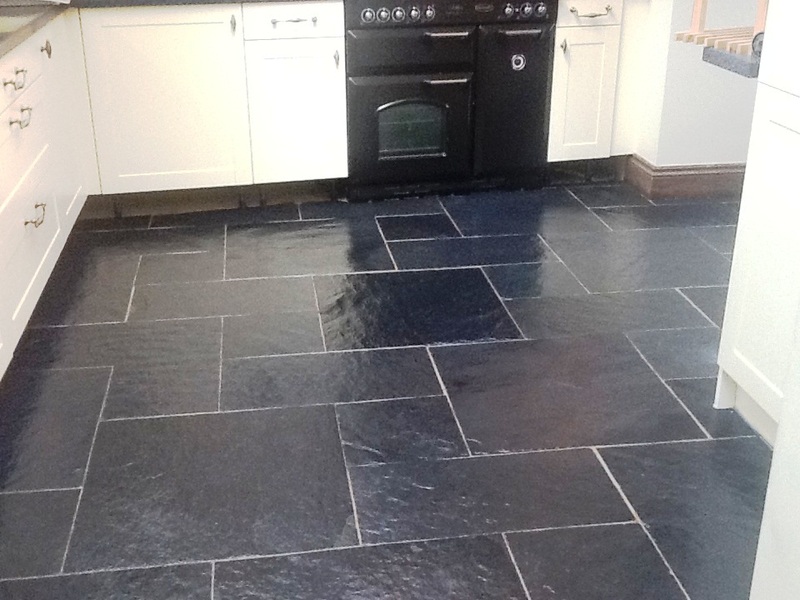 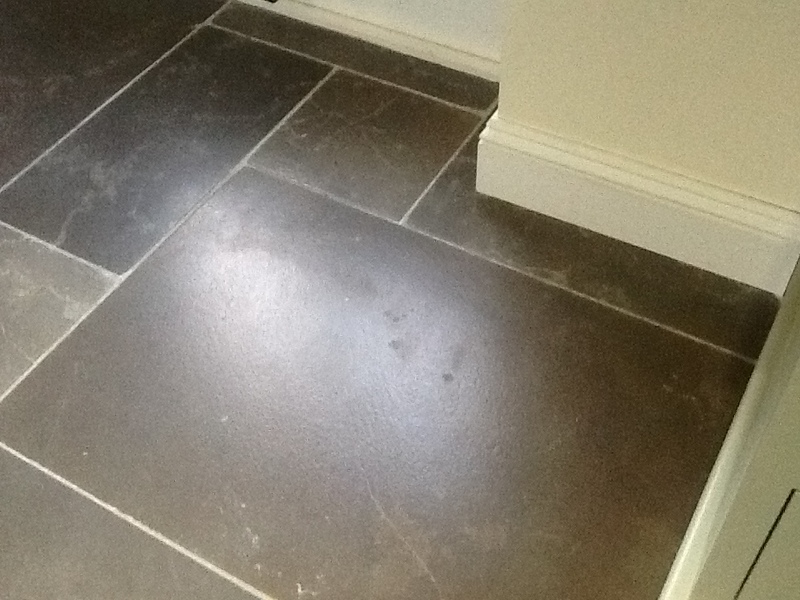 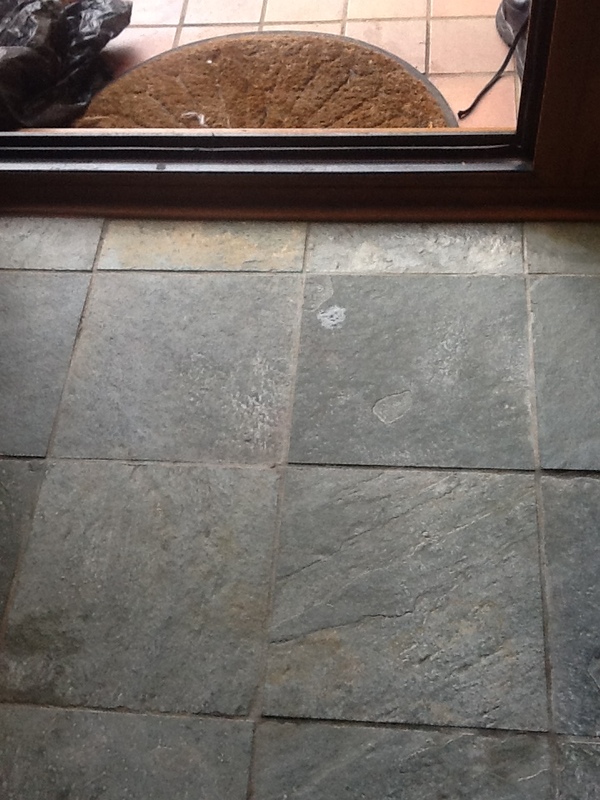 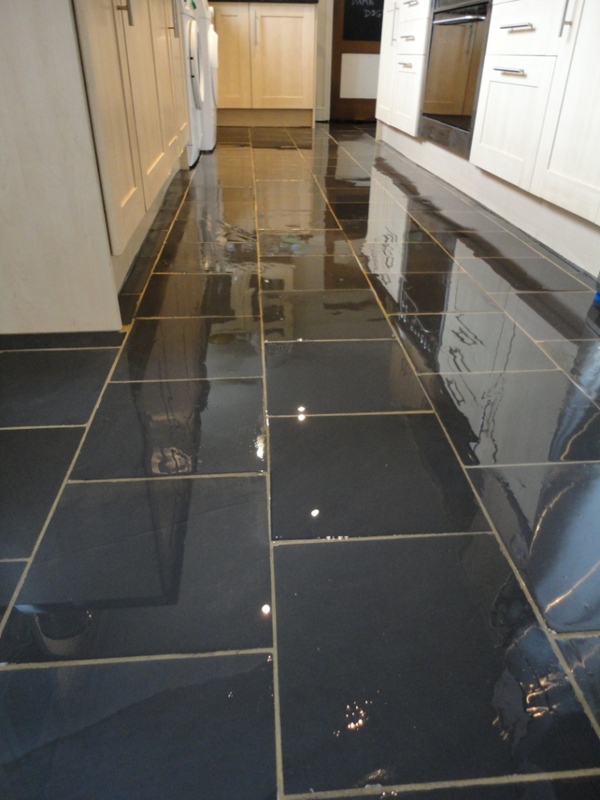 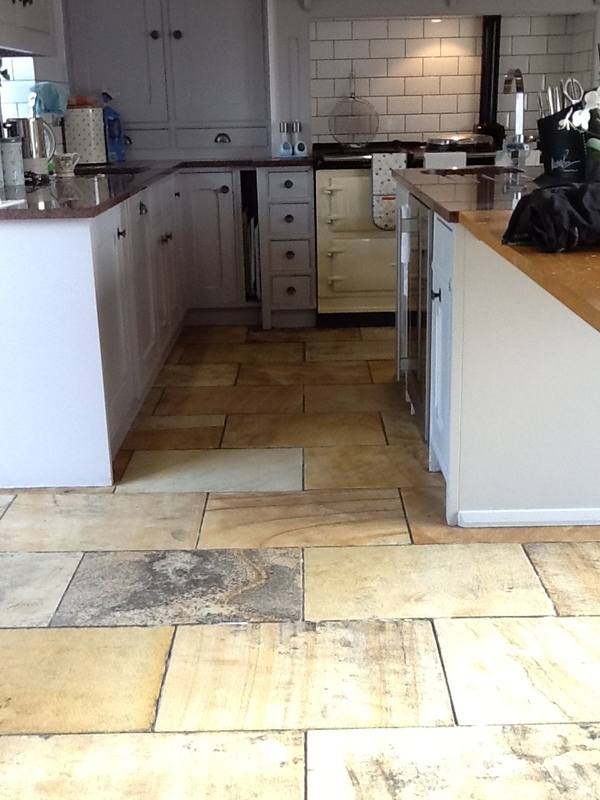 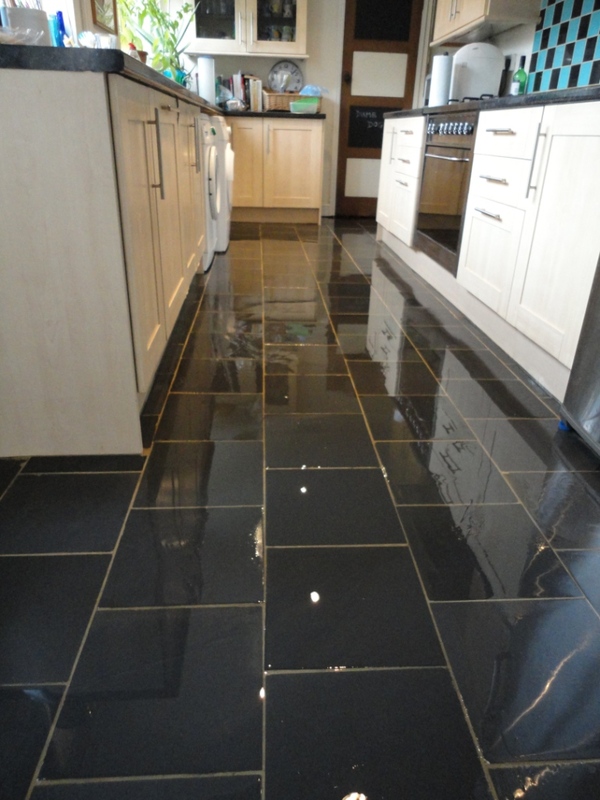 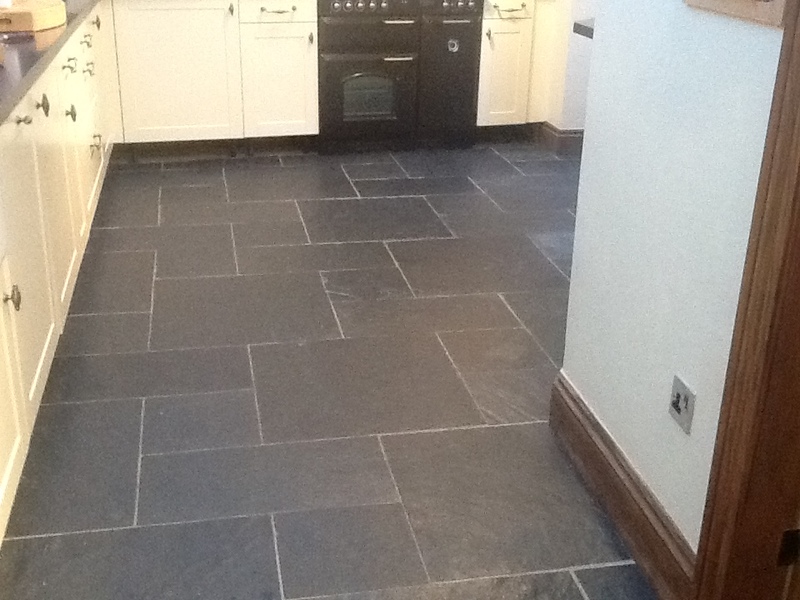 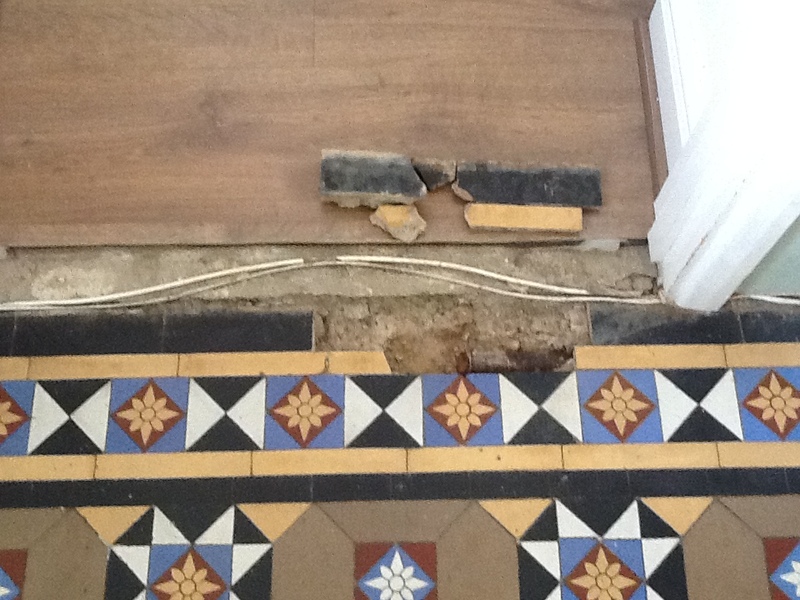 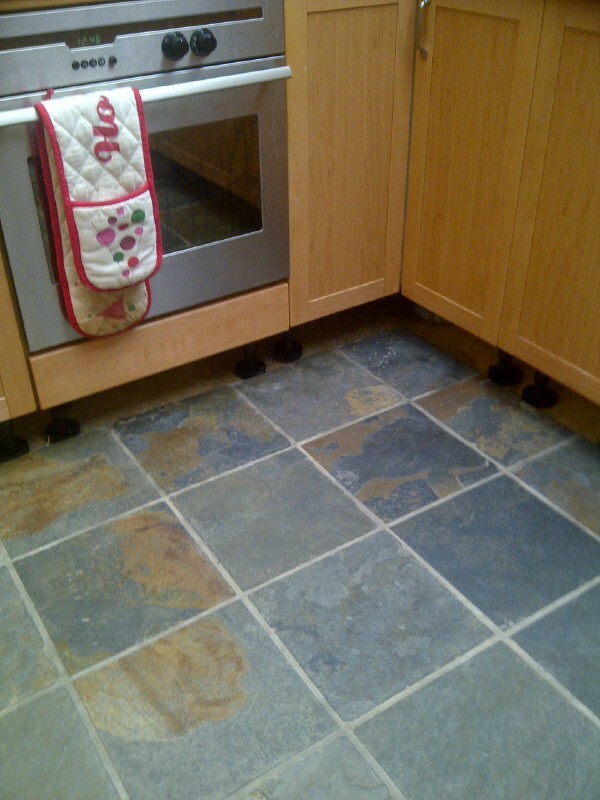 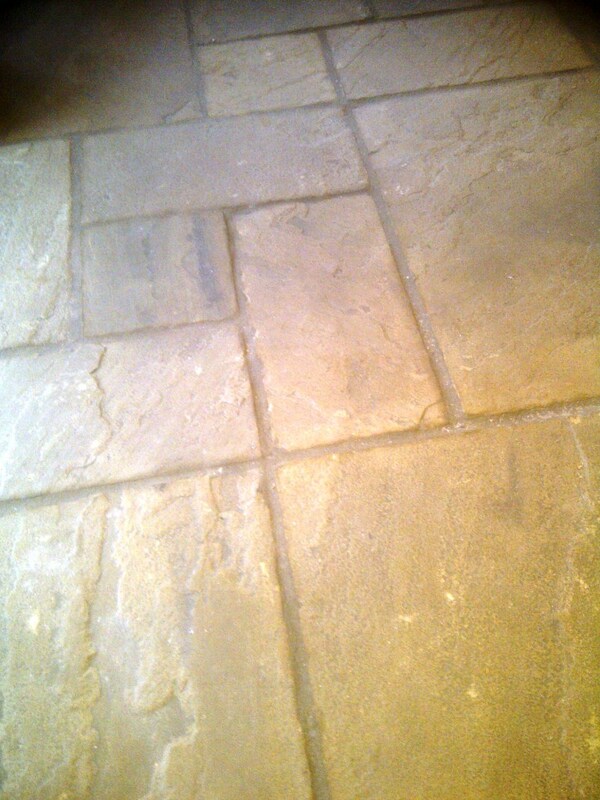 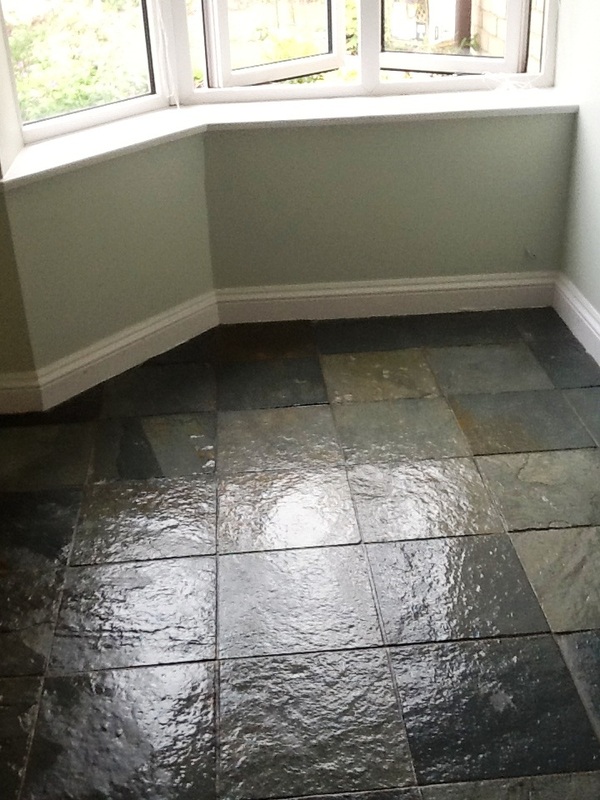 The slate tiles are Semi Riven Black Slate laid on the floor of a Kitchen in a house in Kettering. 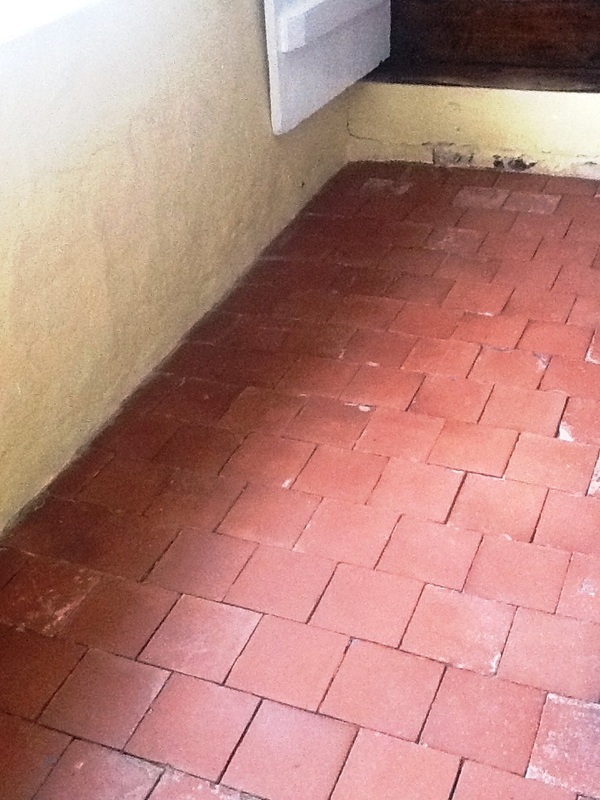 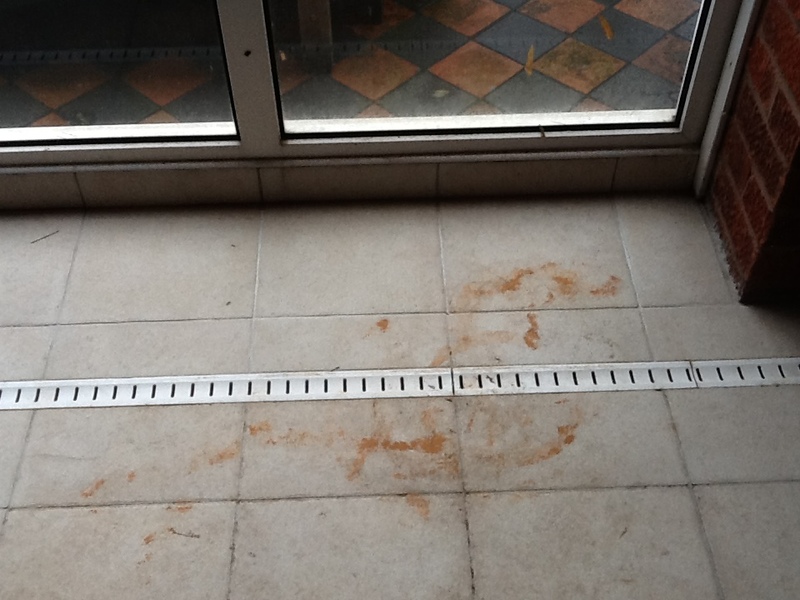 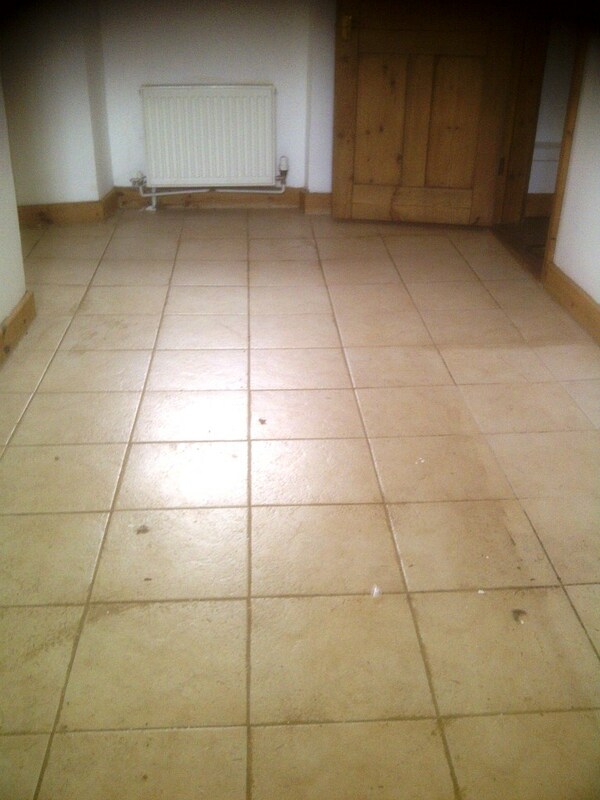 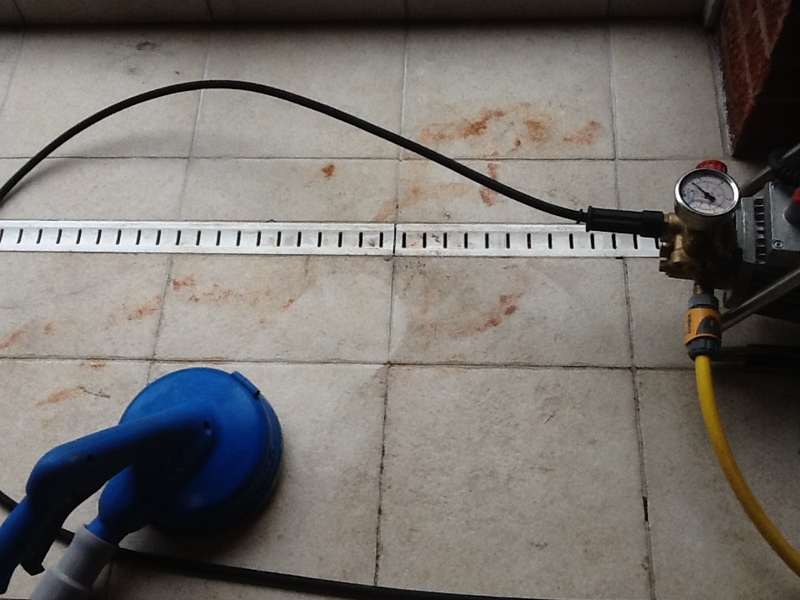 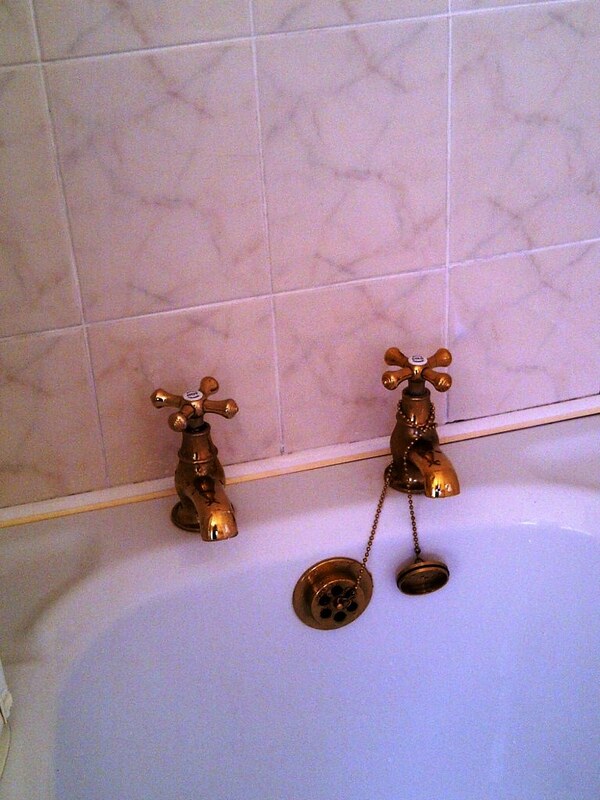 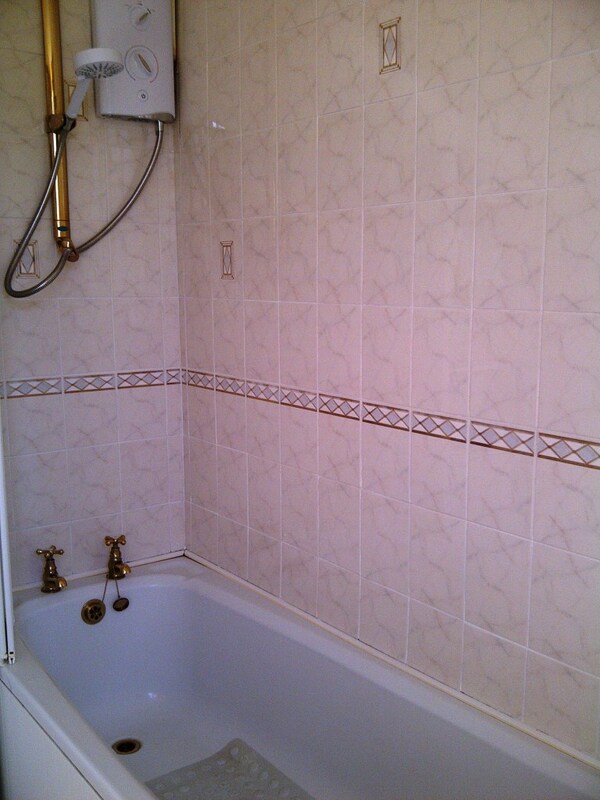 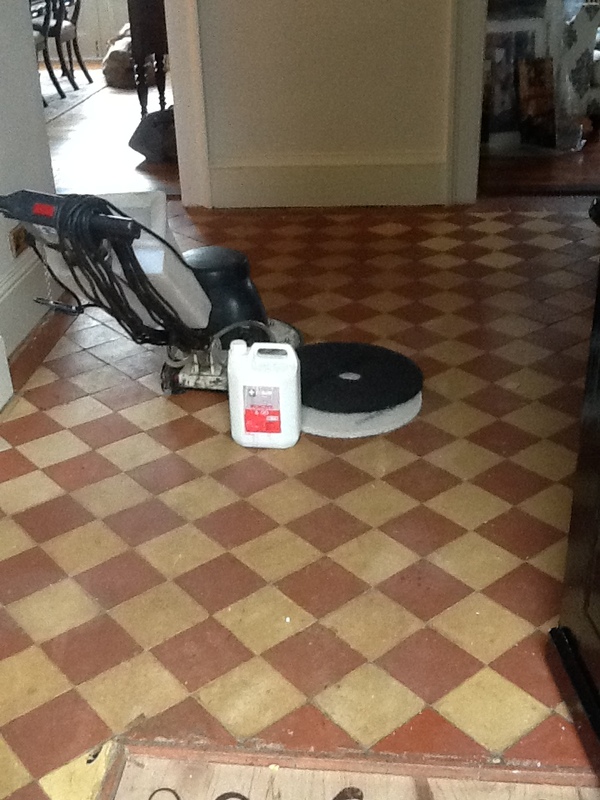 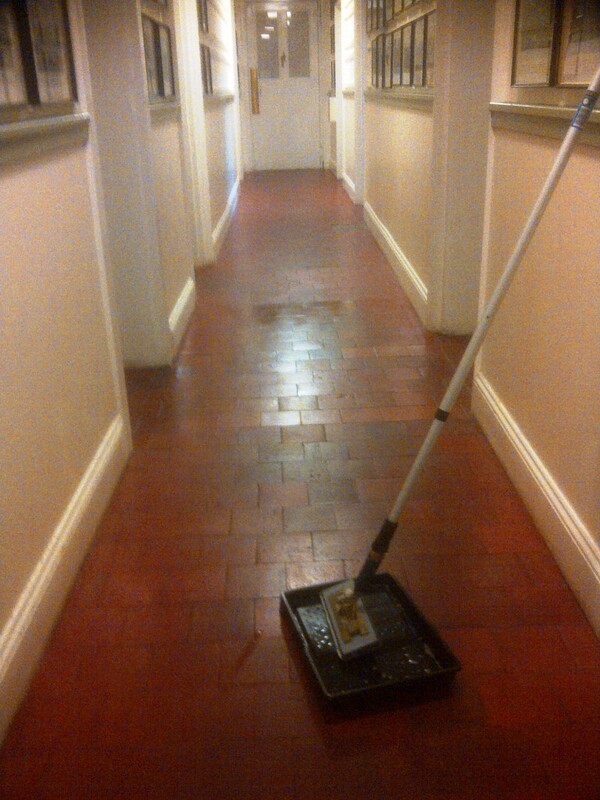 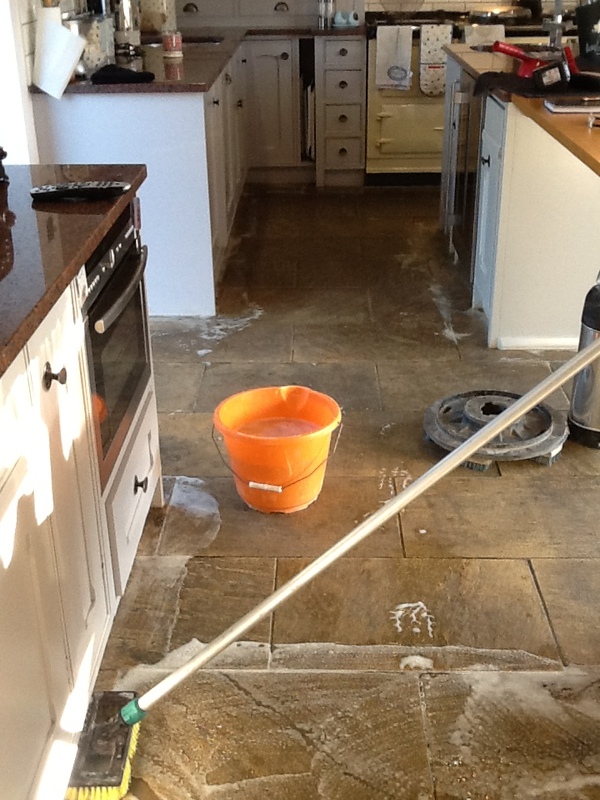 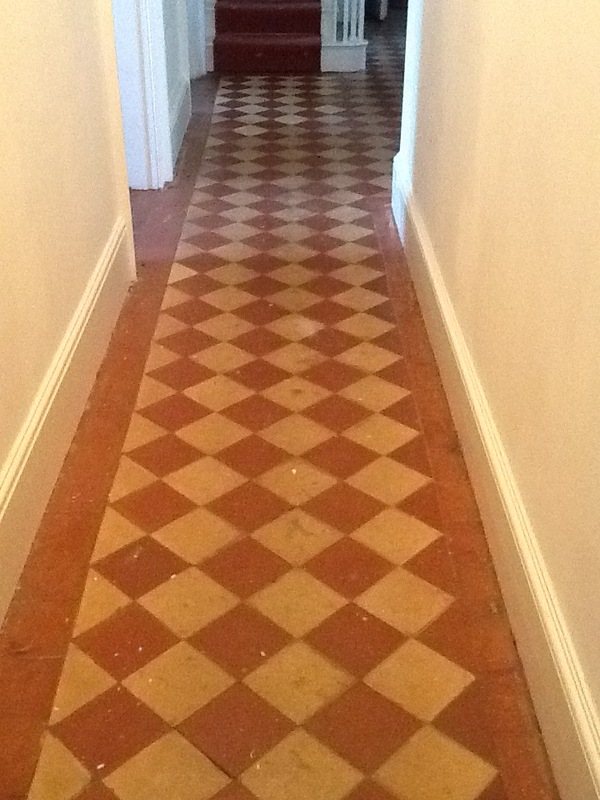 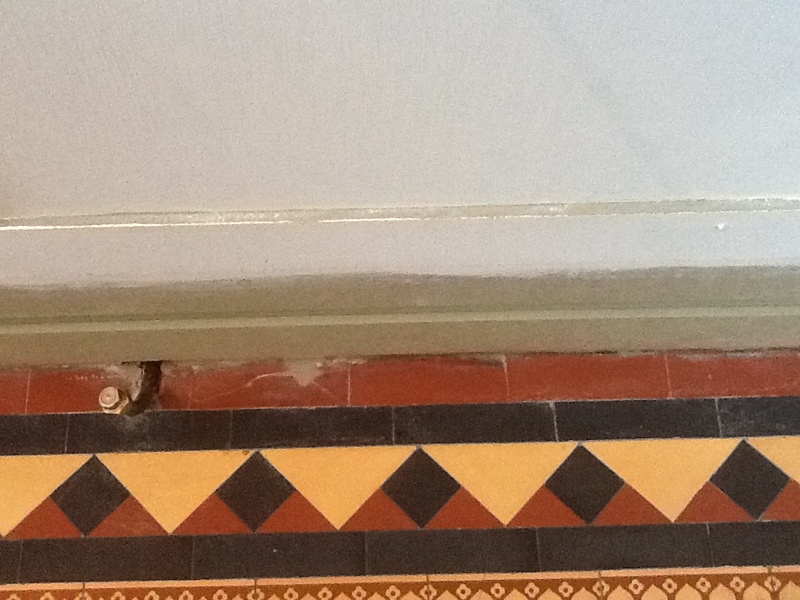 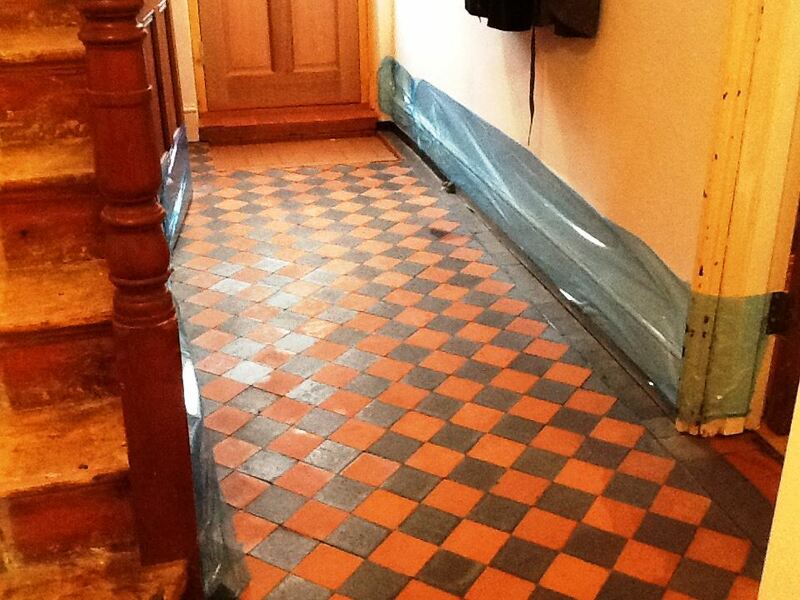 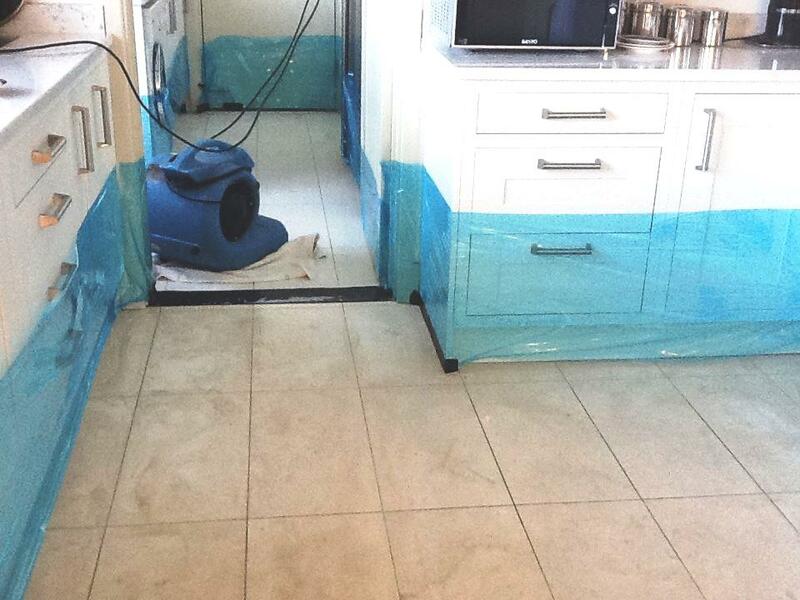 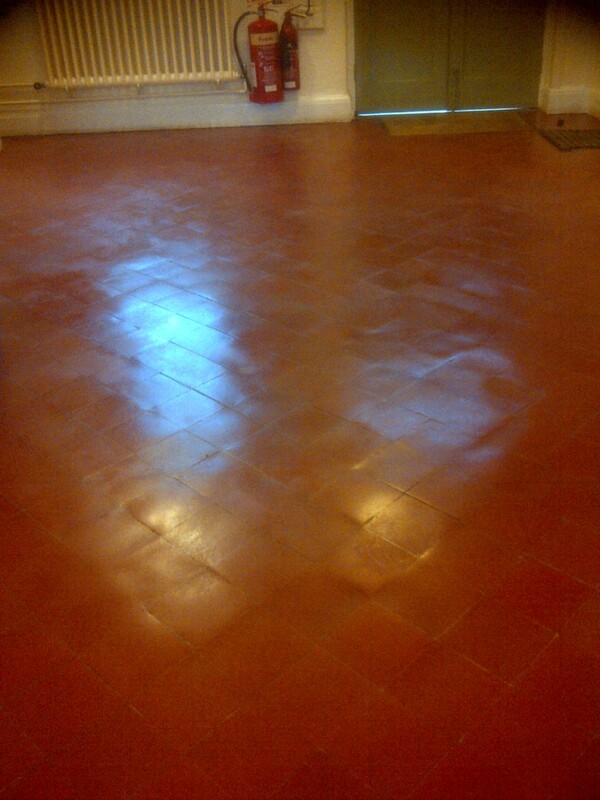 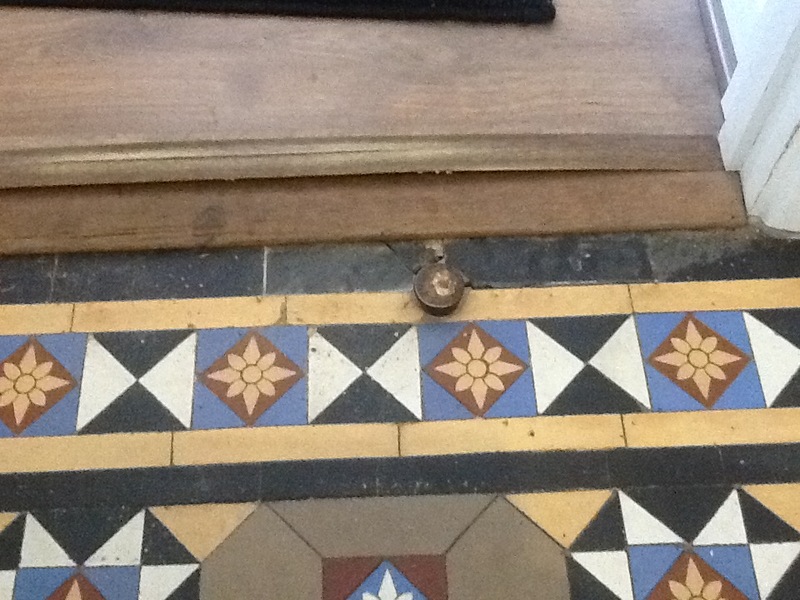 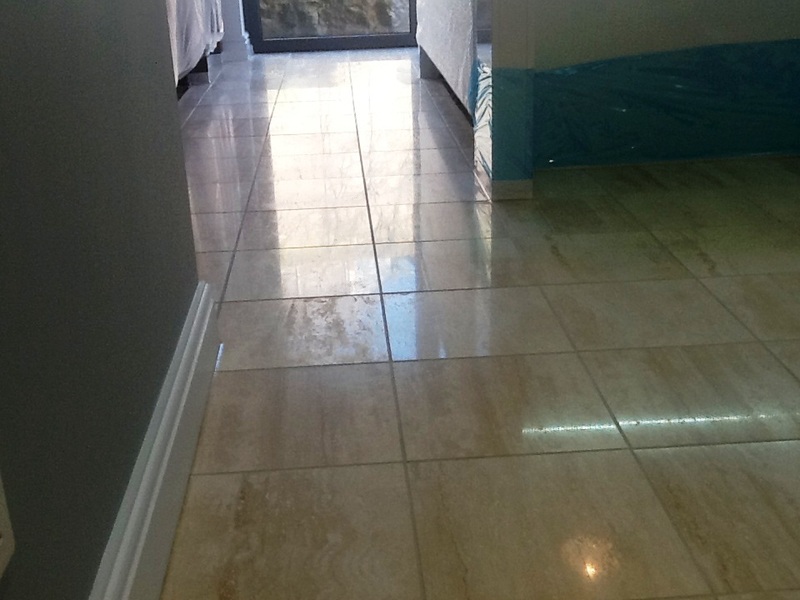 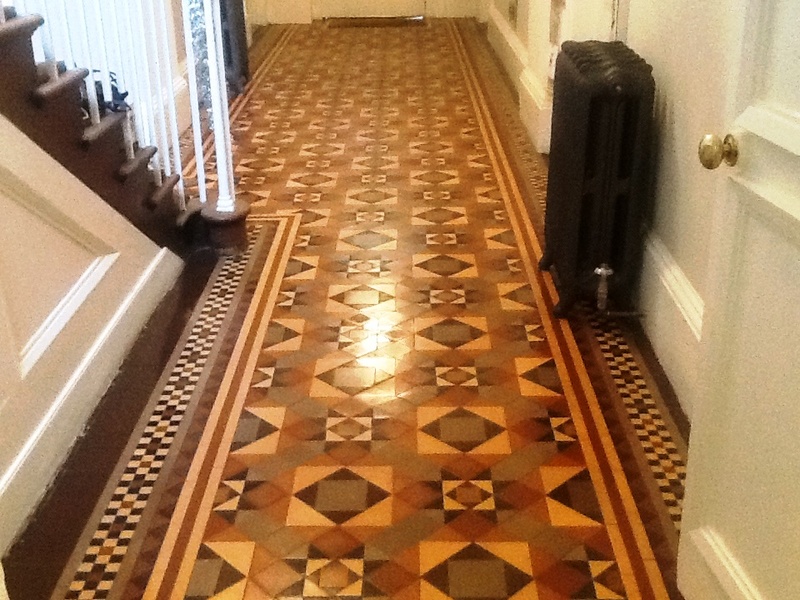 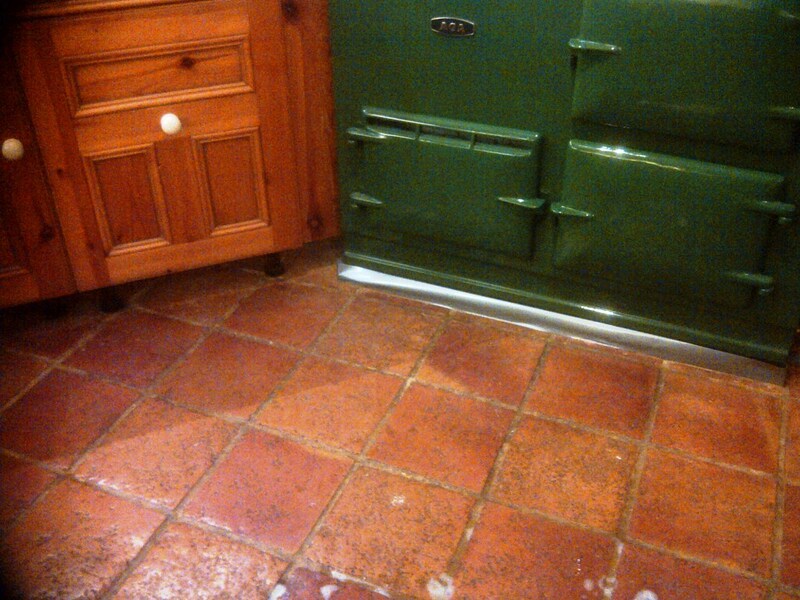 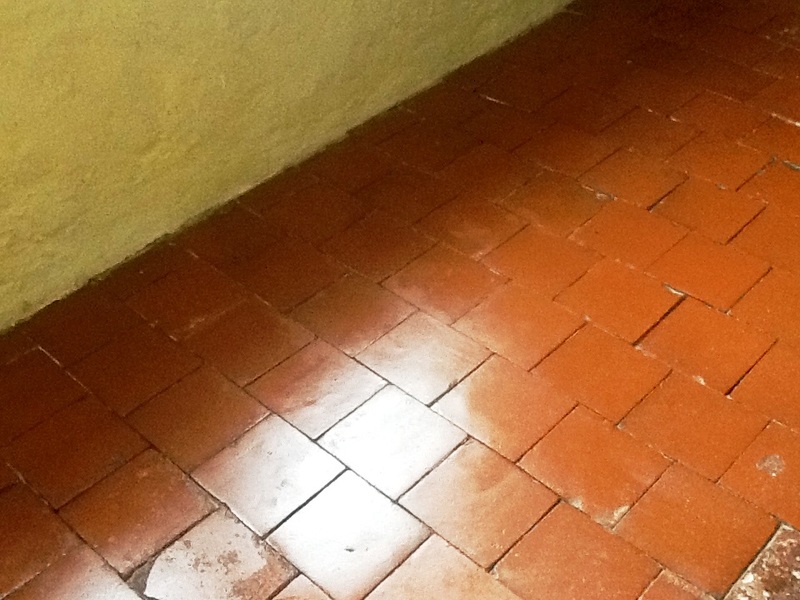 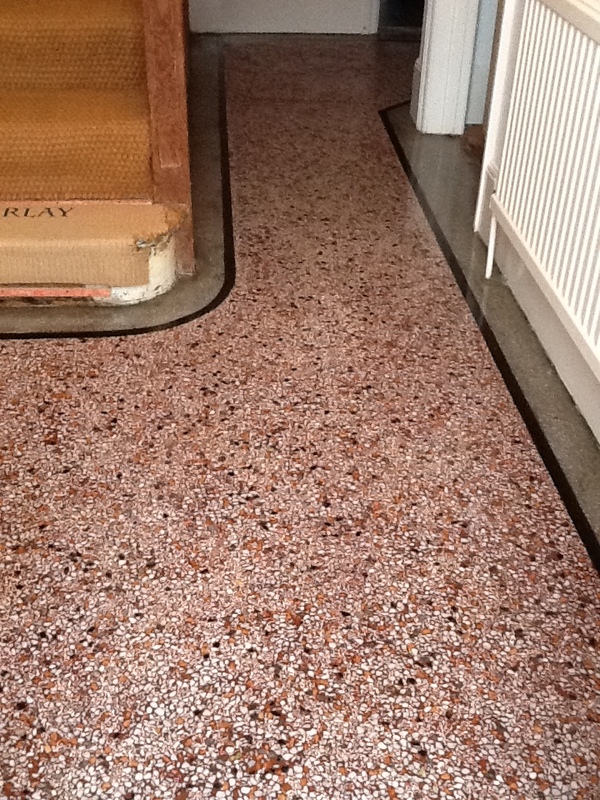 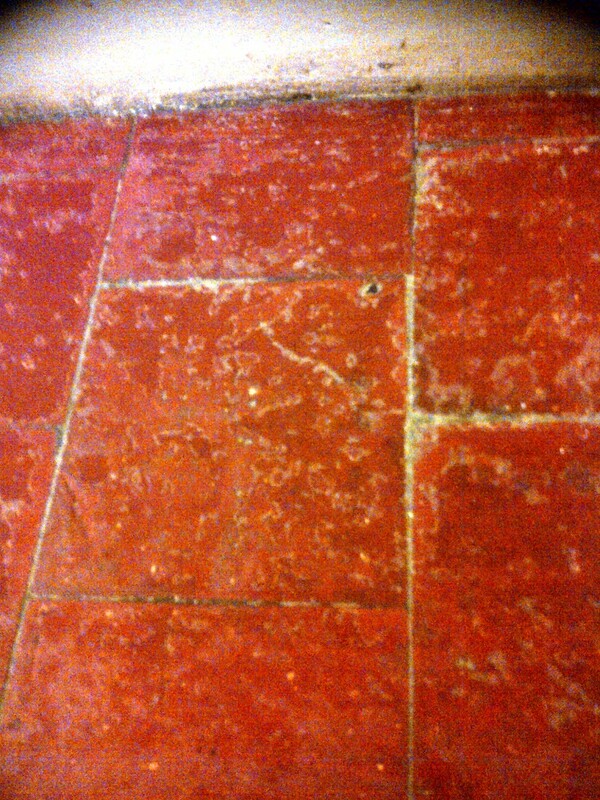 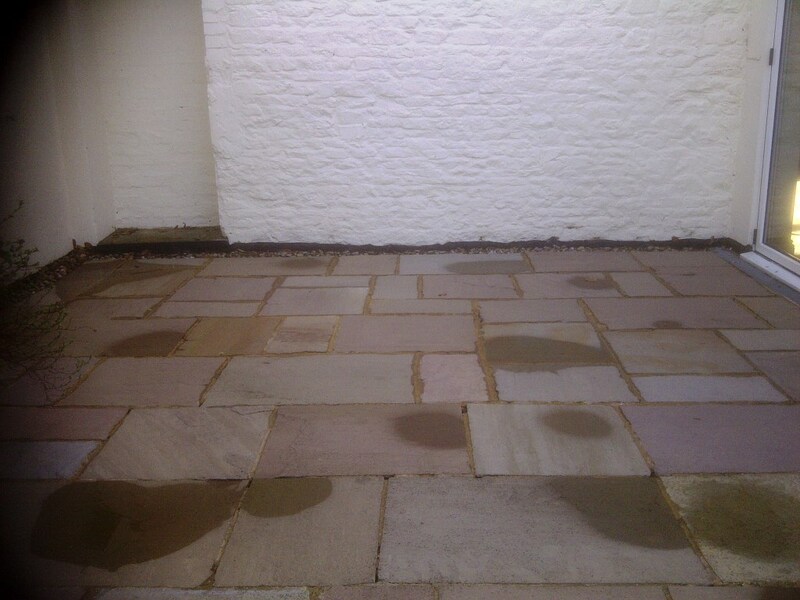 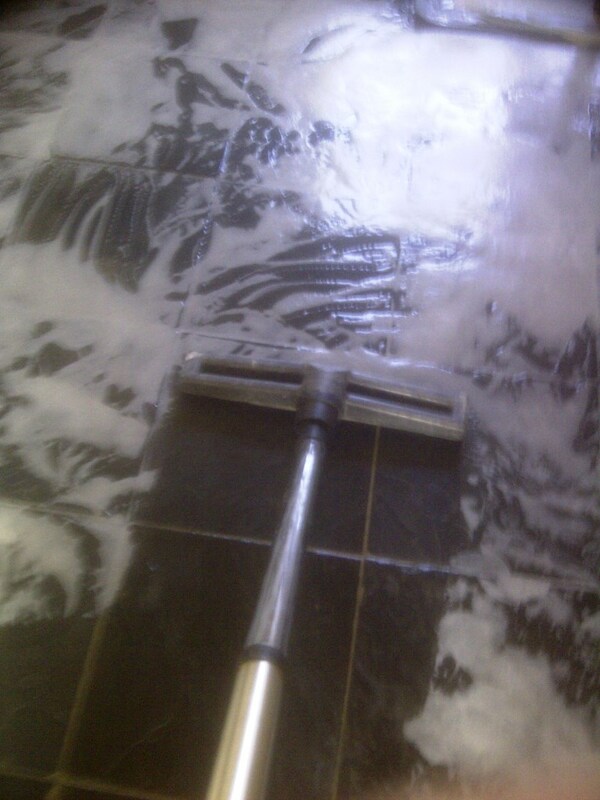 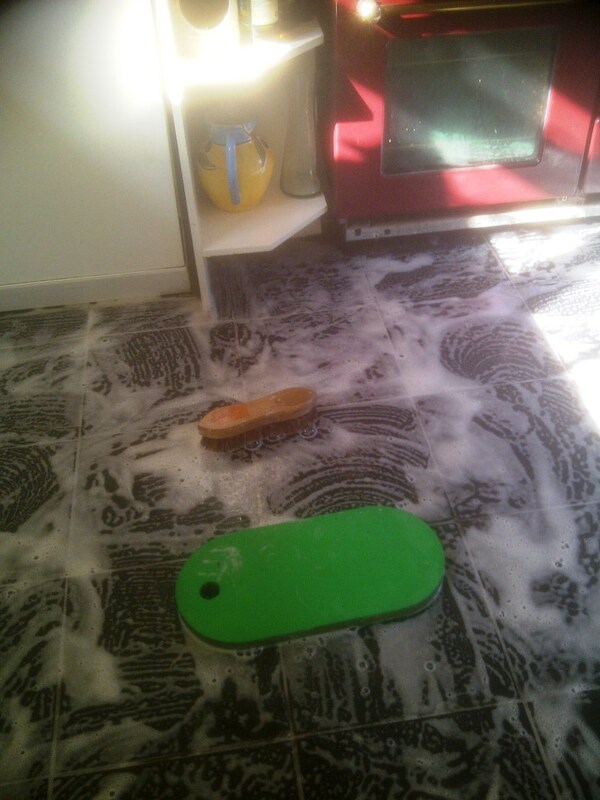 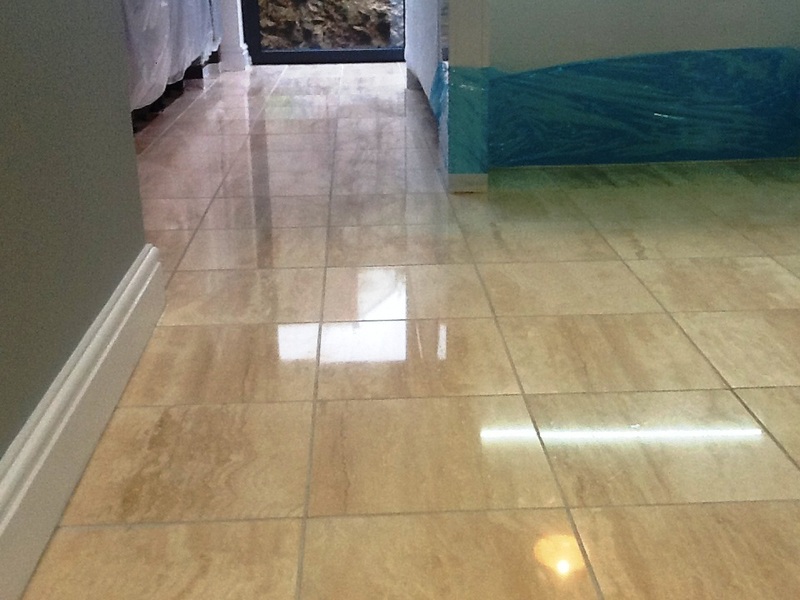 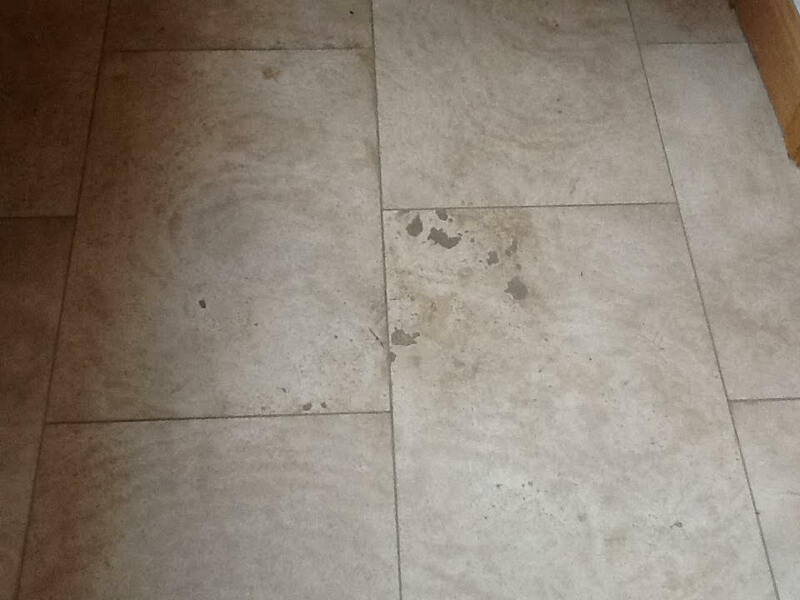 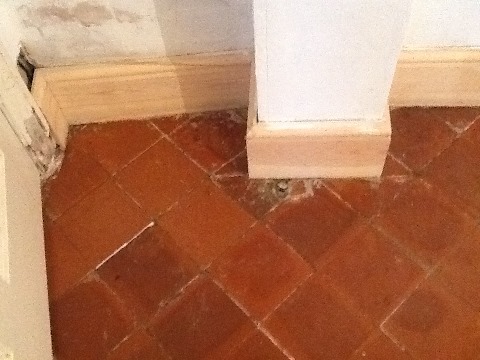 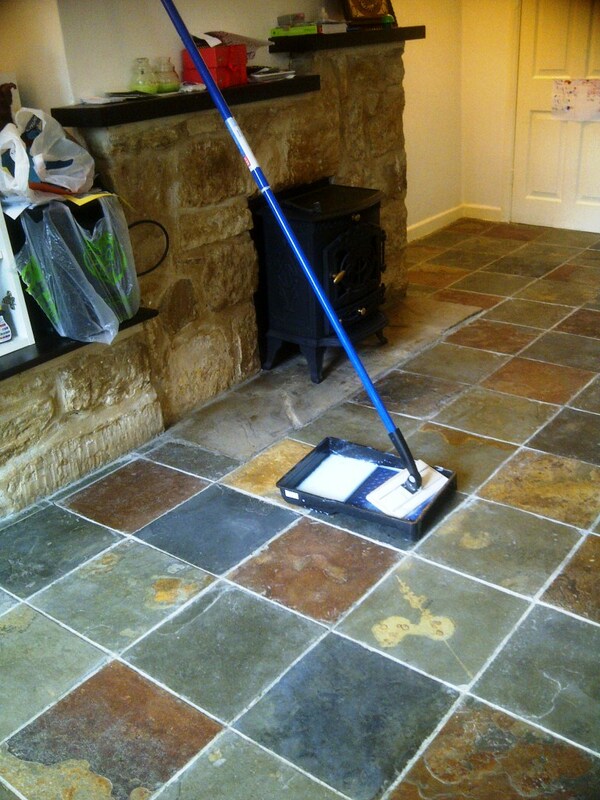 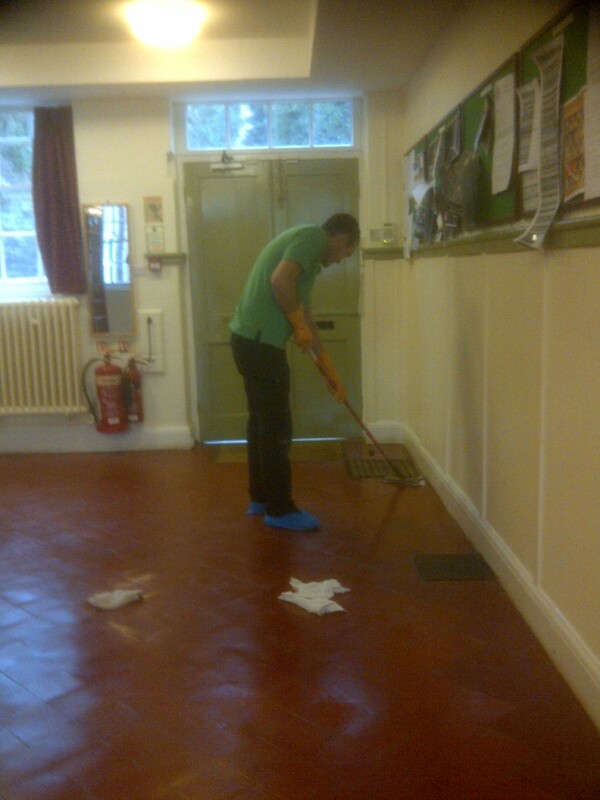 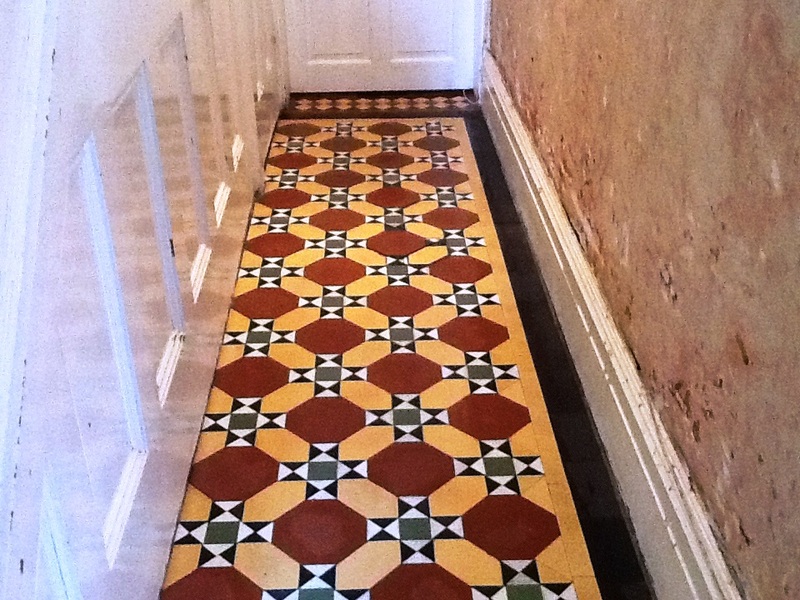 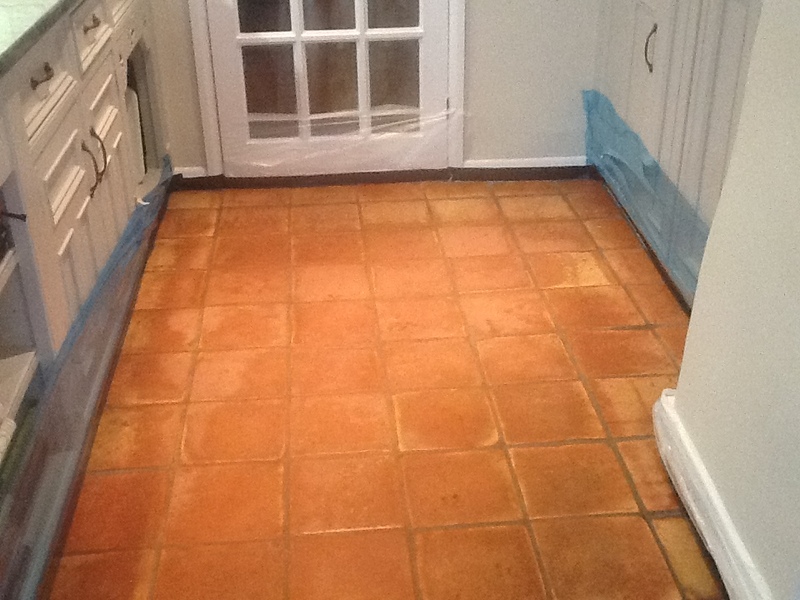 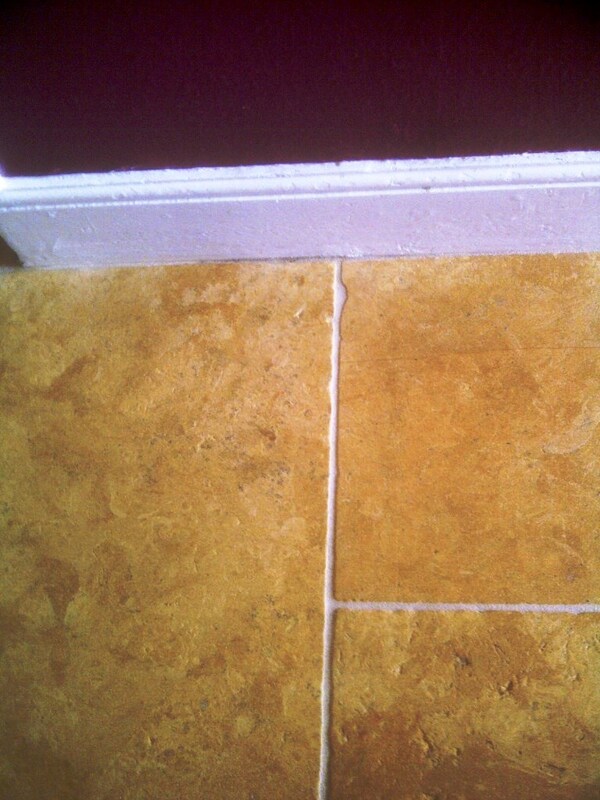 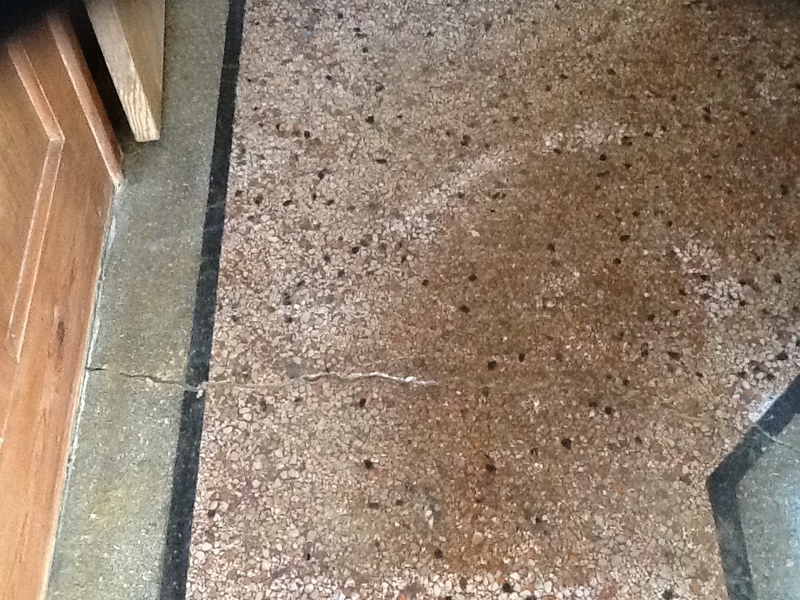 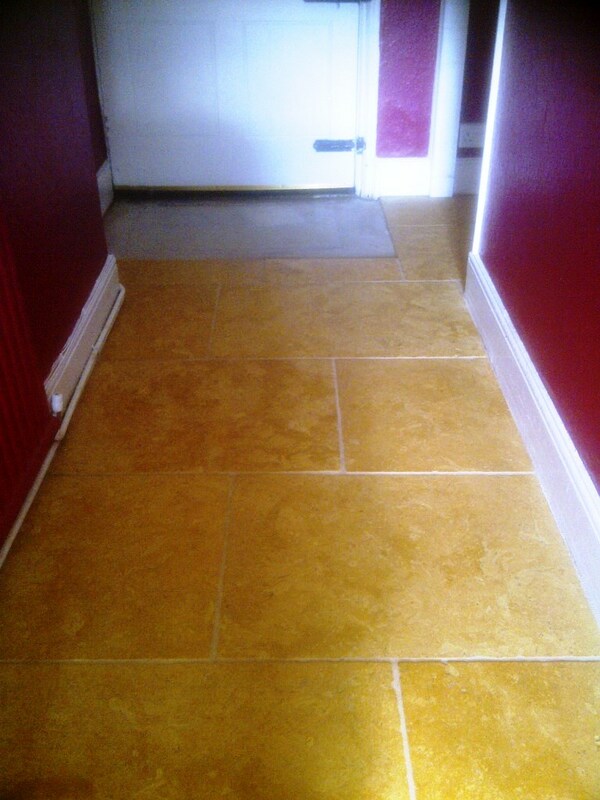 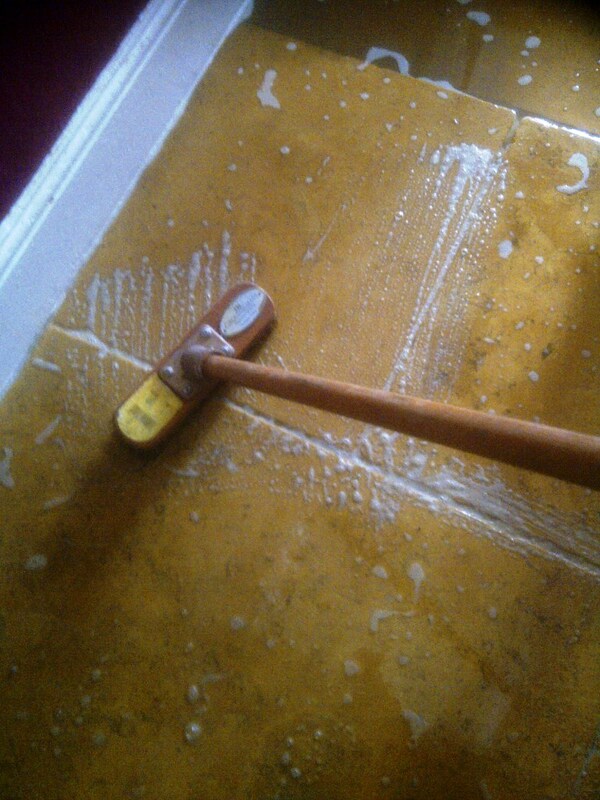 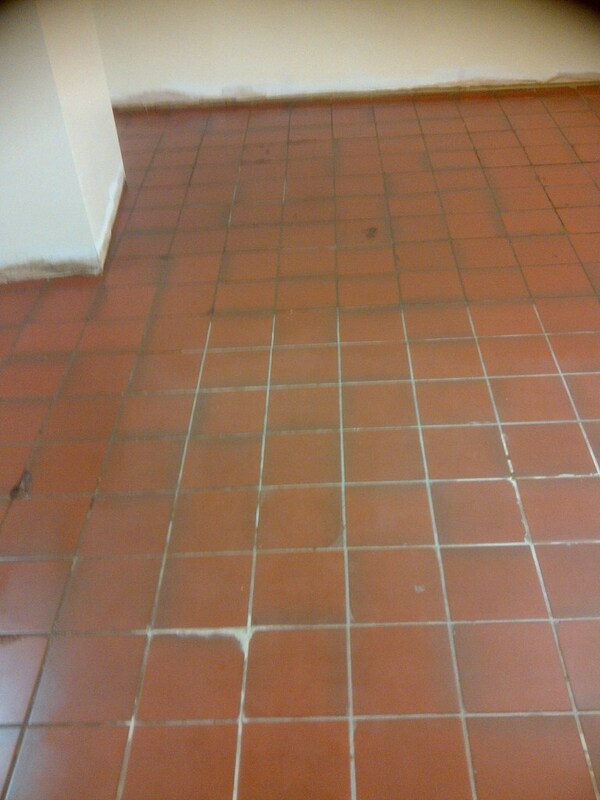 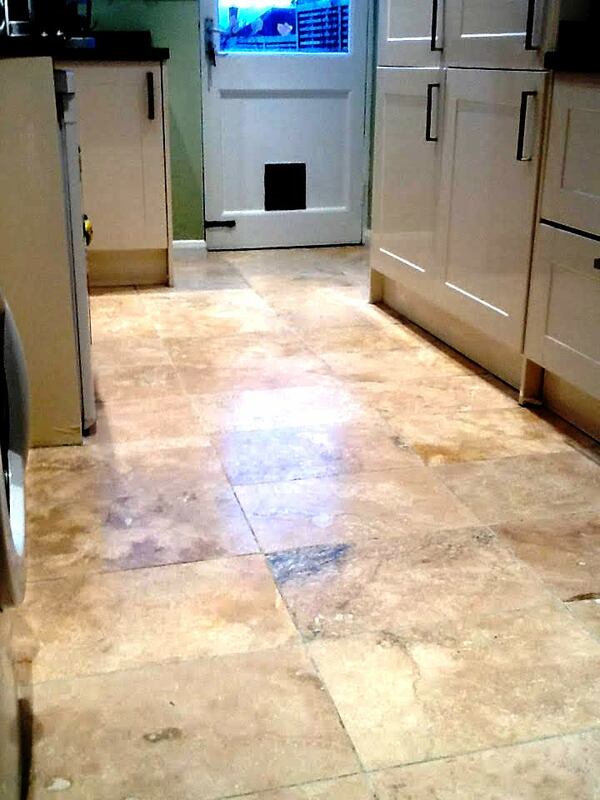 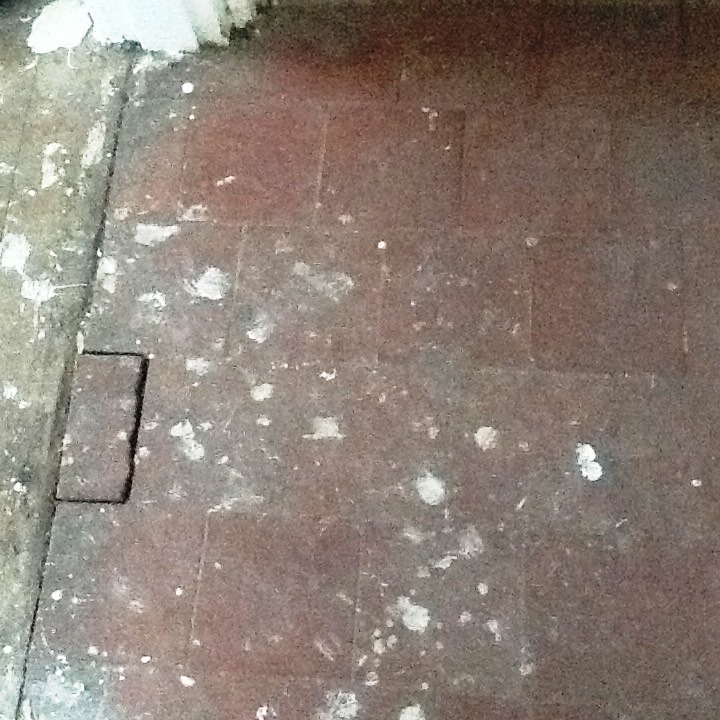 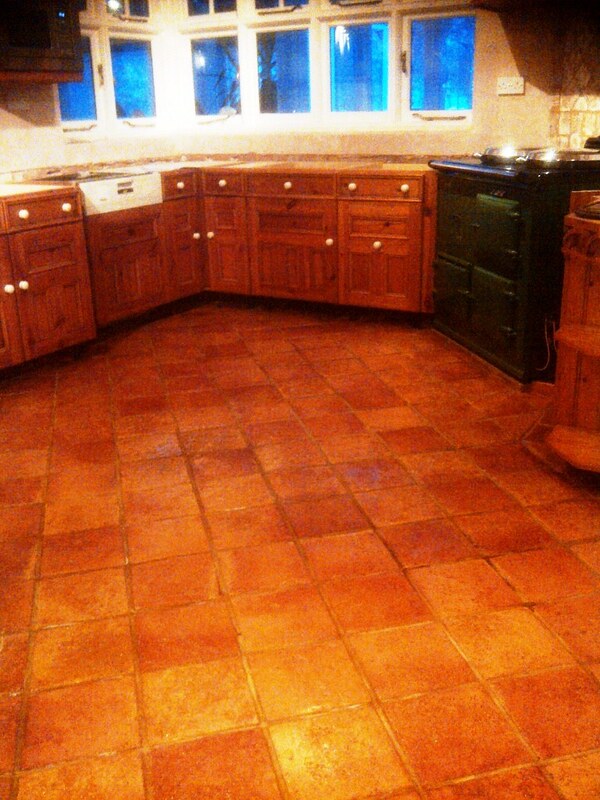 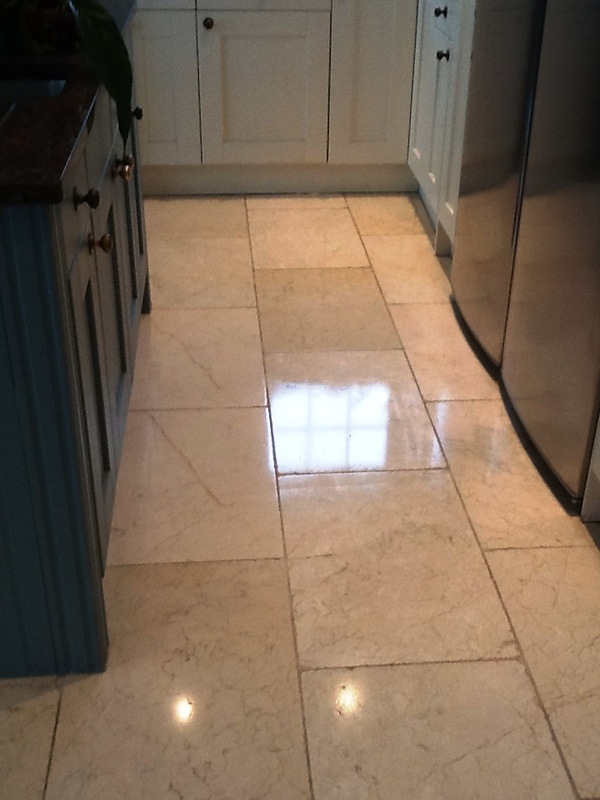 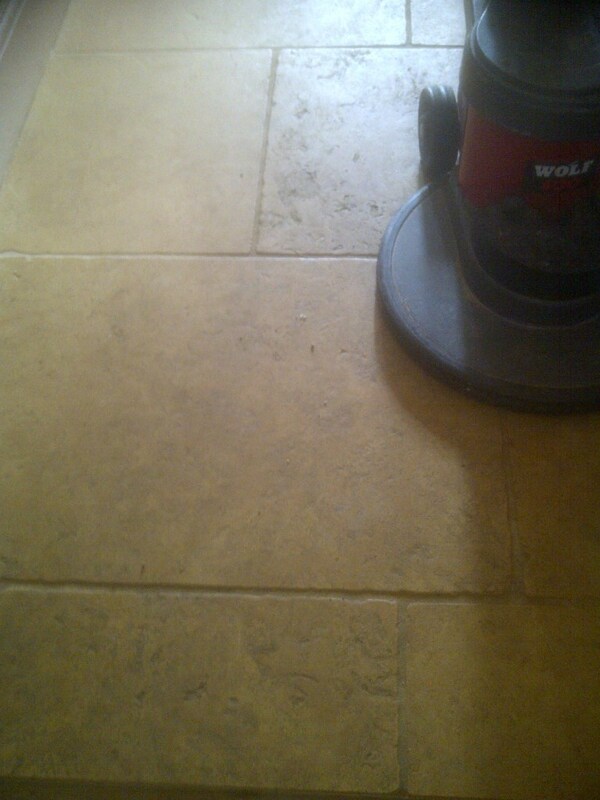 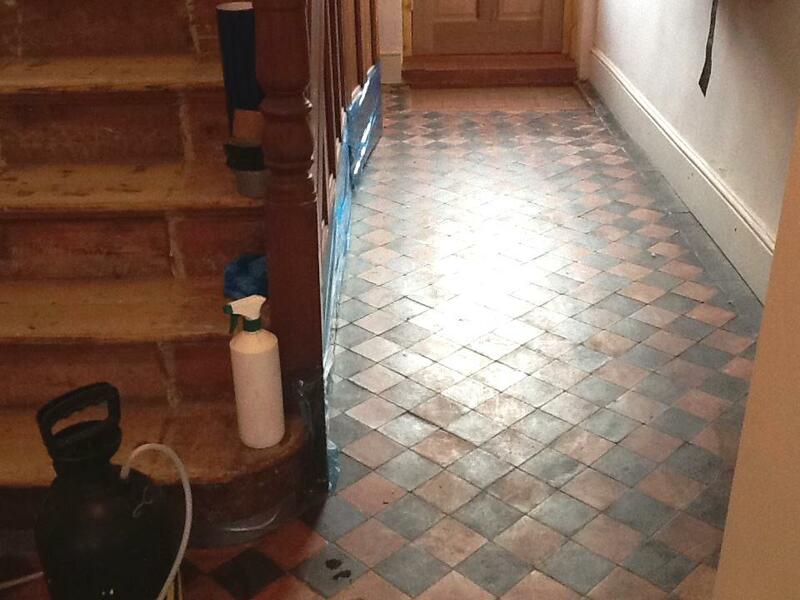 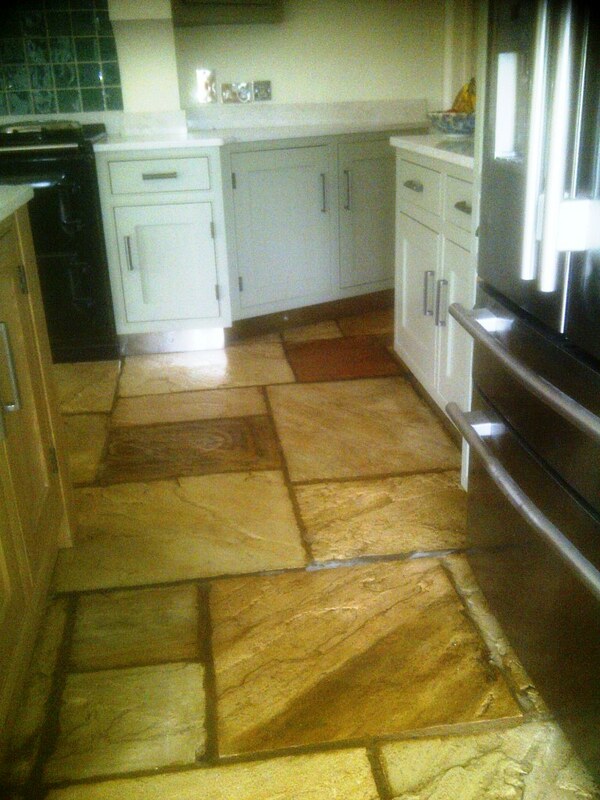 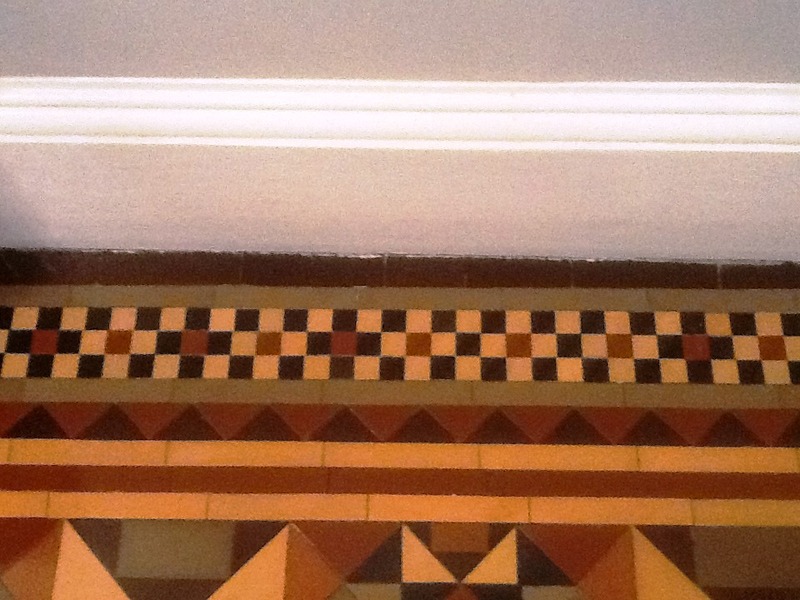 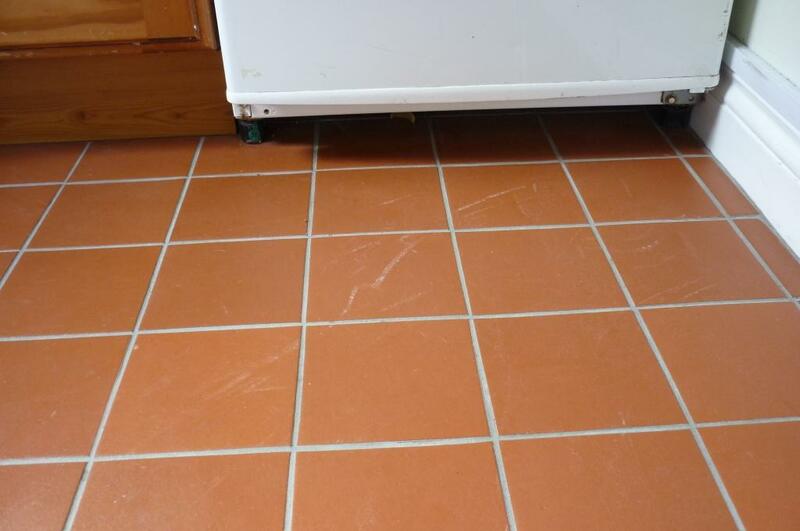 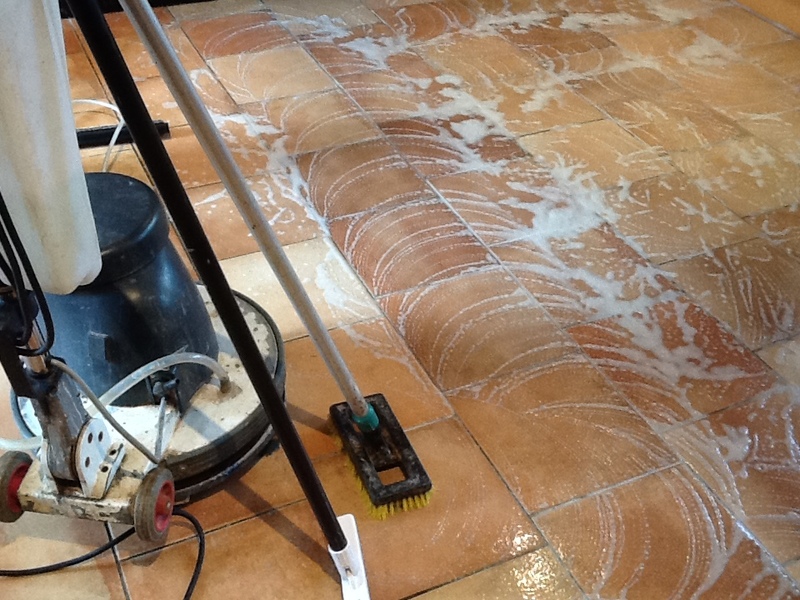 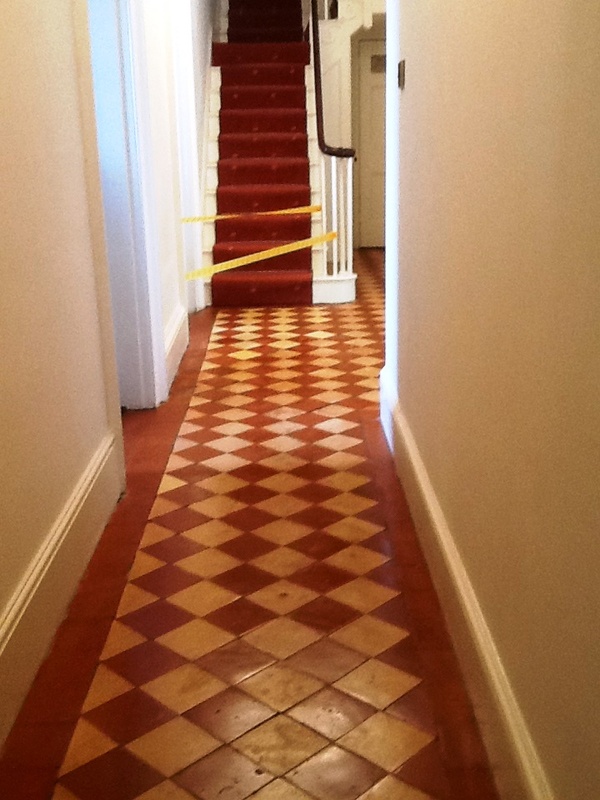 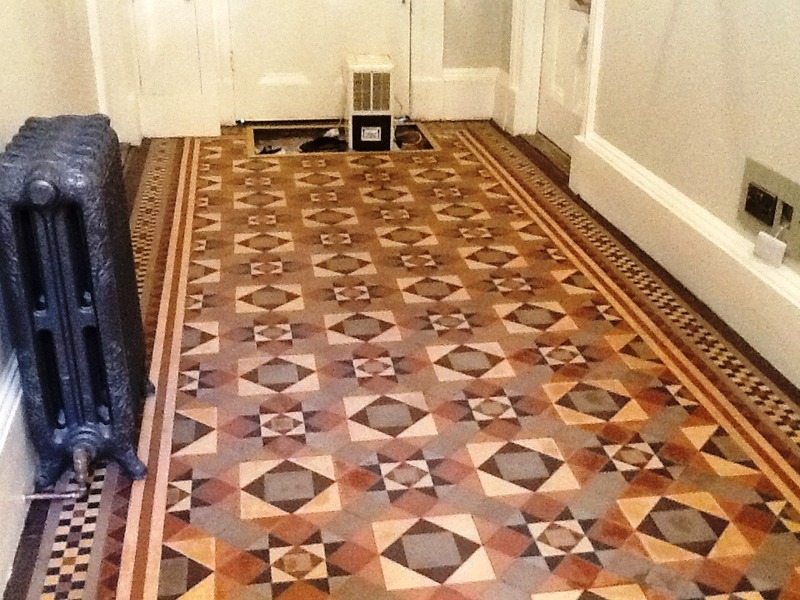 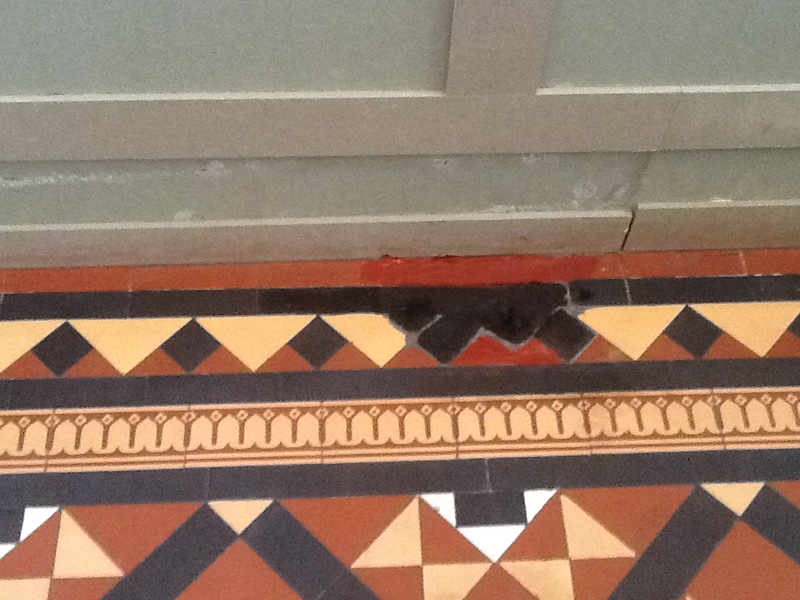 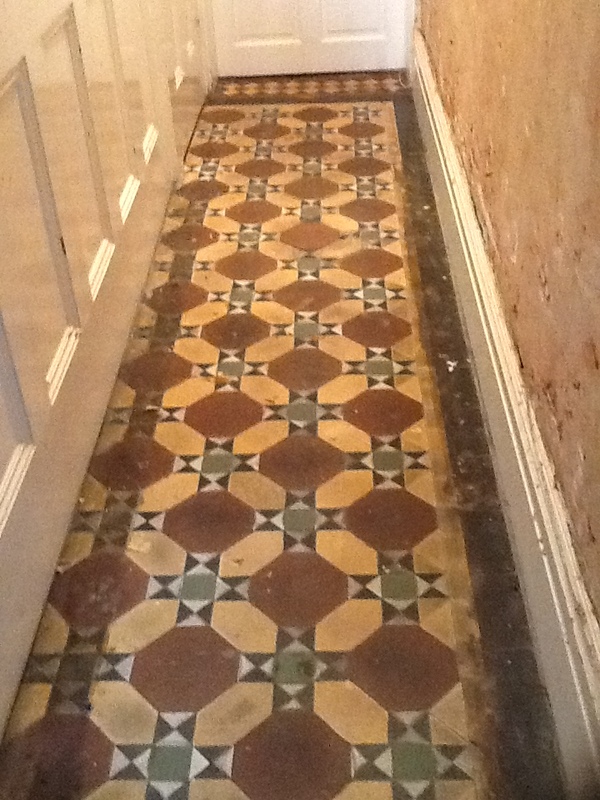 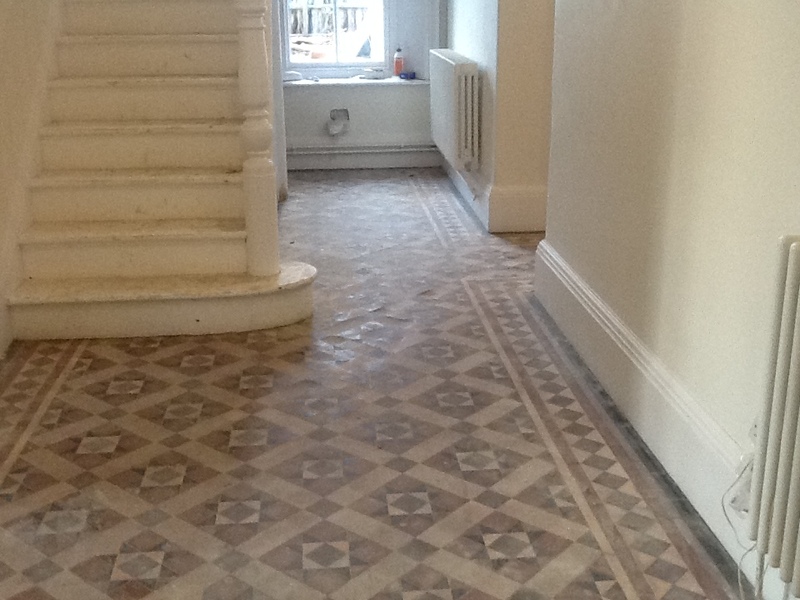 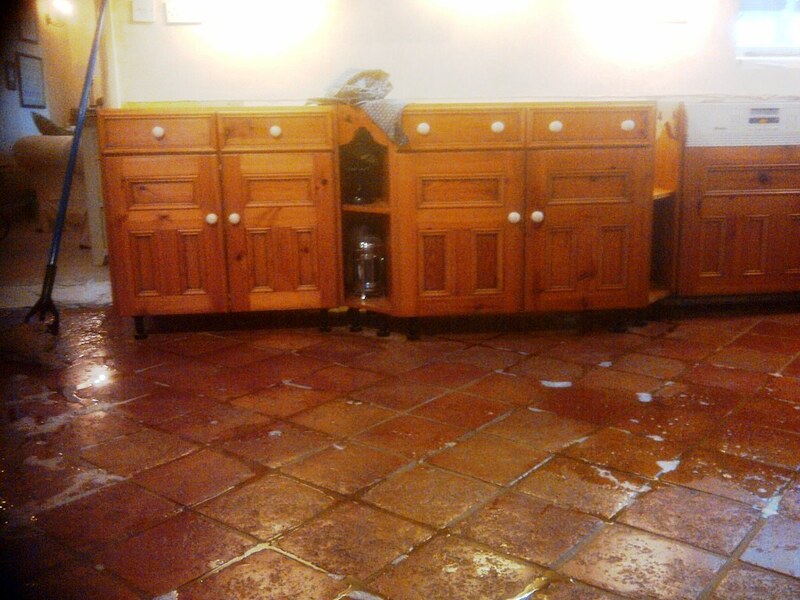 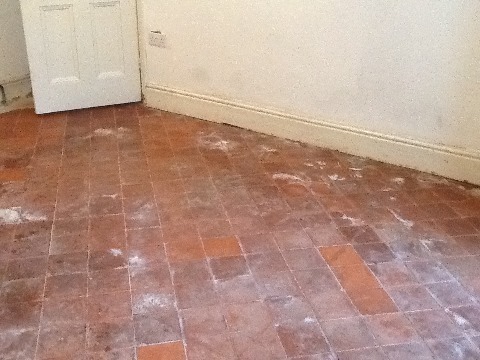 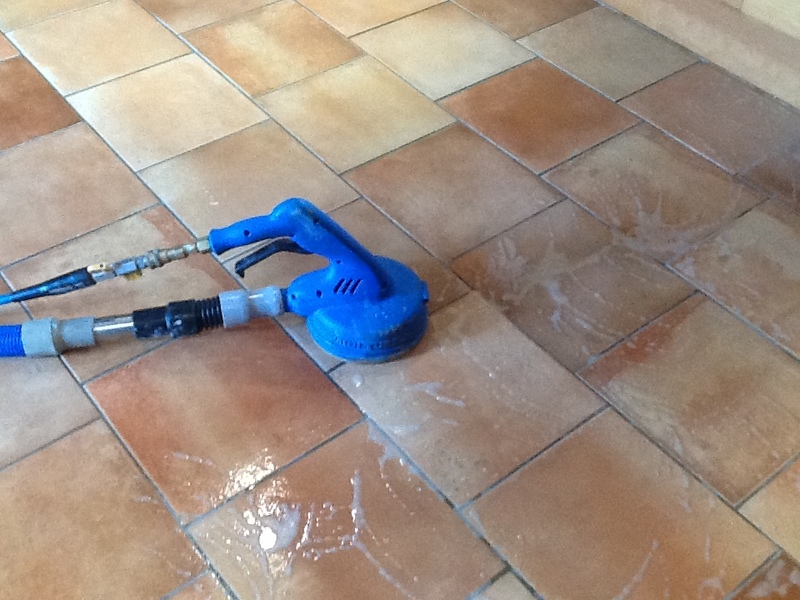 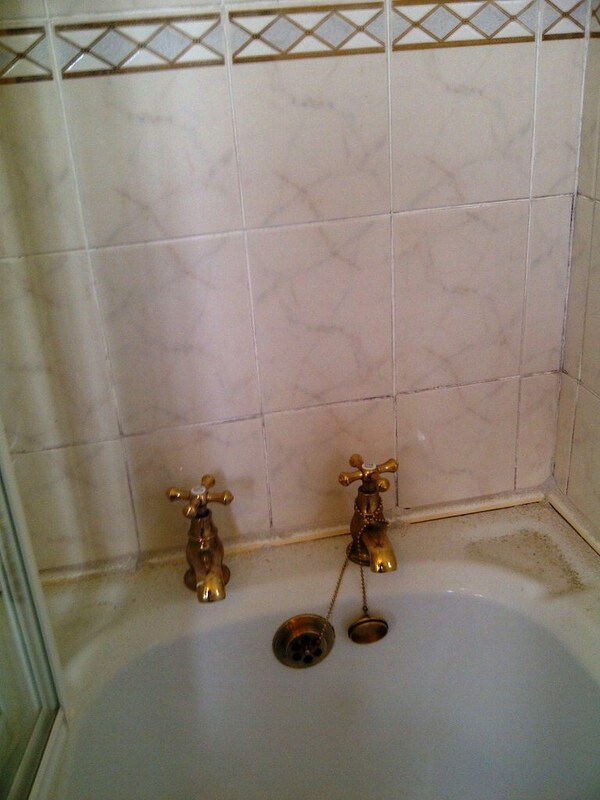 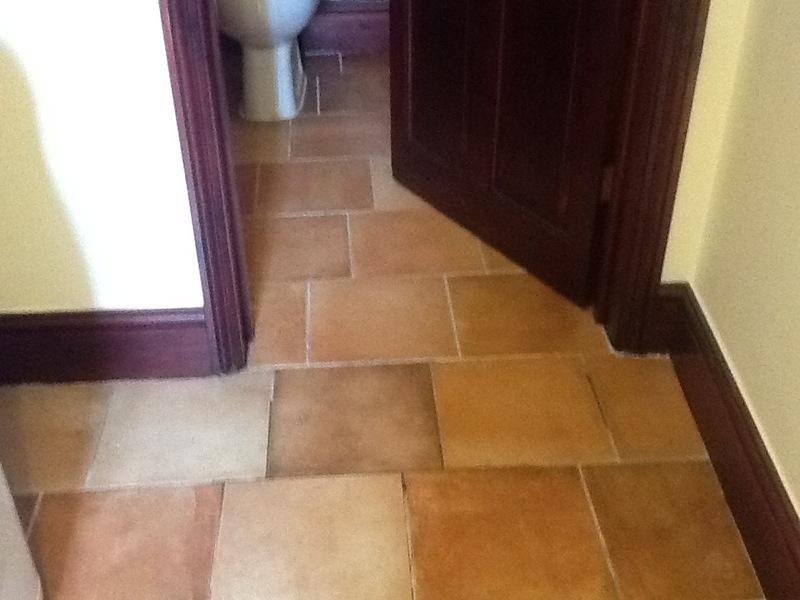 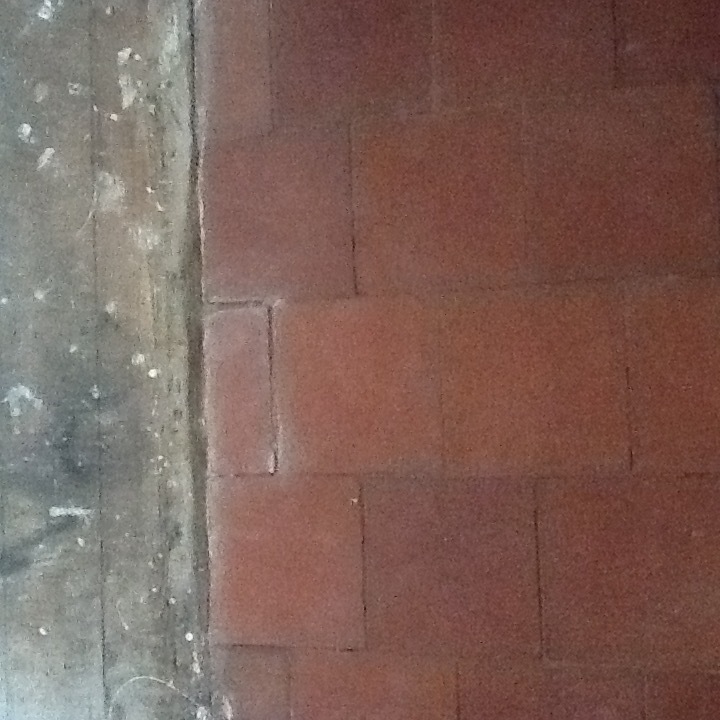 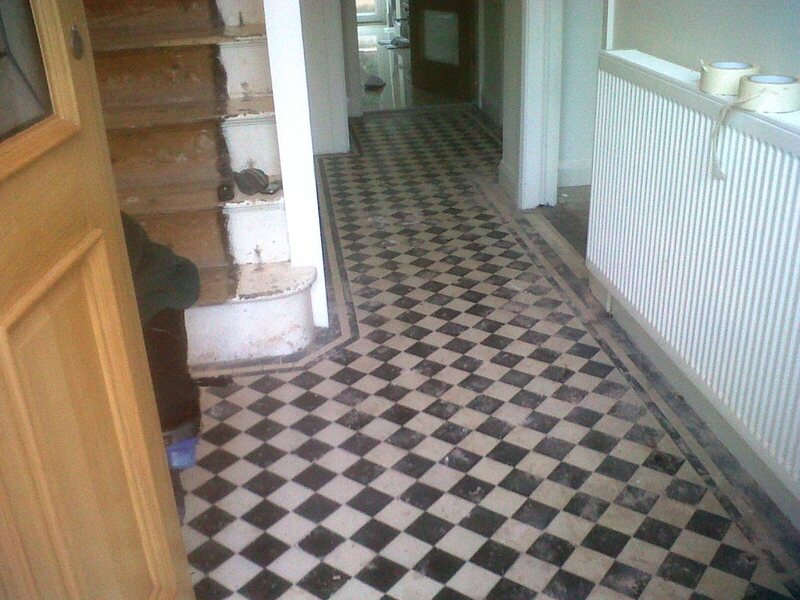 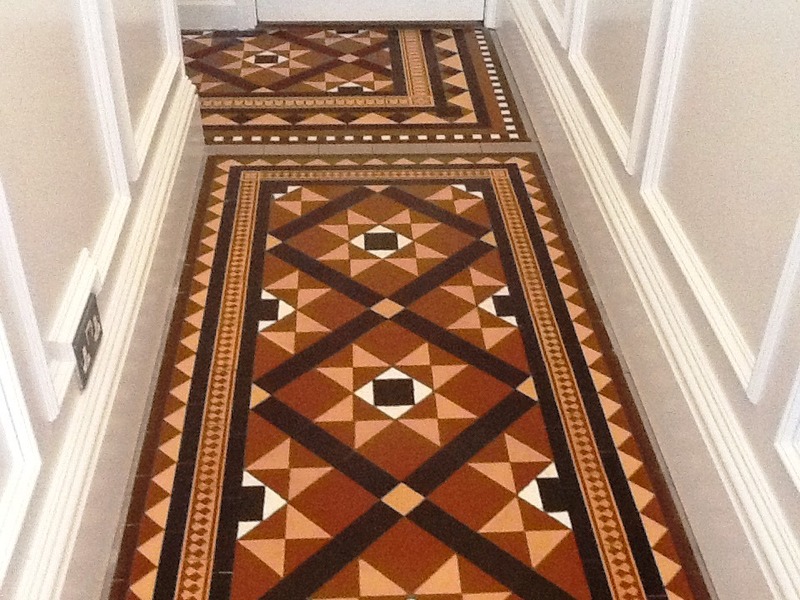 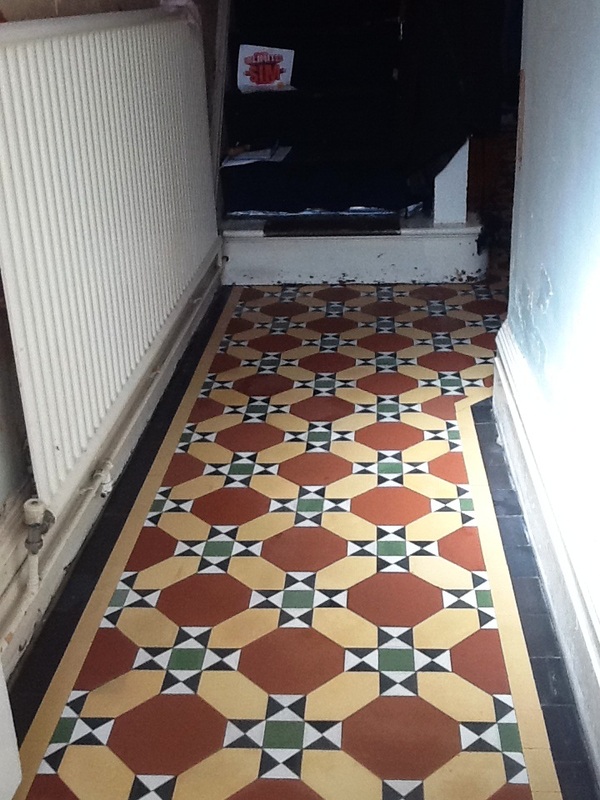 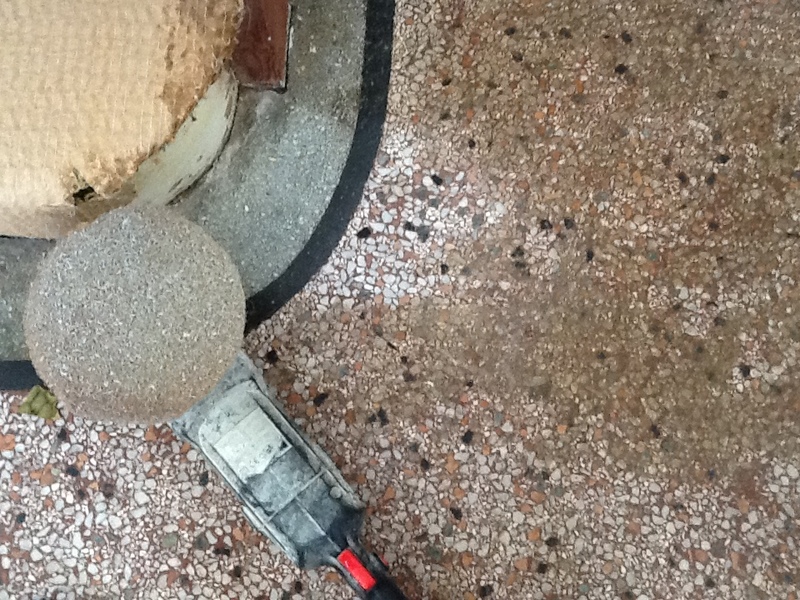 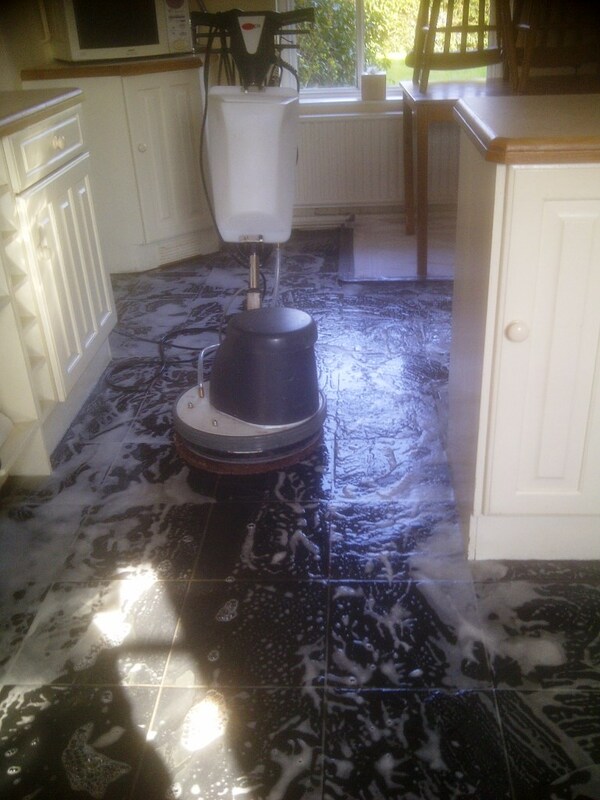 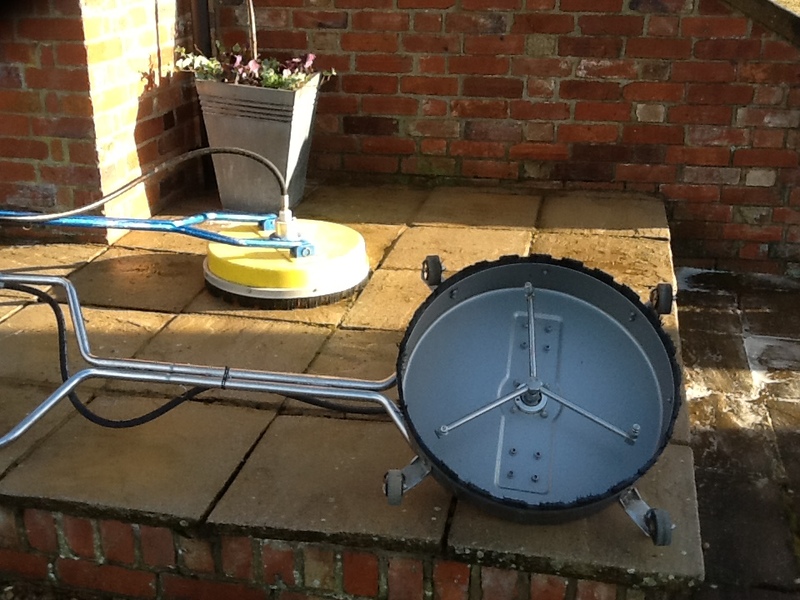 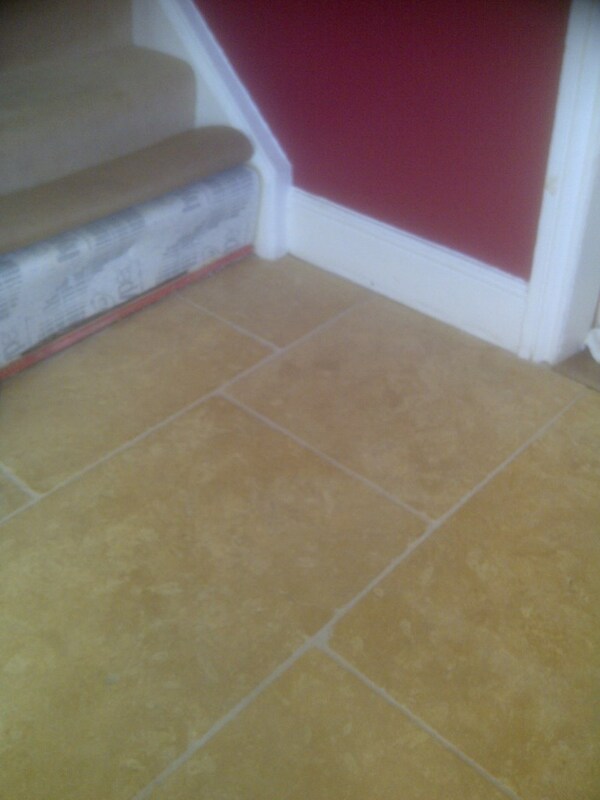 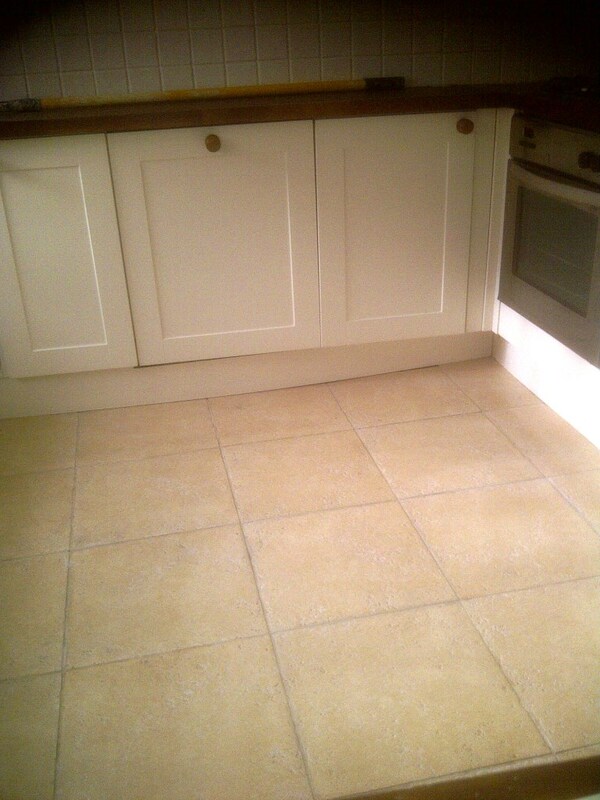 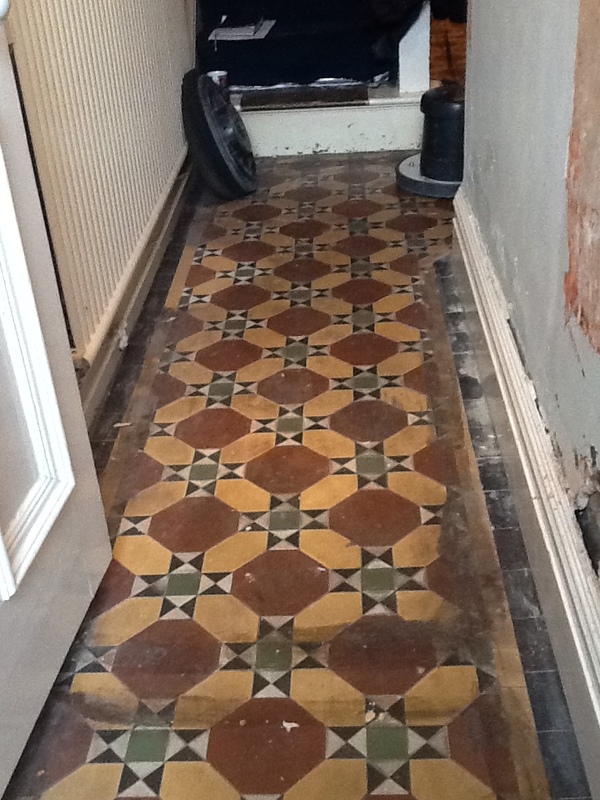 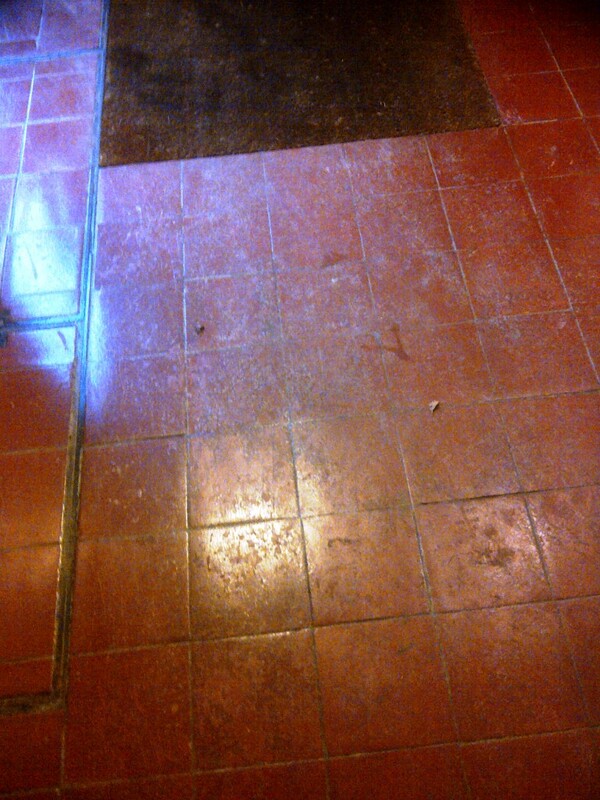 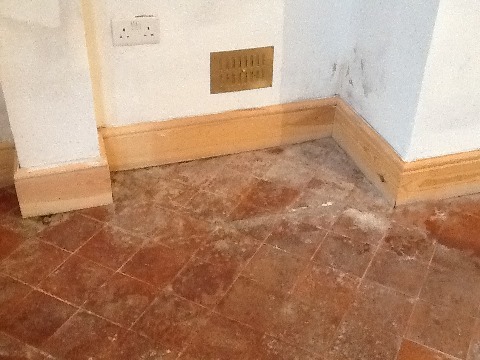 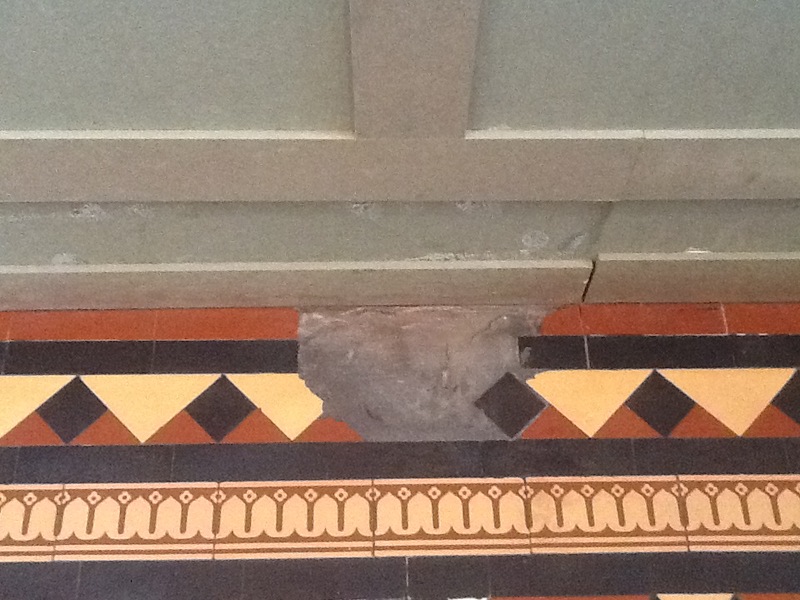 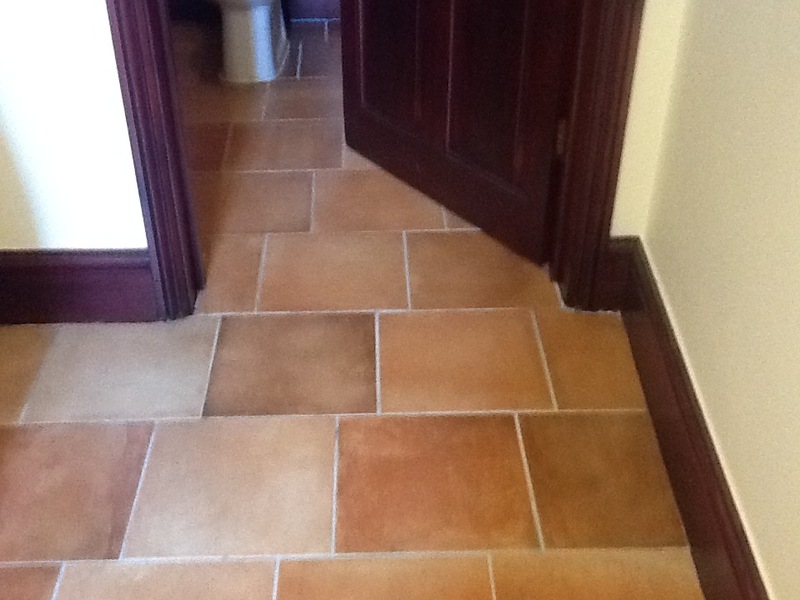 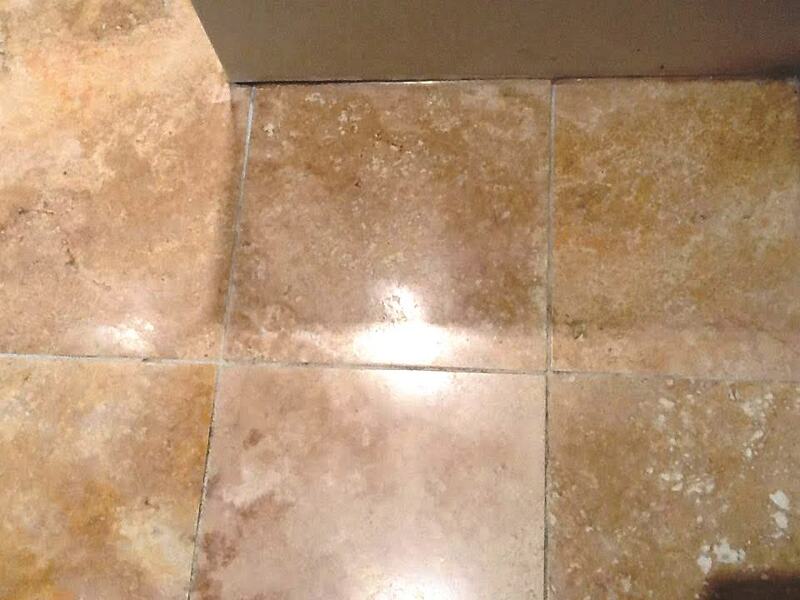 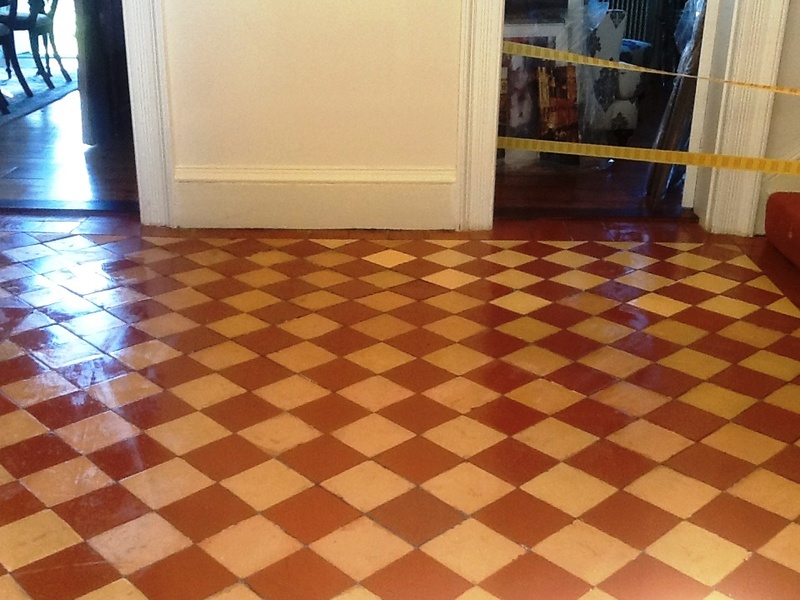 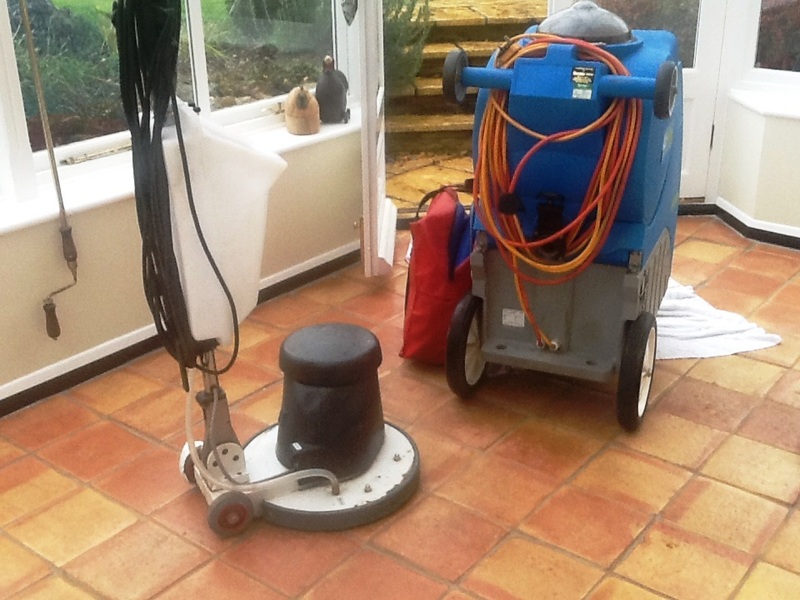 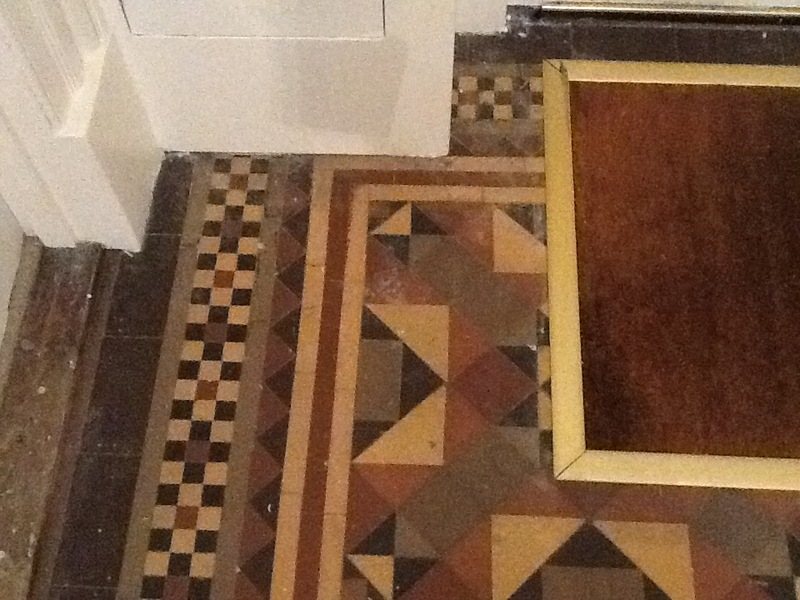 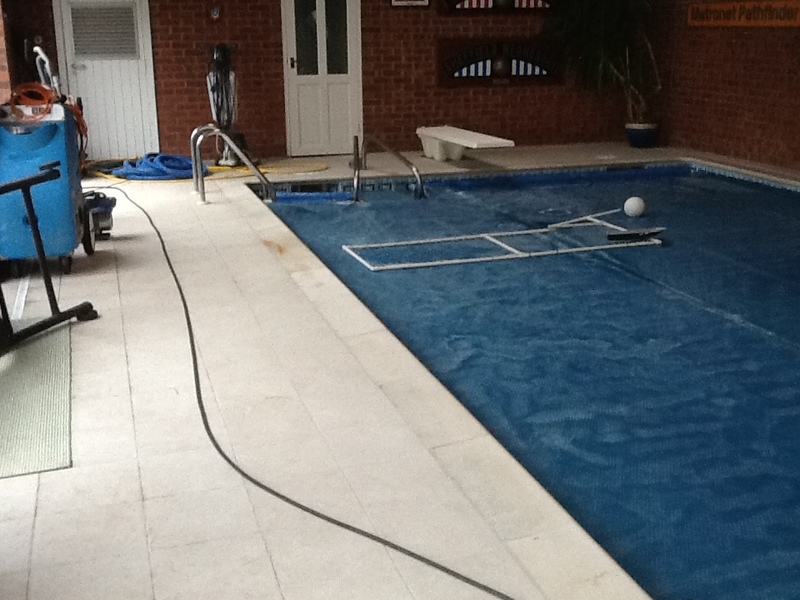 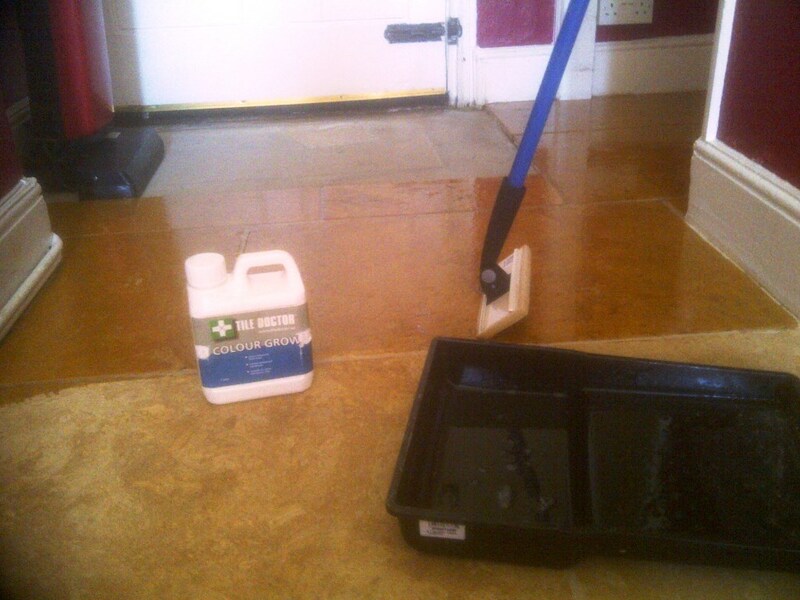 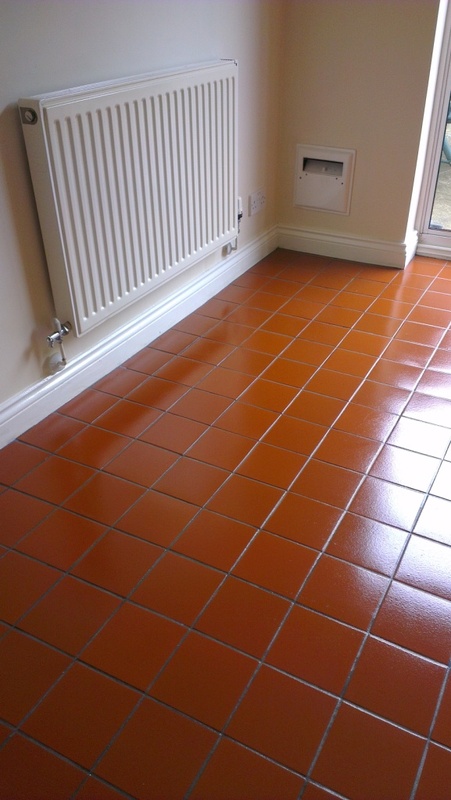 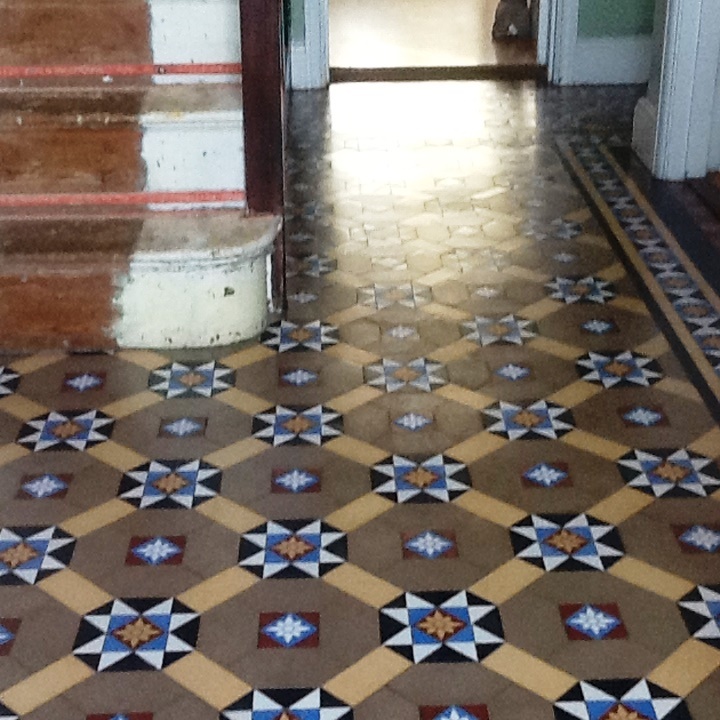 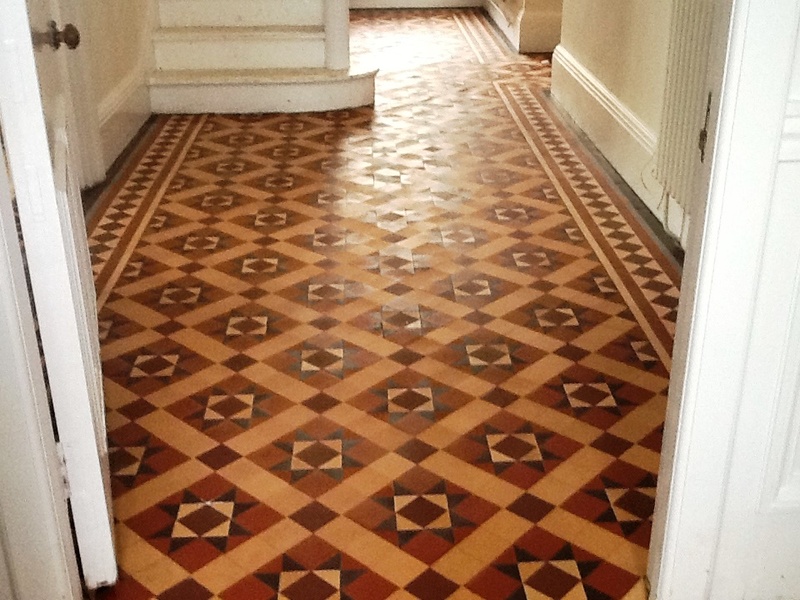 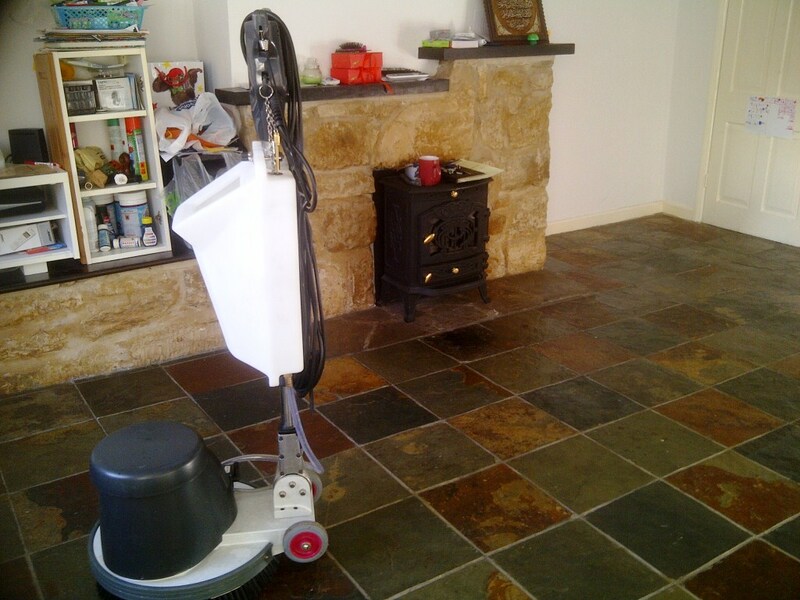 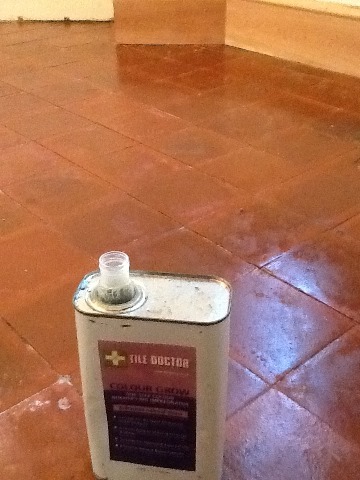 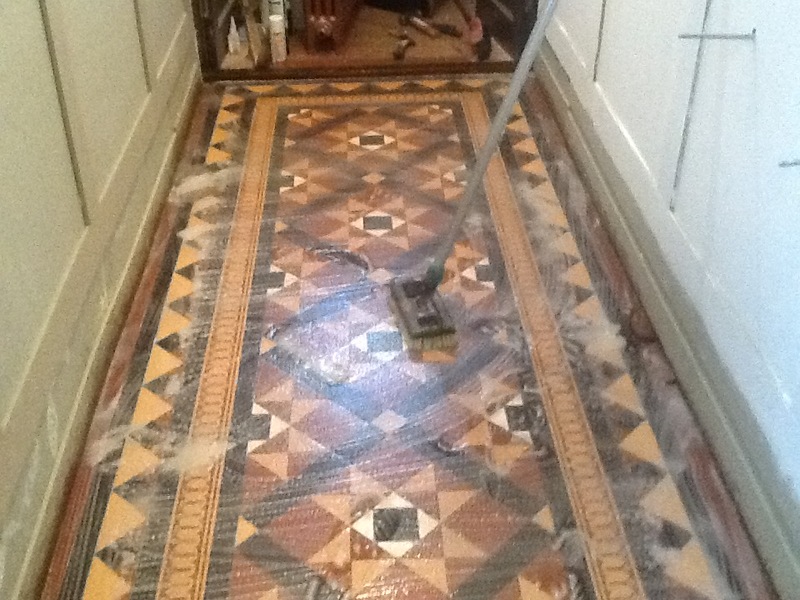 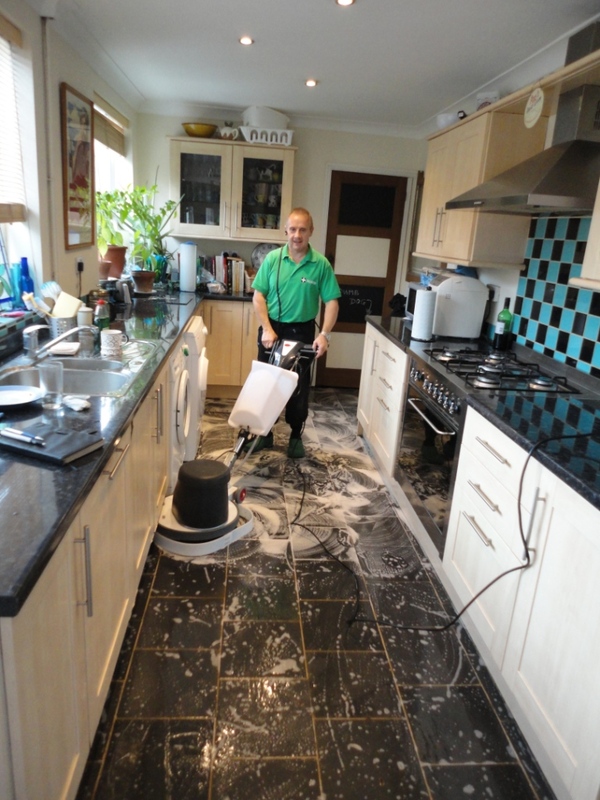 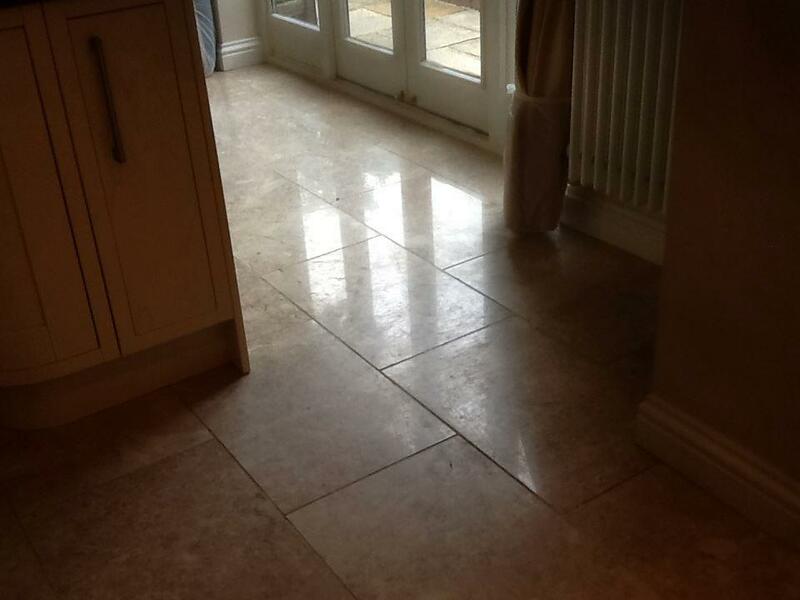 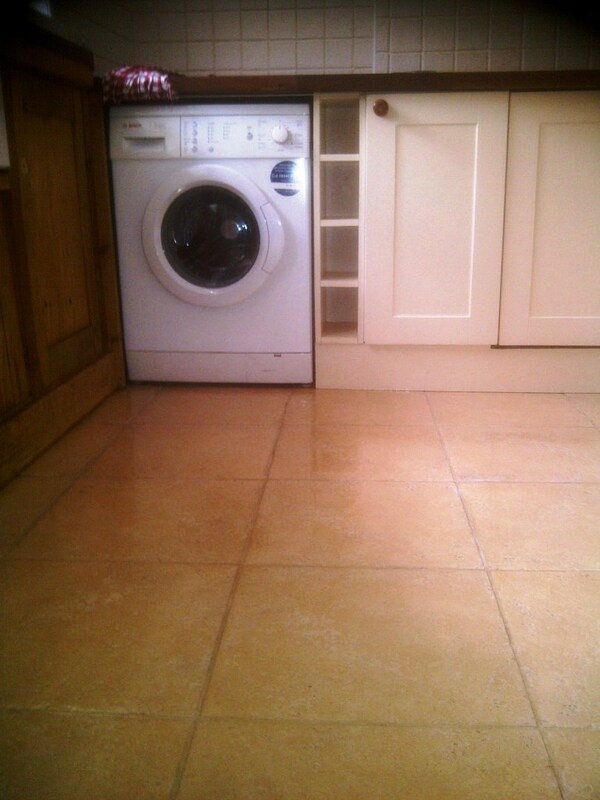 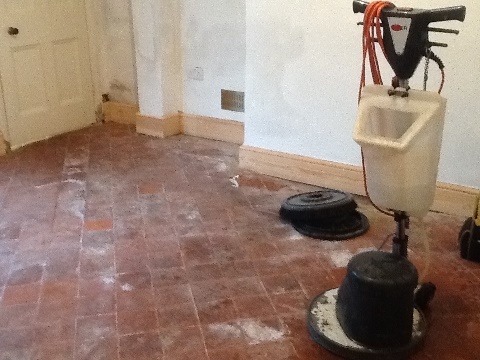 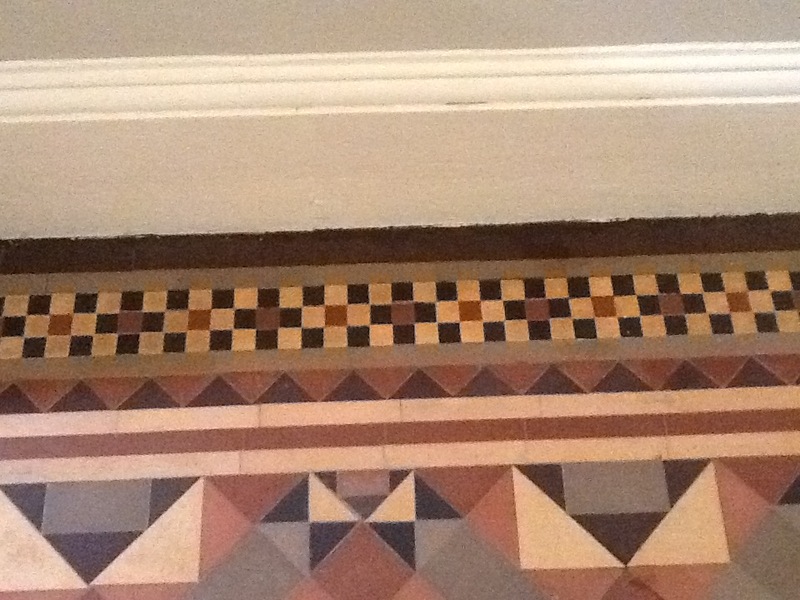 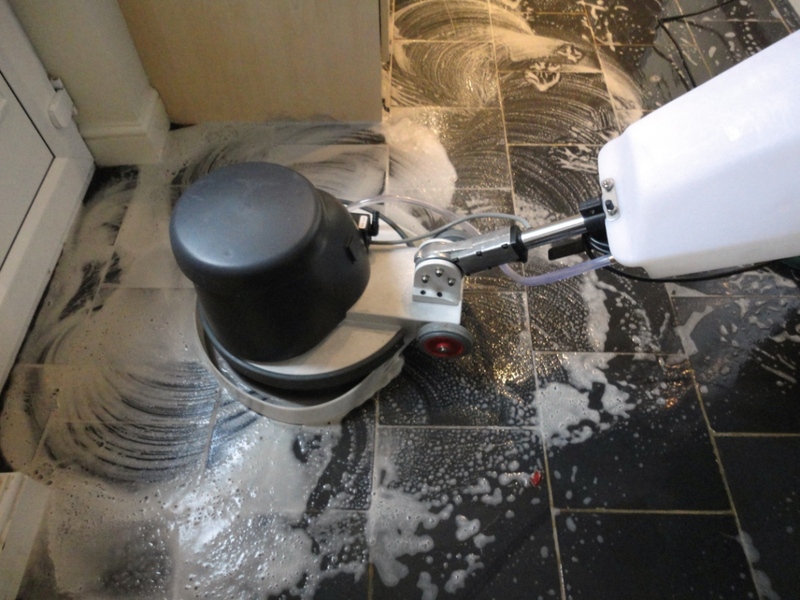 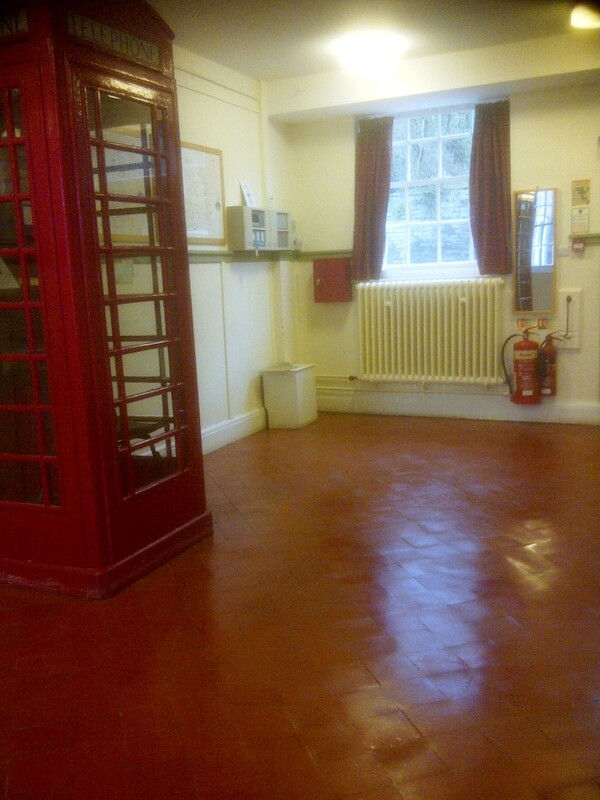 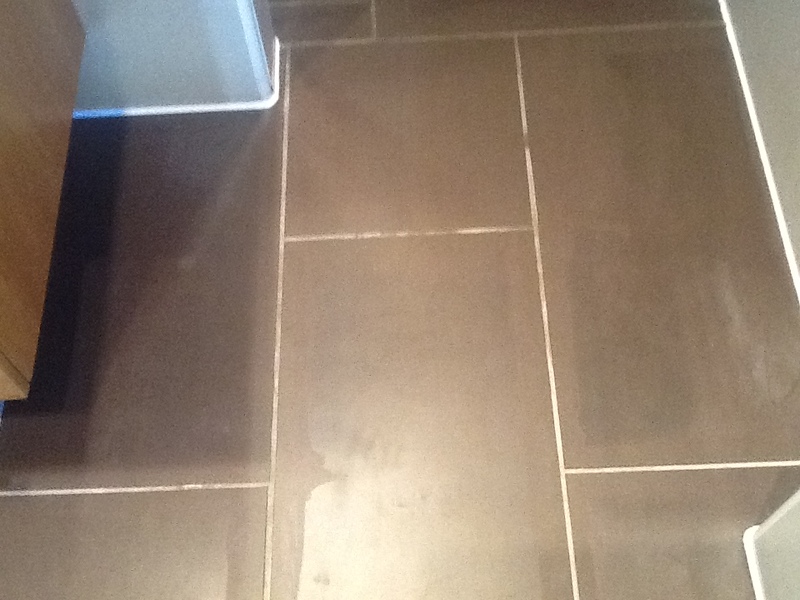 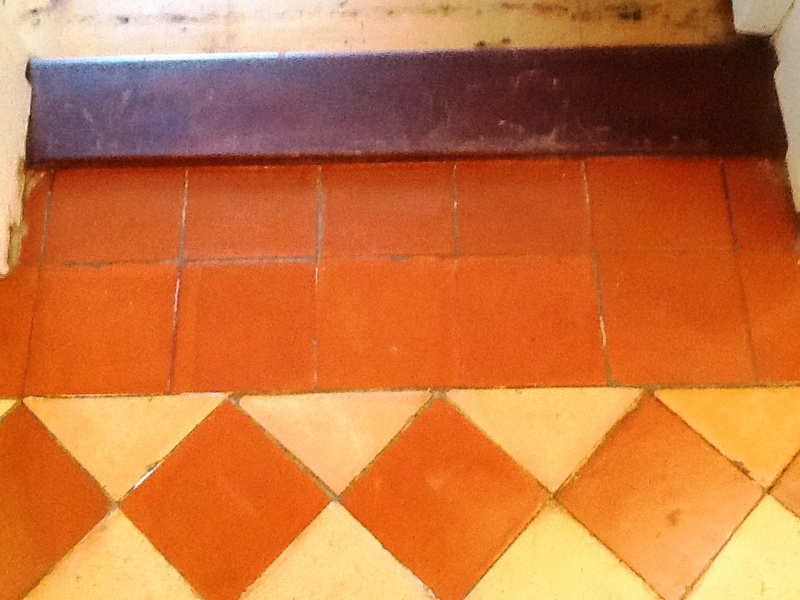 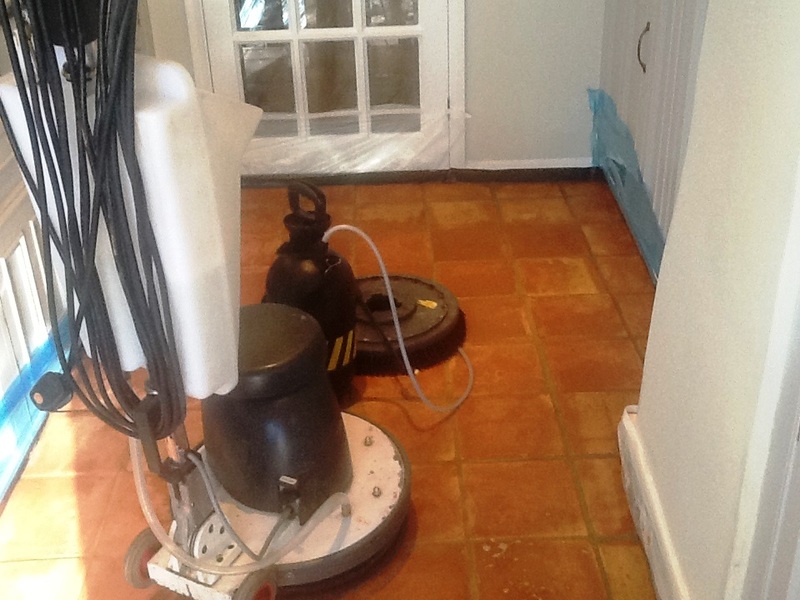 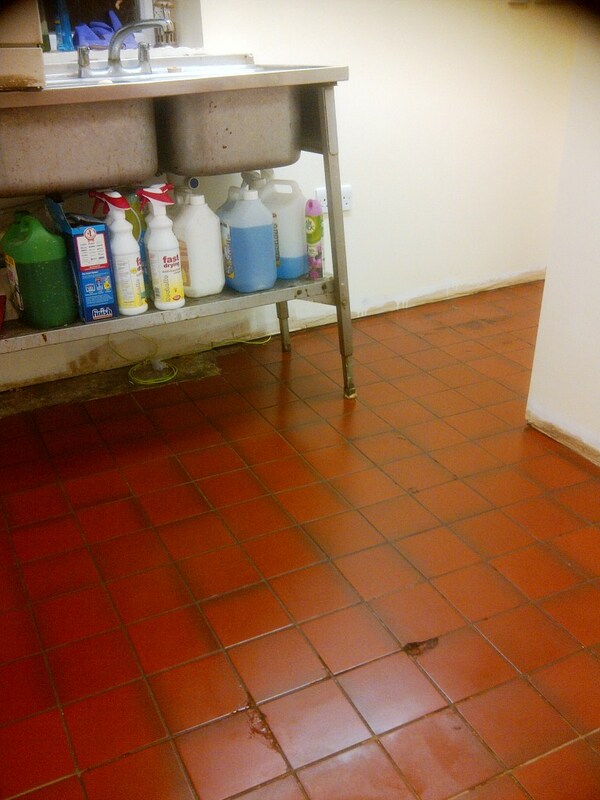 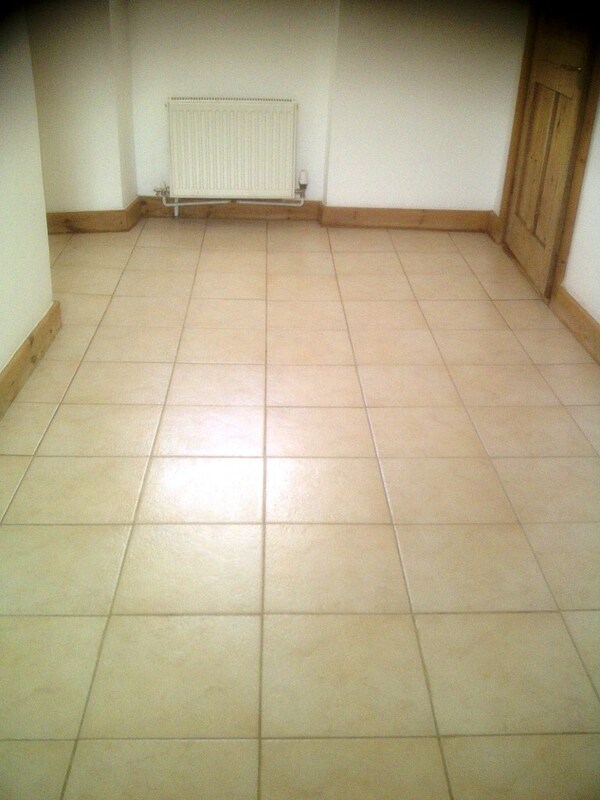 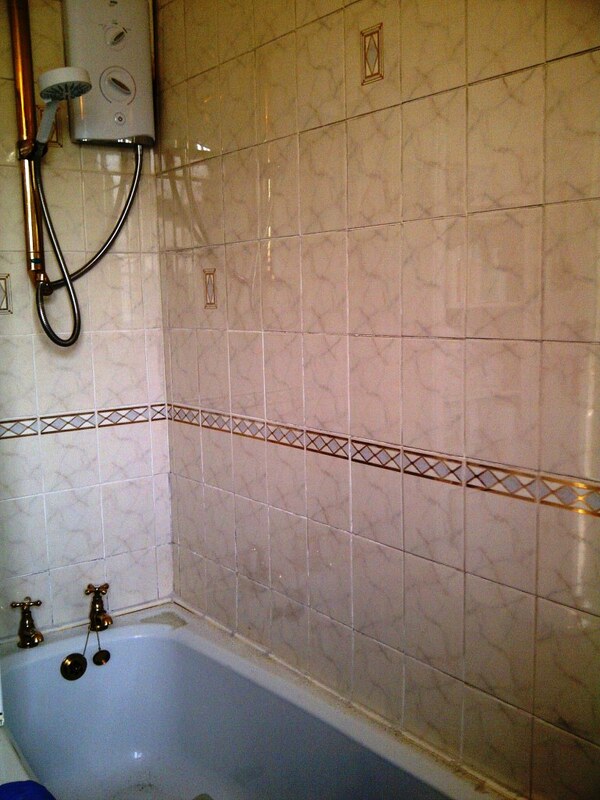 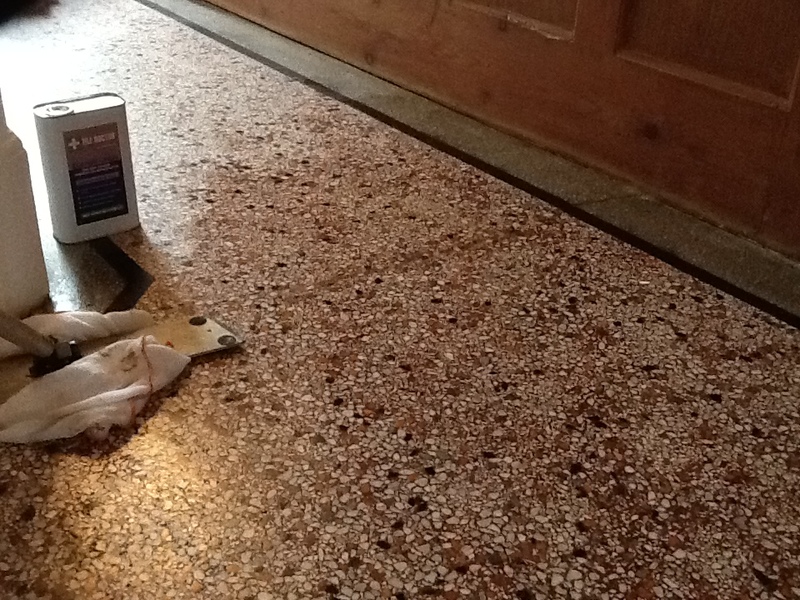 We used a solution of Tile Doctor Pro-Clean and mixed with warm water scrubbed into the floor to release the dirt. 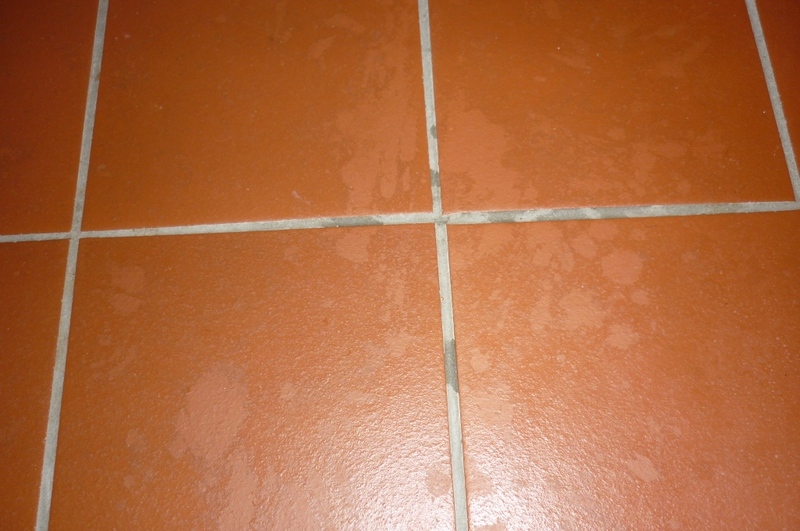 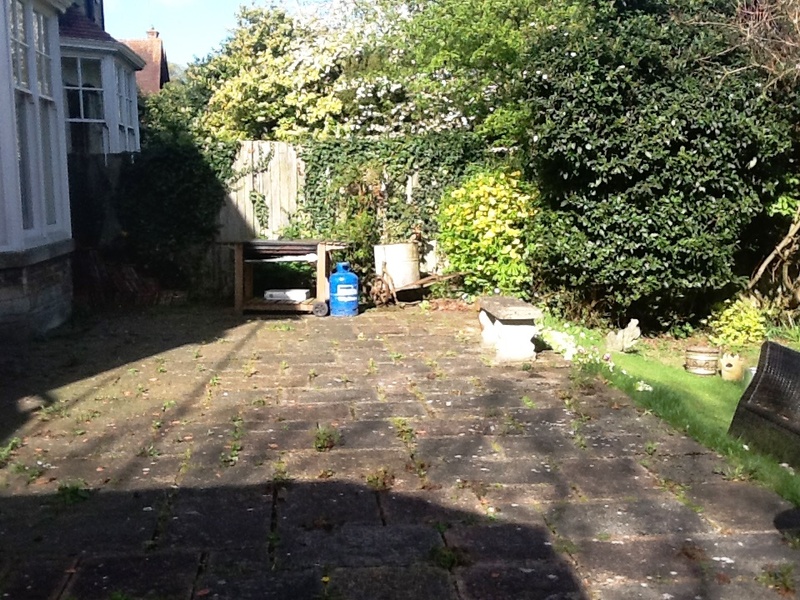 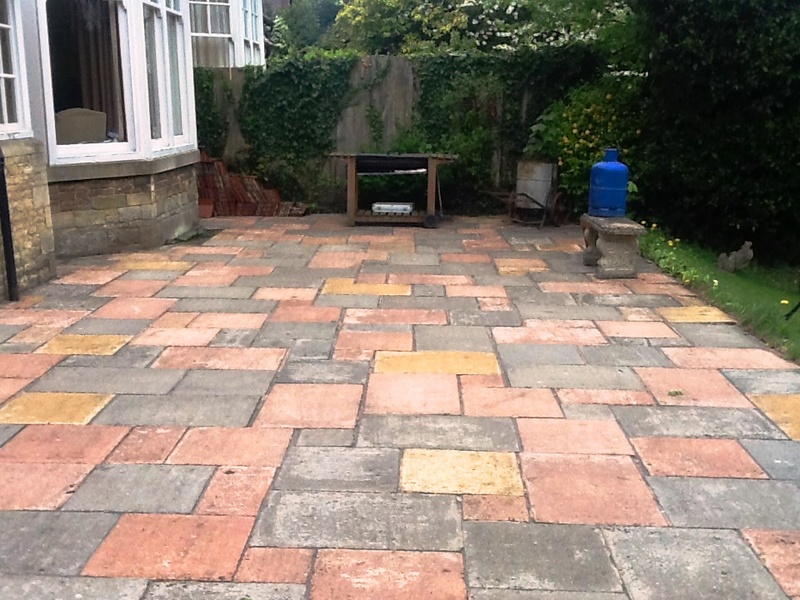 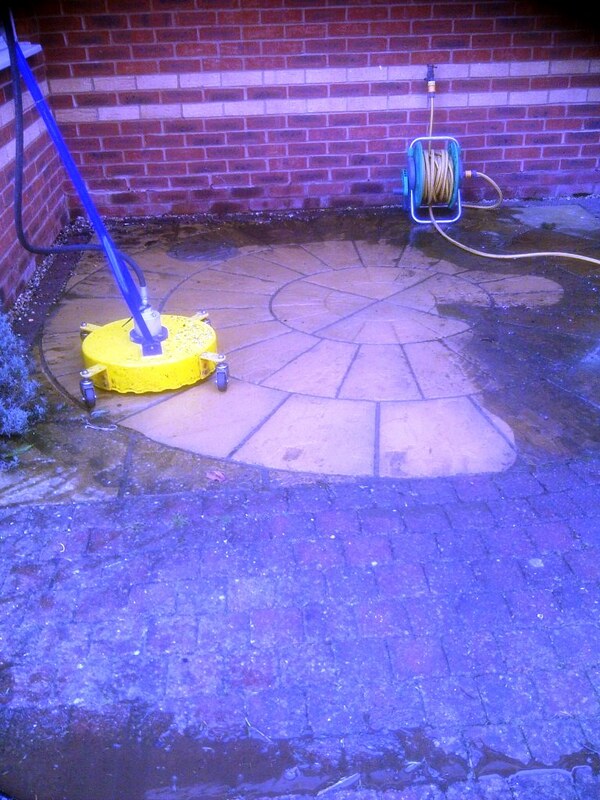 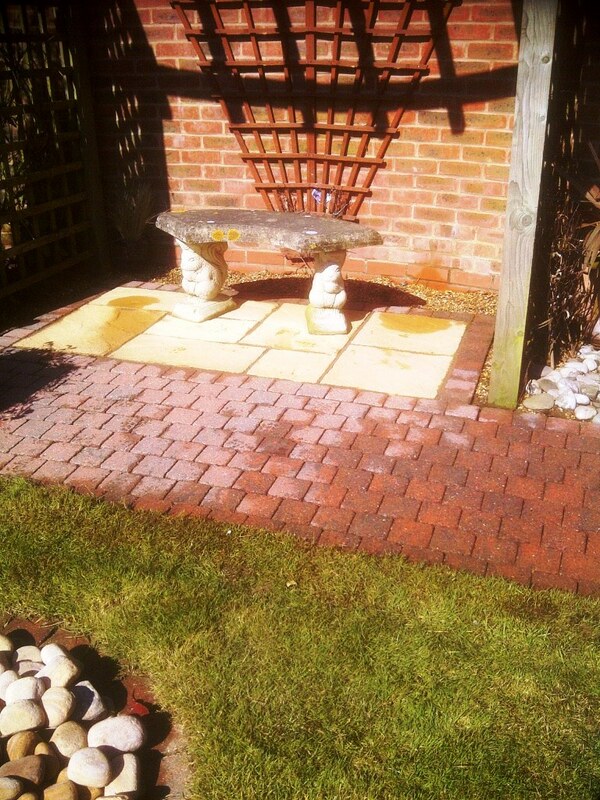 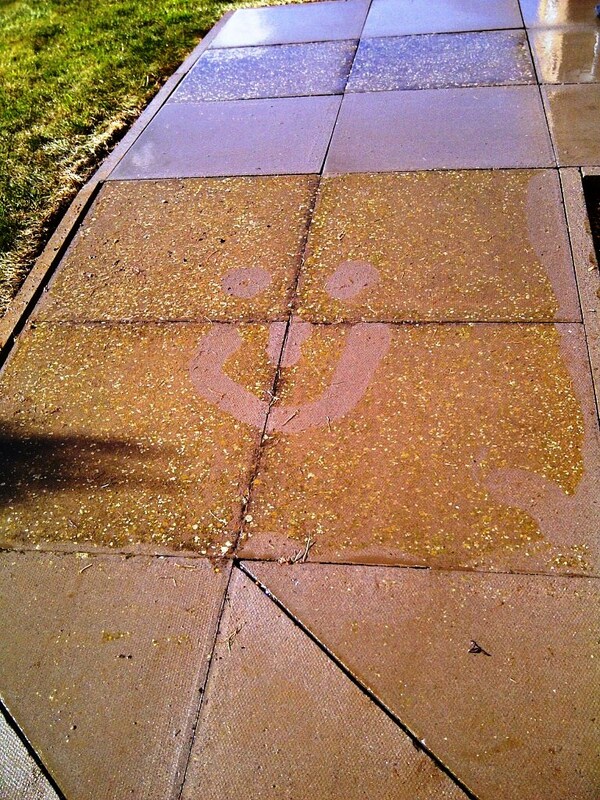 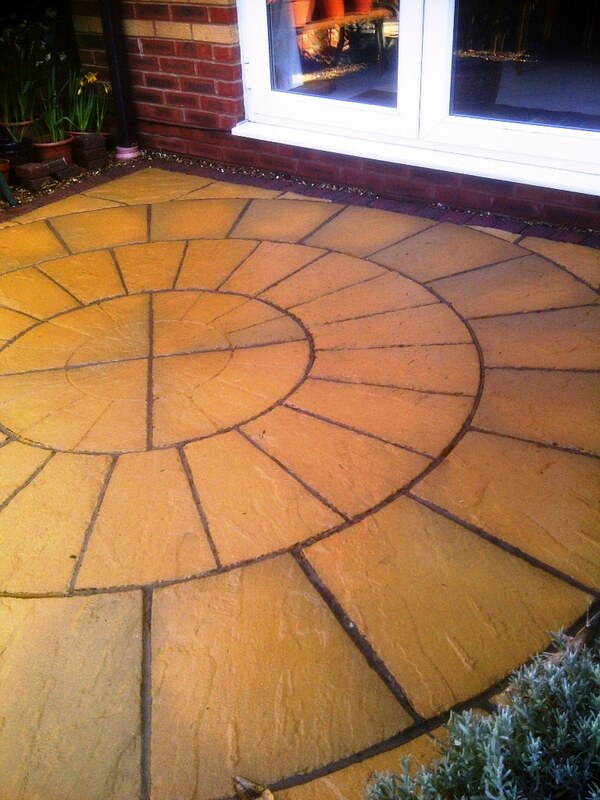 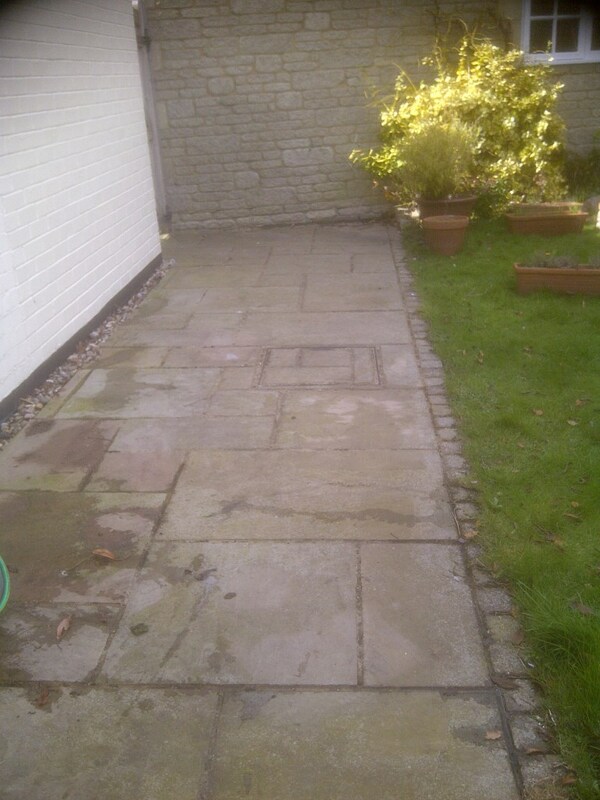 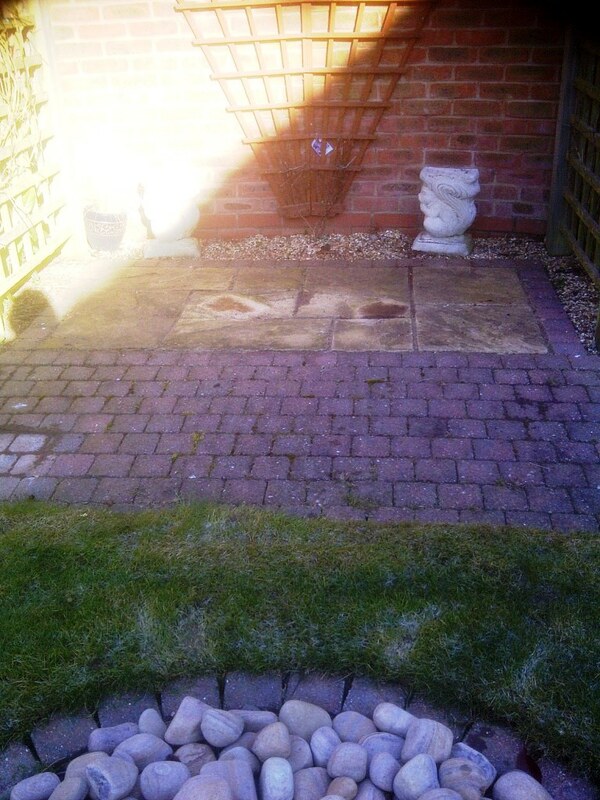 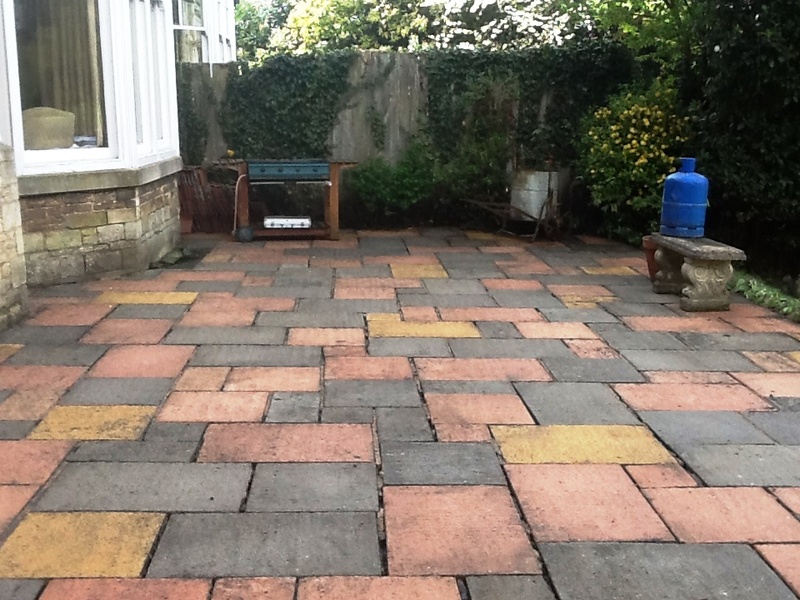 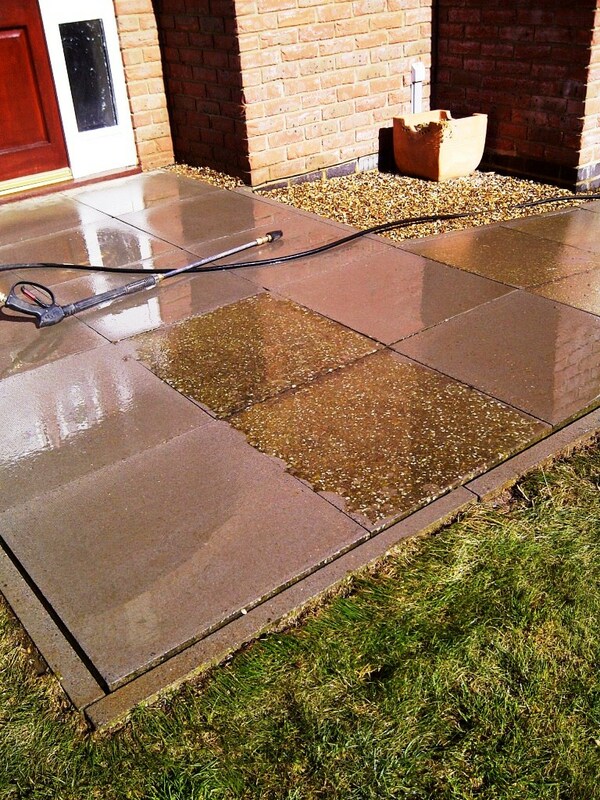 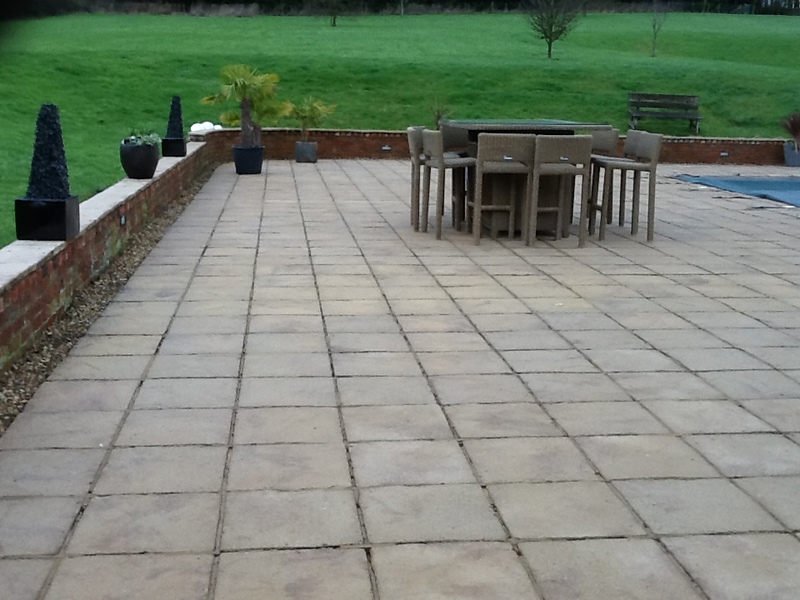 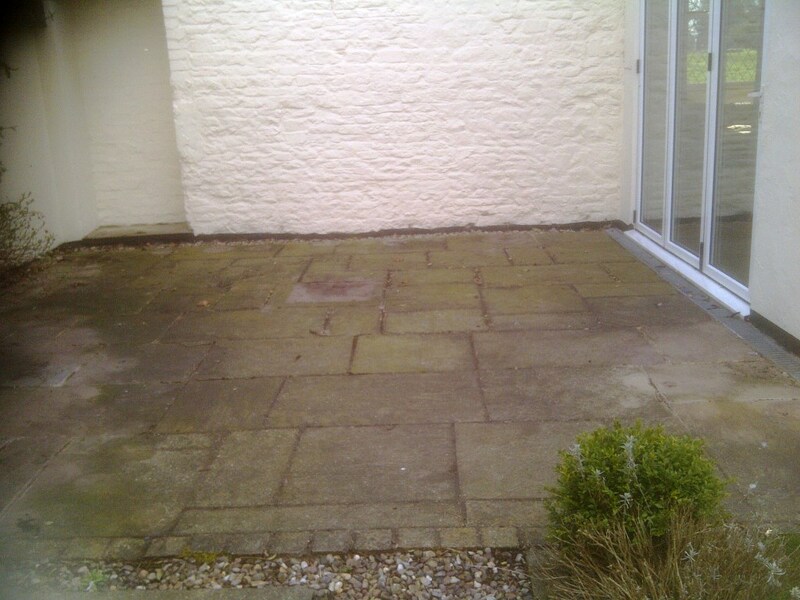 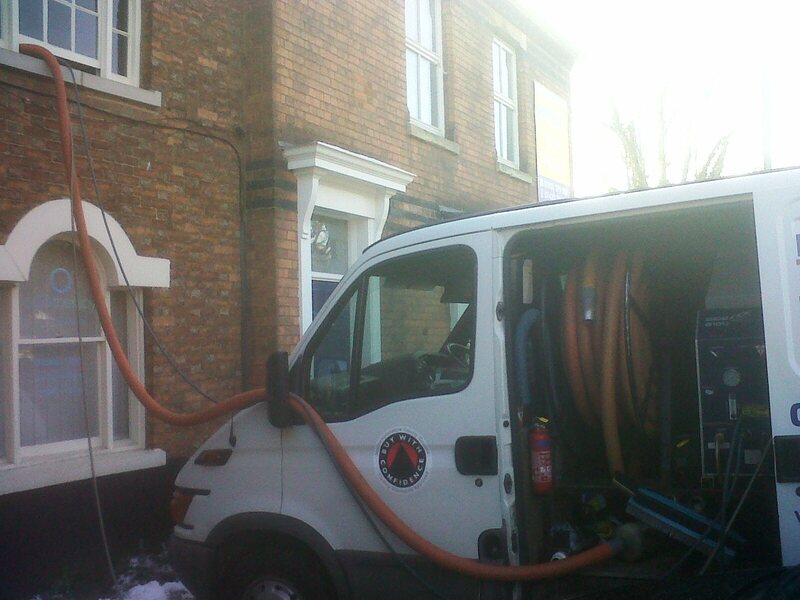 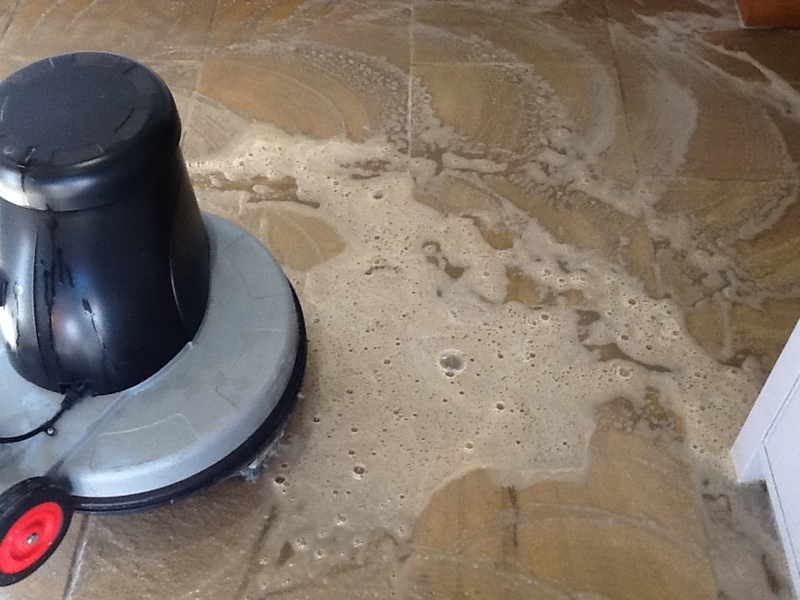 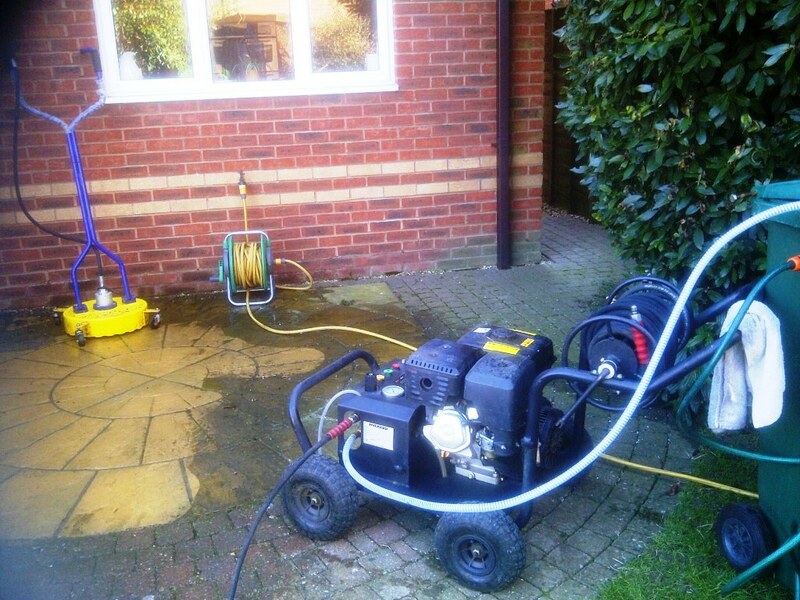 A stronger dilution of Pro-Clean was required in some areas with stubborn stains. 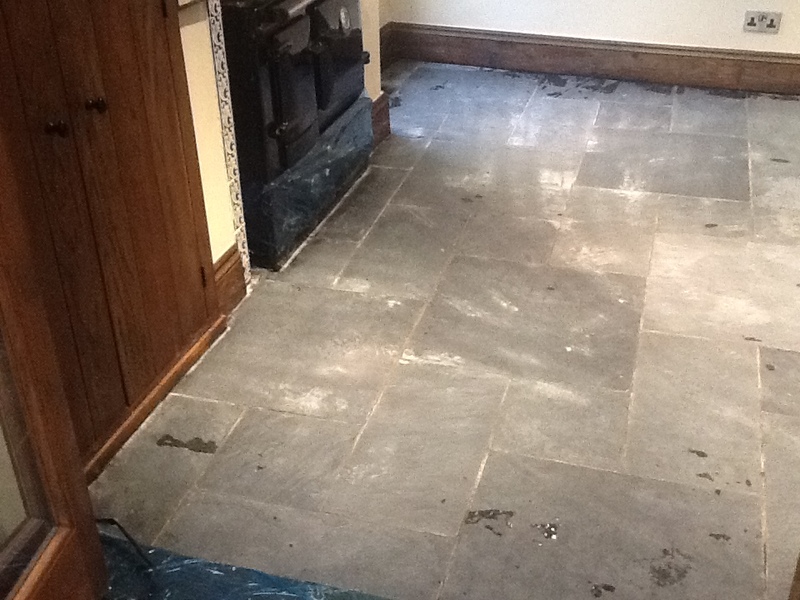 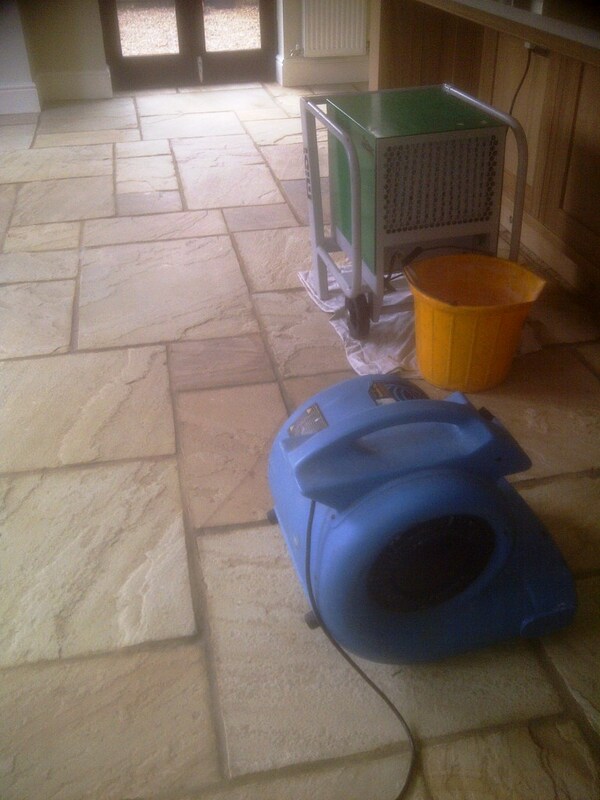 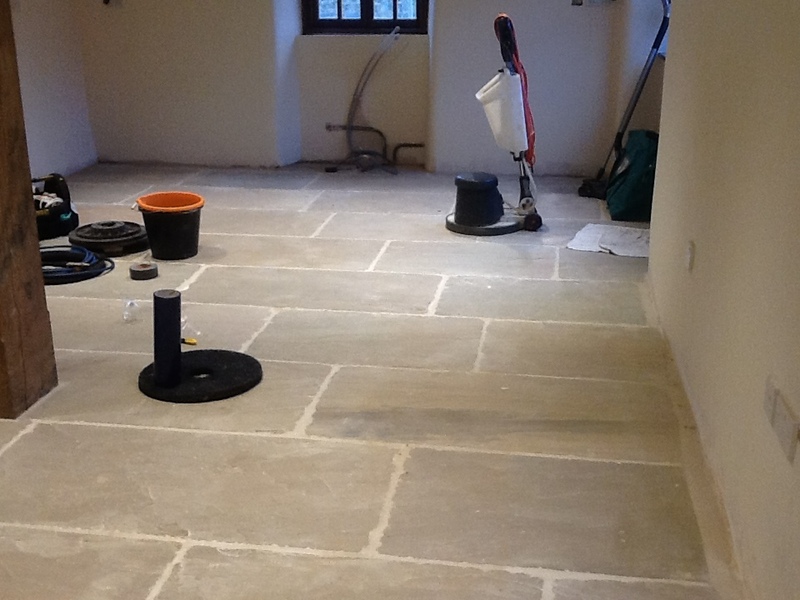 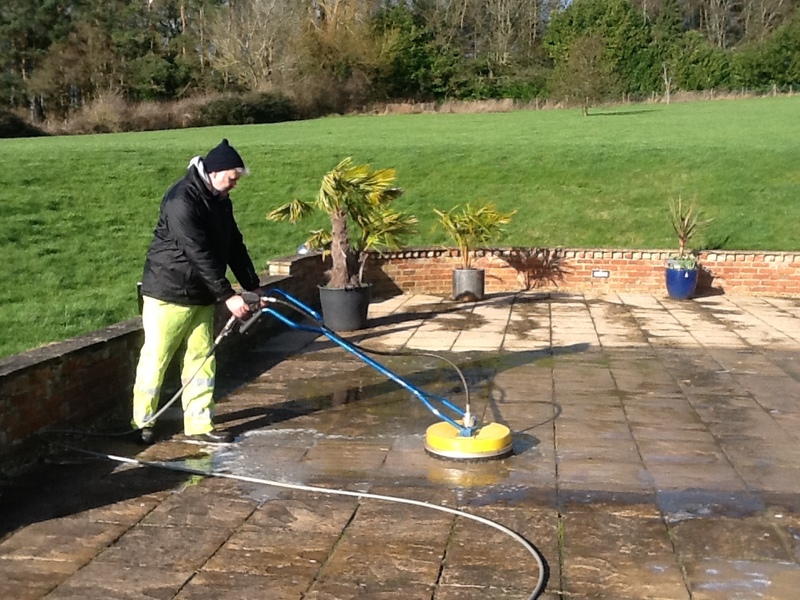 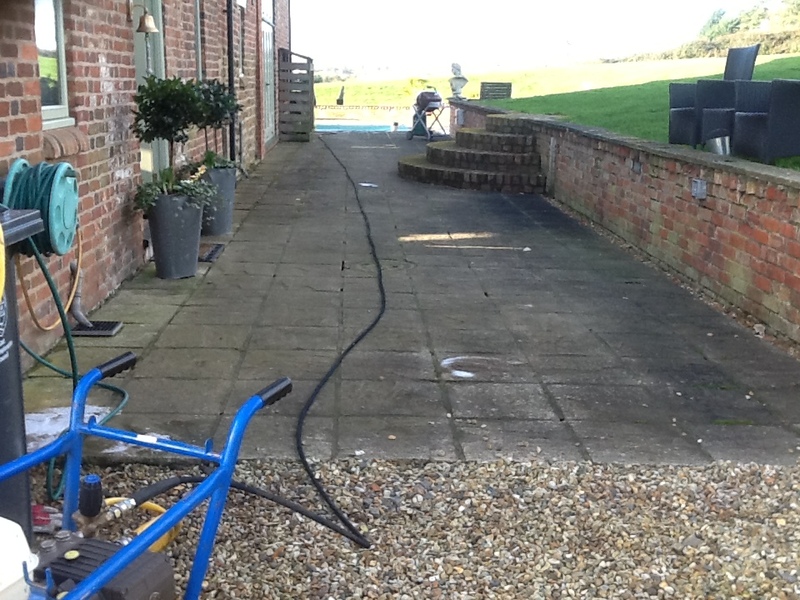 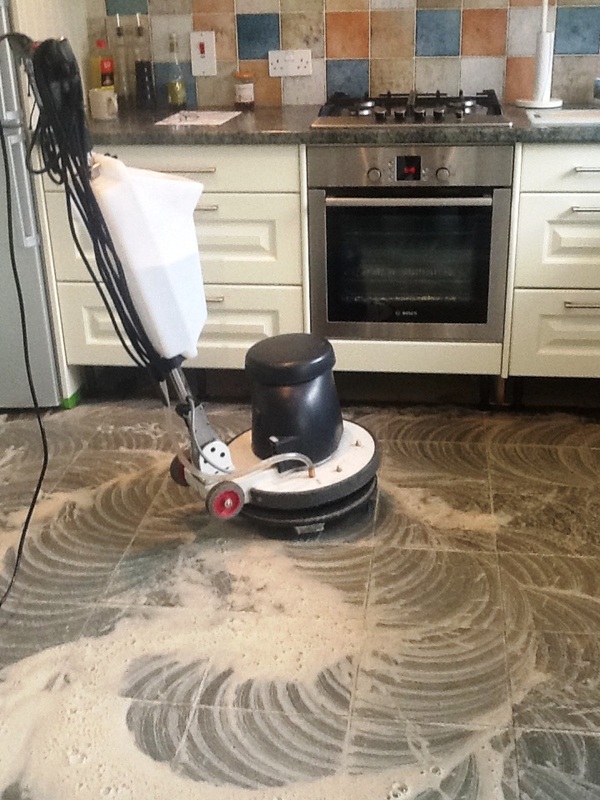 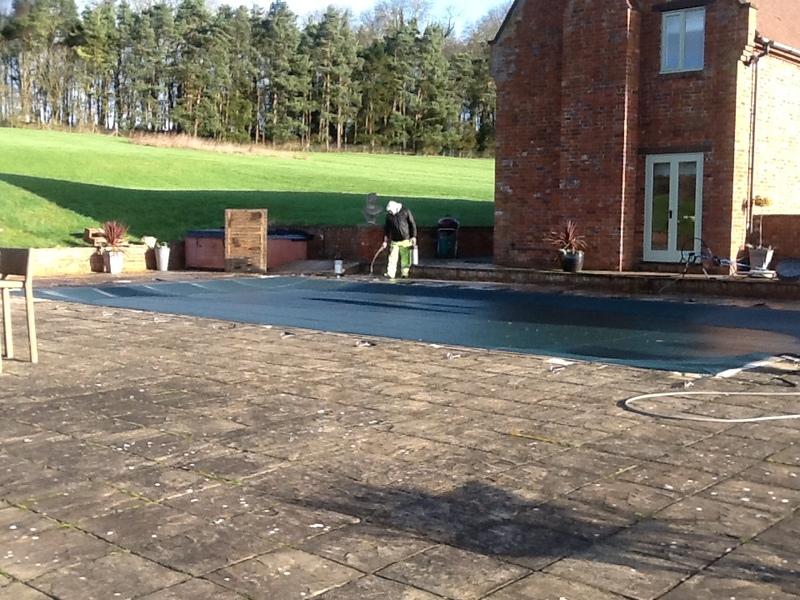 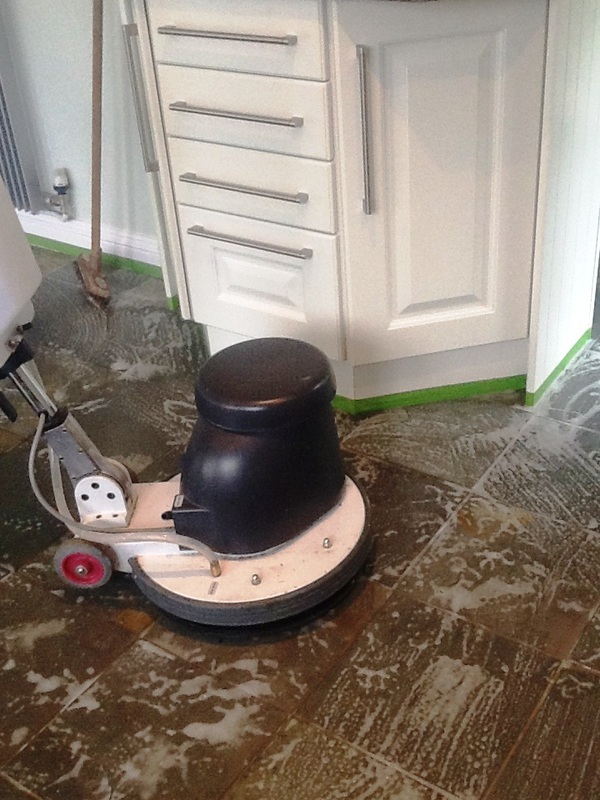 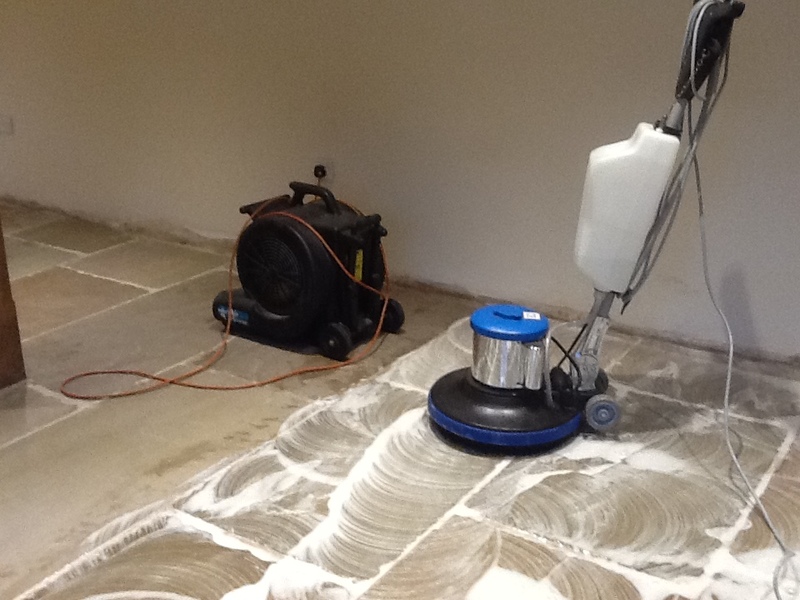 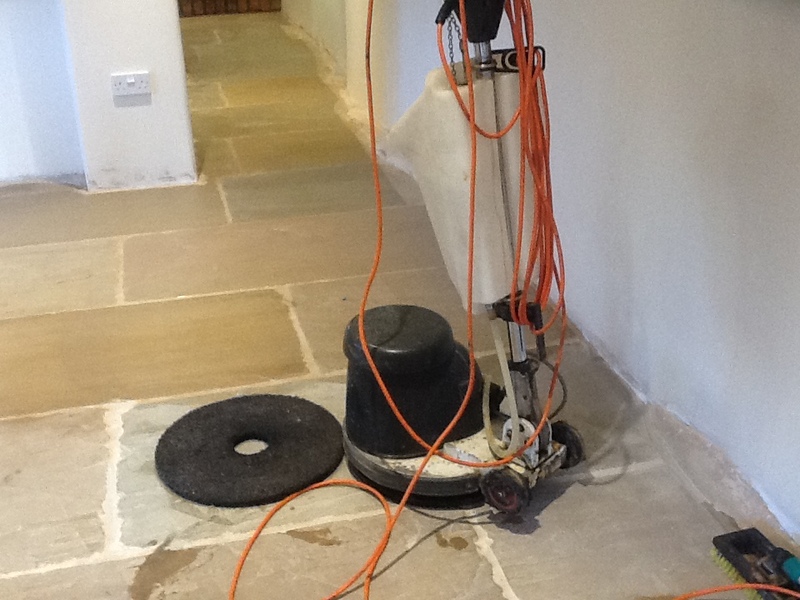 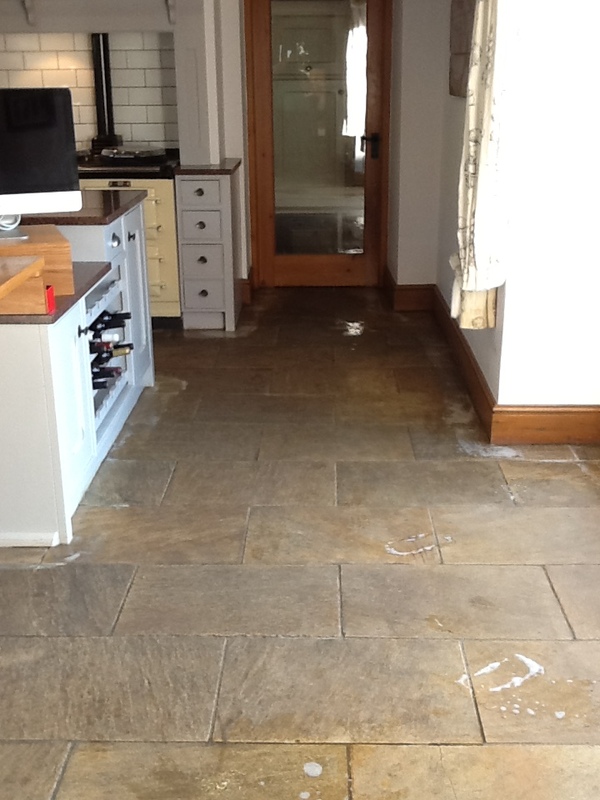 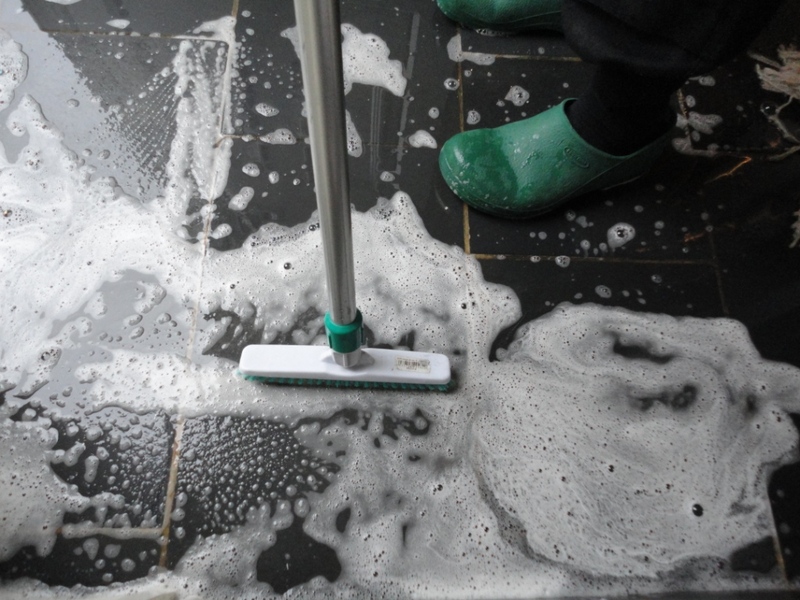 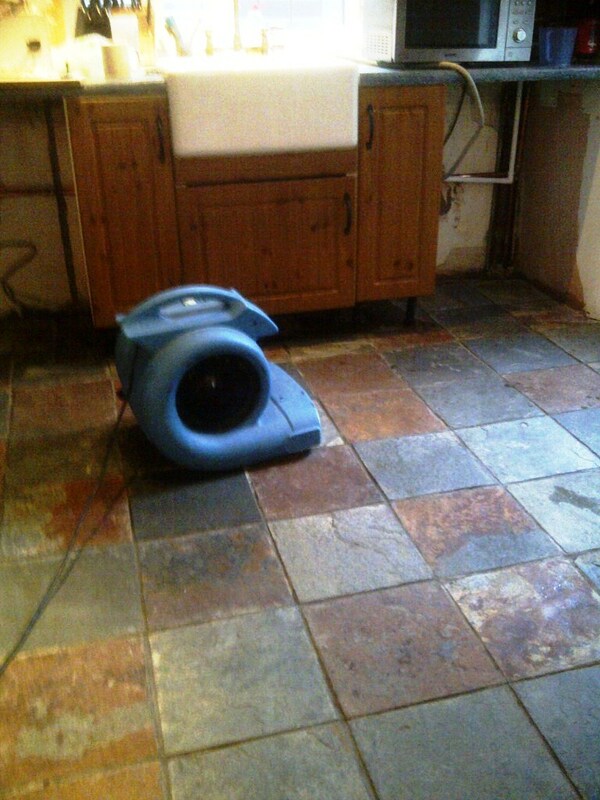 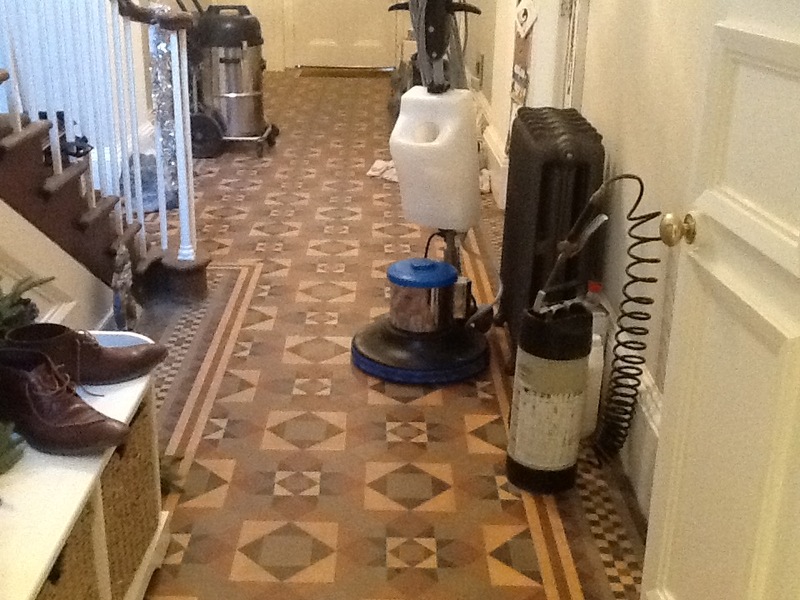 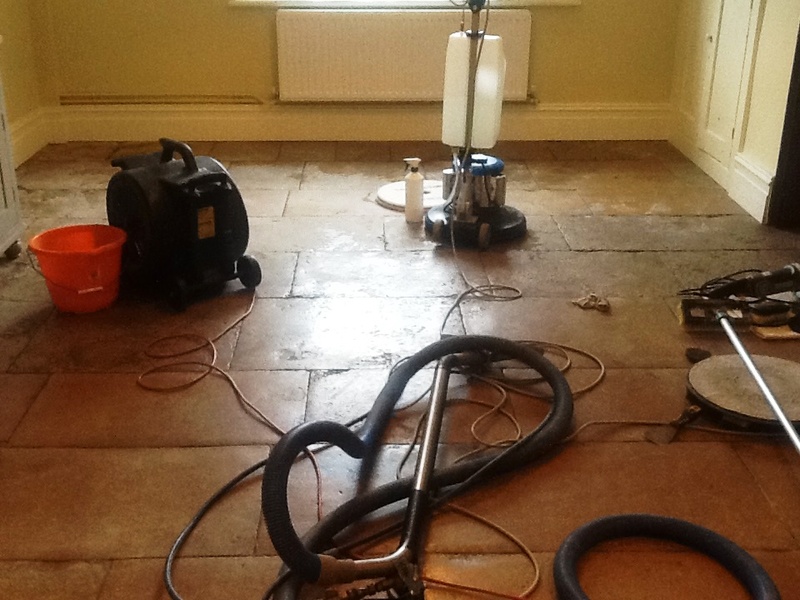 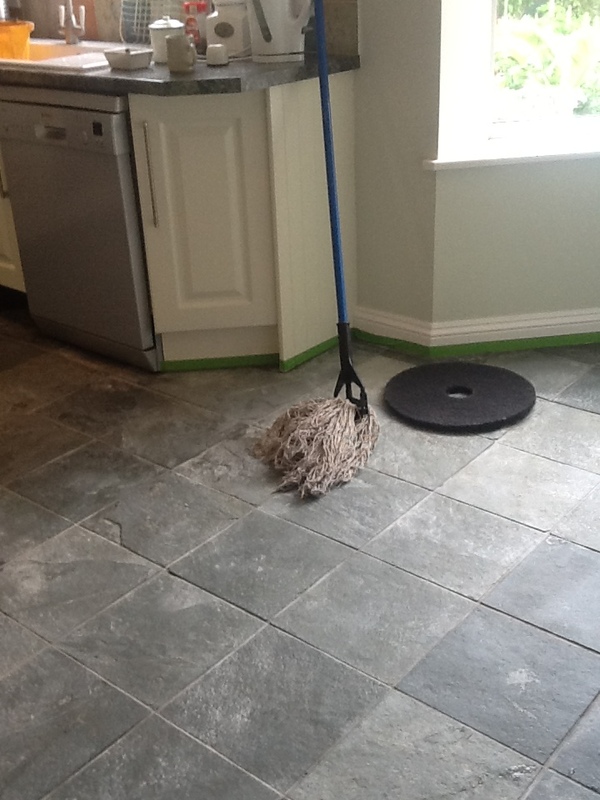 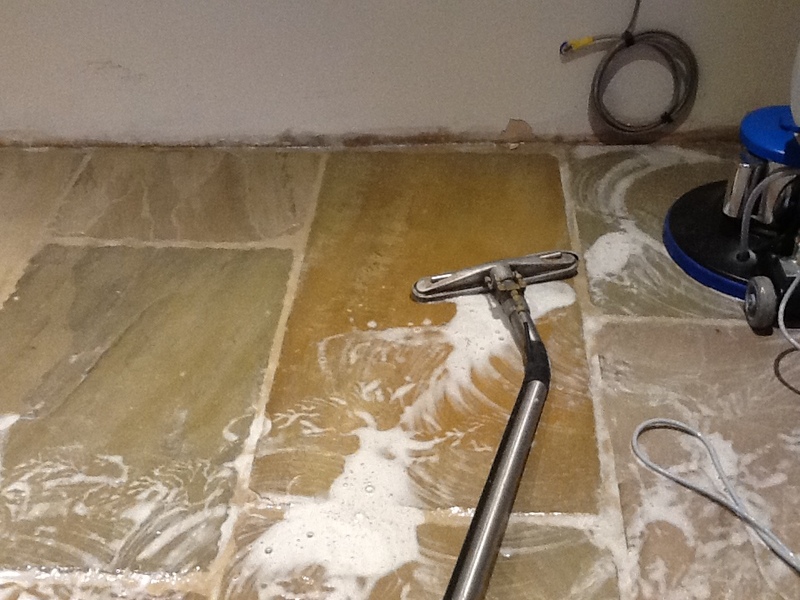 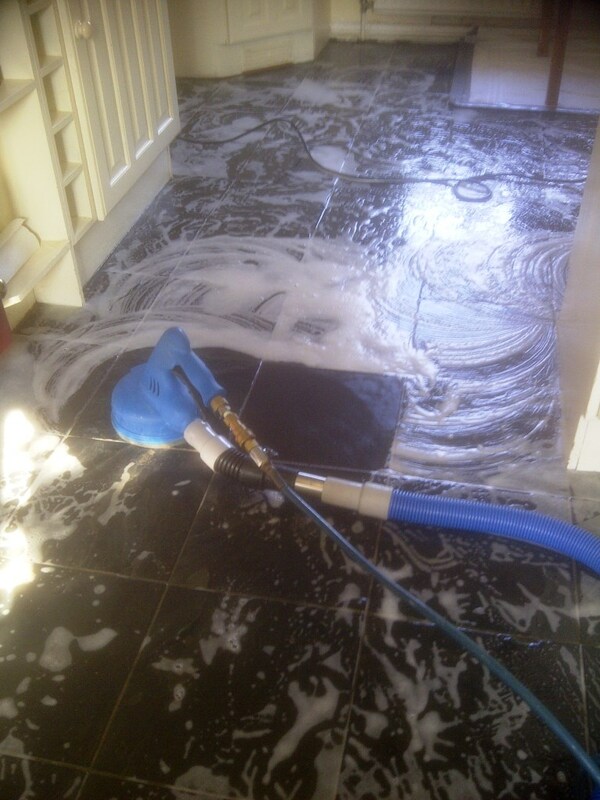 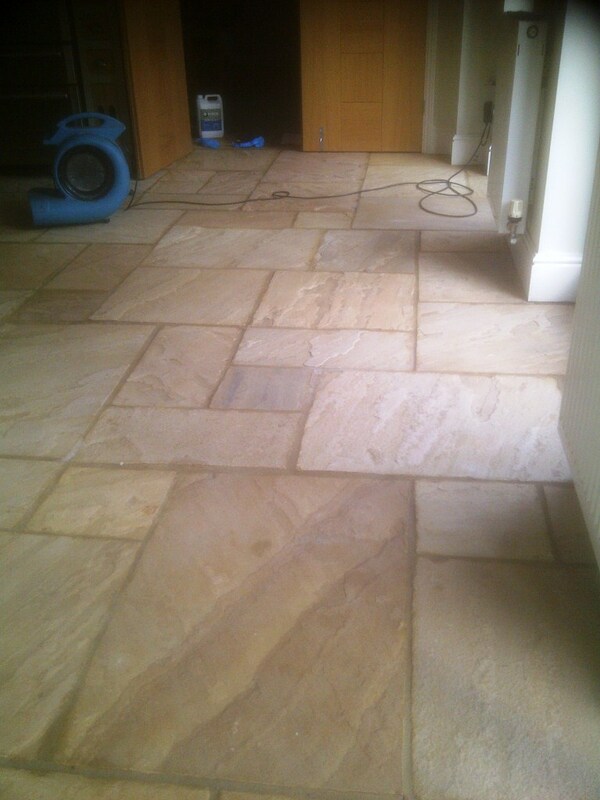 The slate floor tiles were then rinsed with water using a wet vacuum to soak up the excess; we then rinsed and vacuumed the floor a second time to make sure there was no Pro-Clean residue left behind. 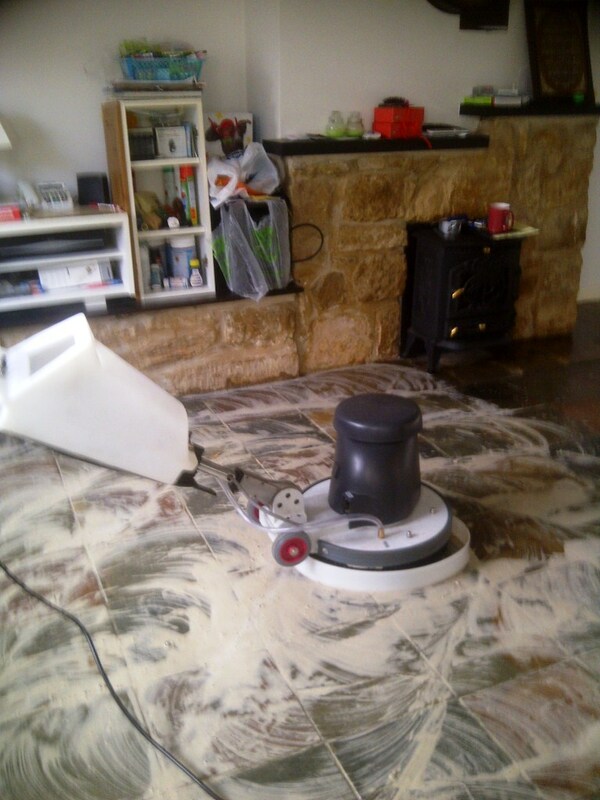 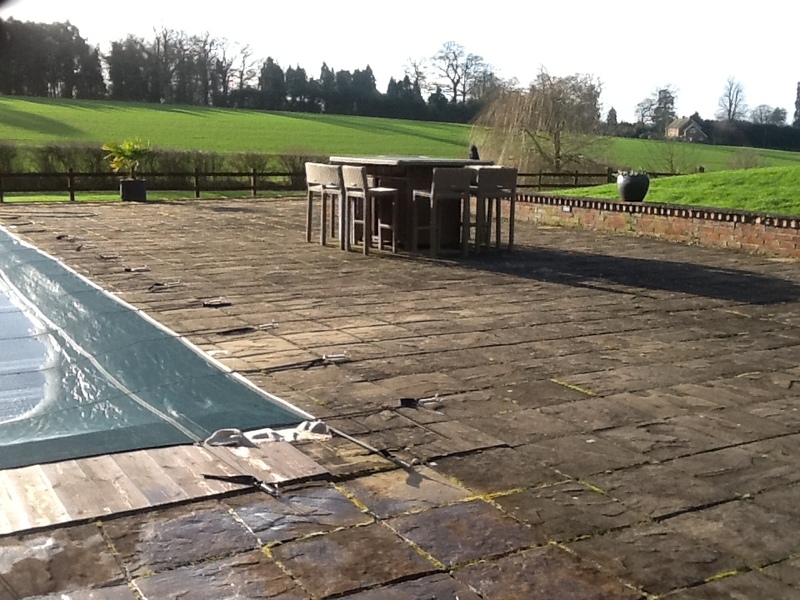 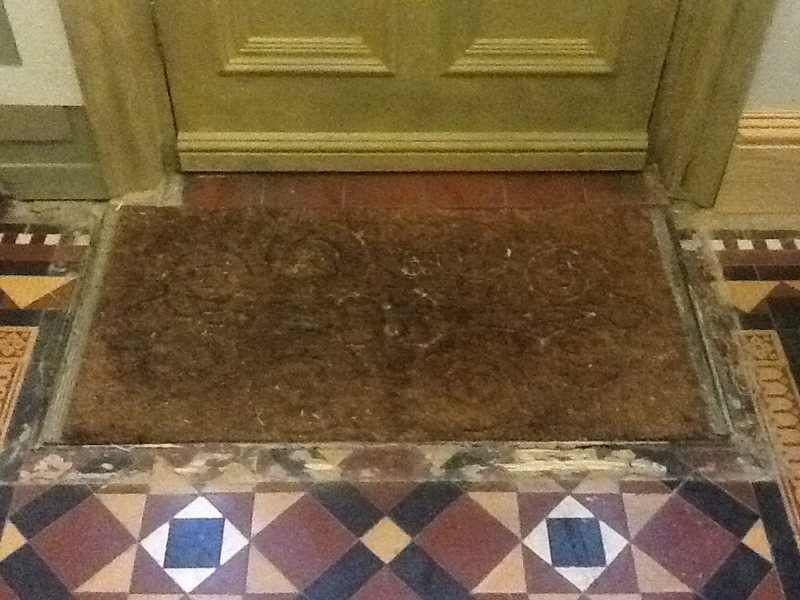 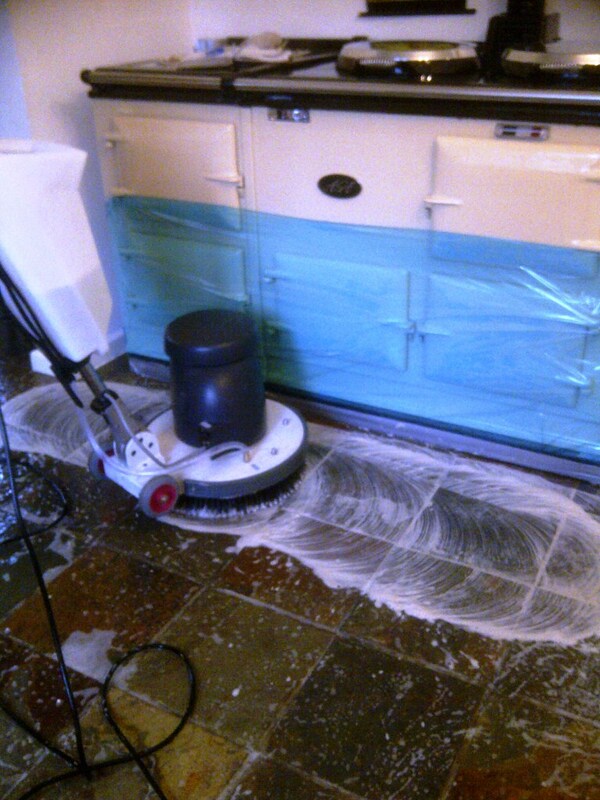 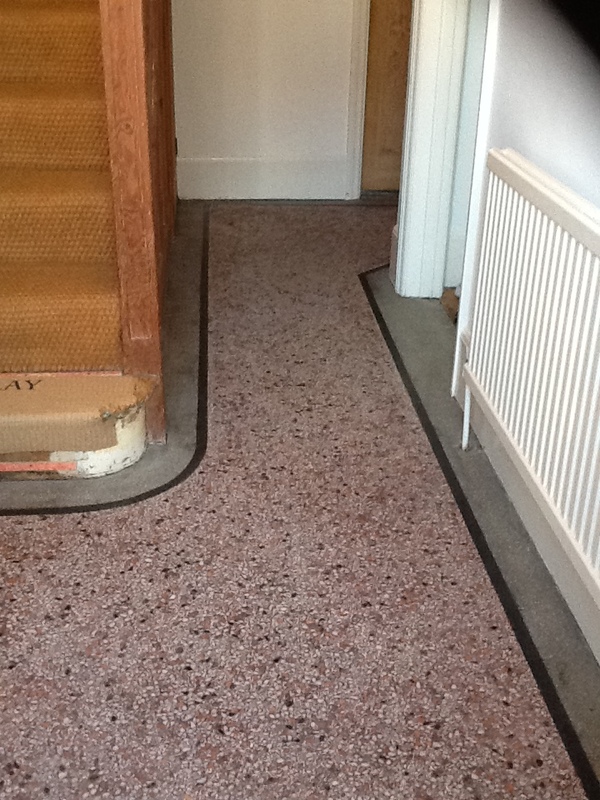 The floor was then covered with a dust sheet and left to dry overnight. 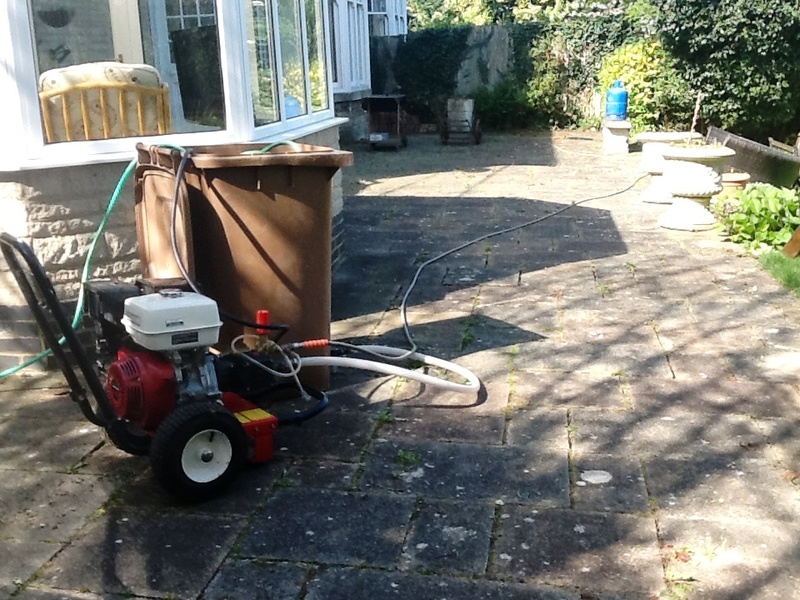 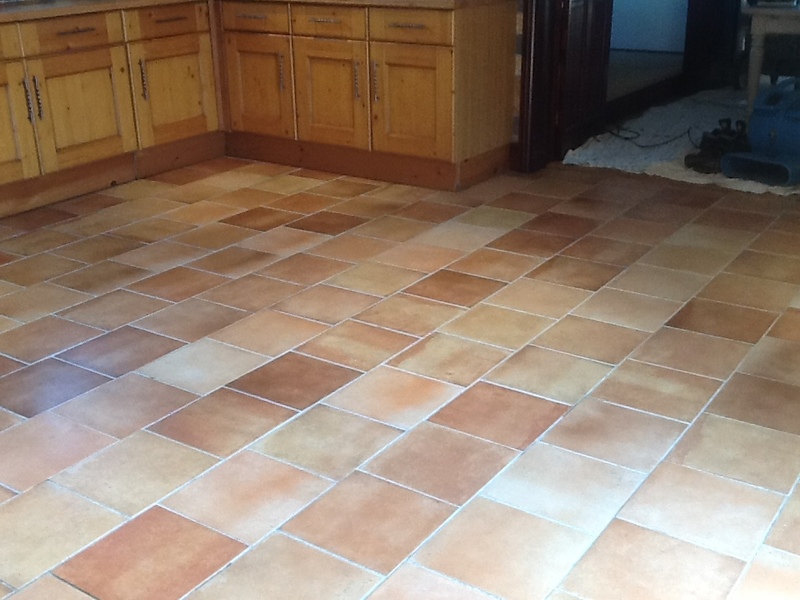 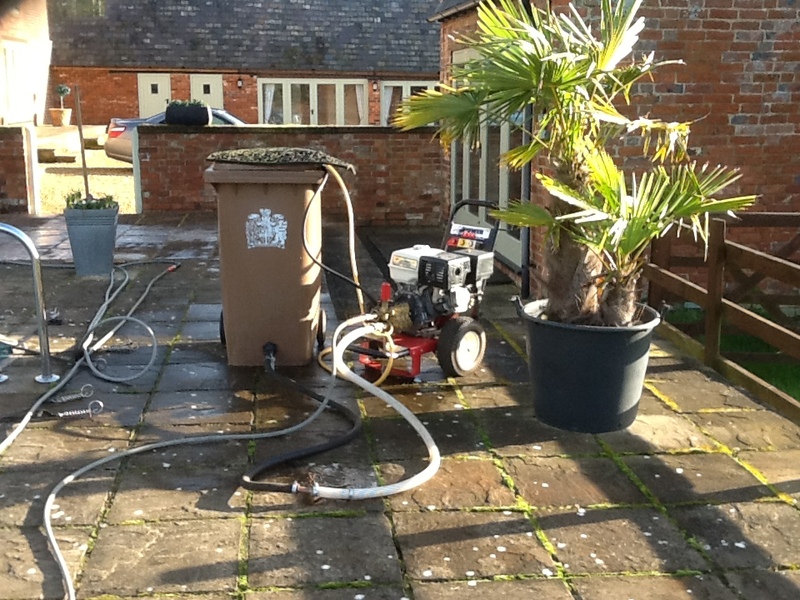 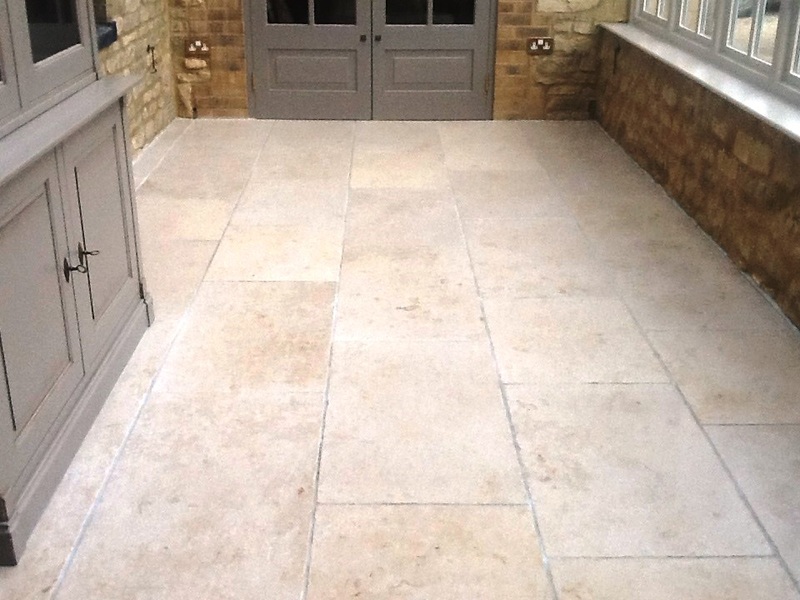 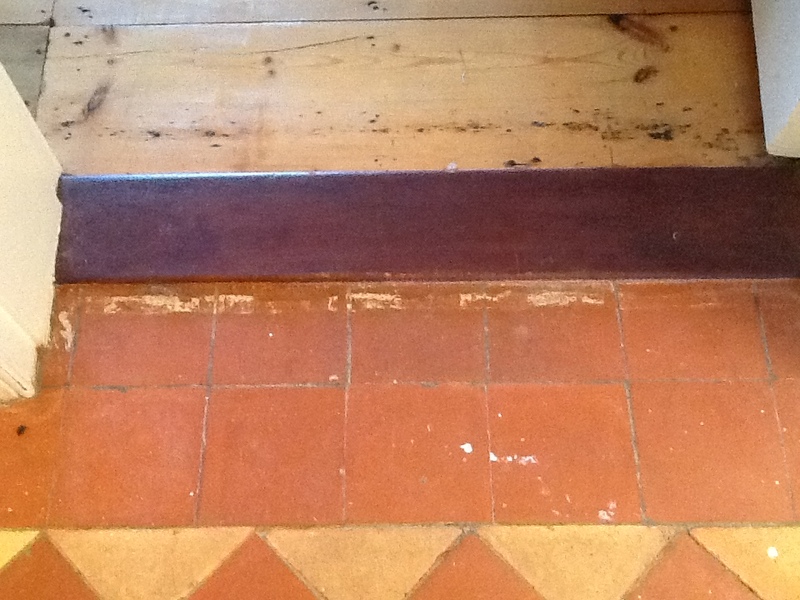 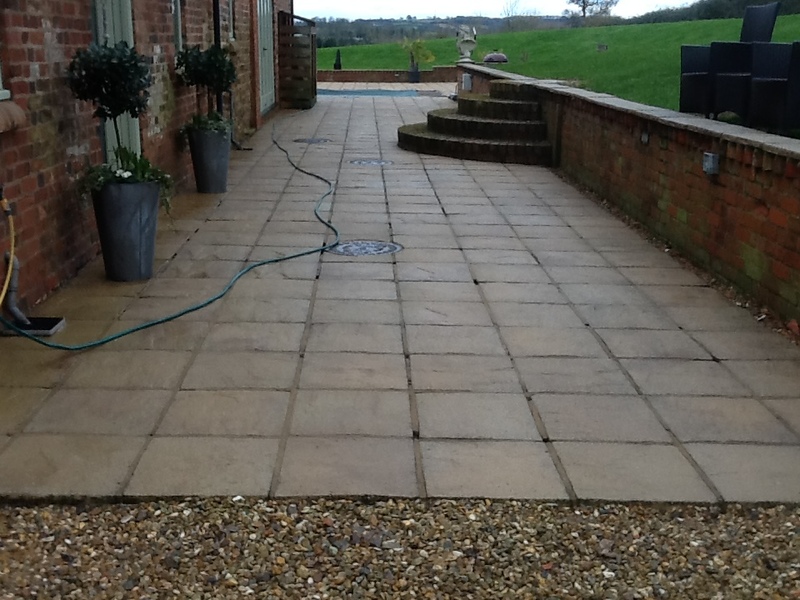 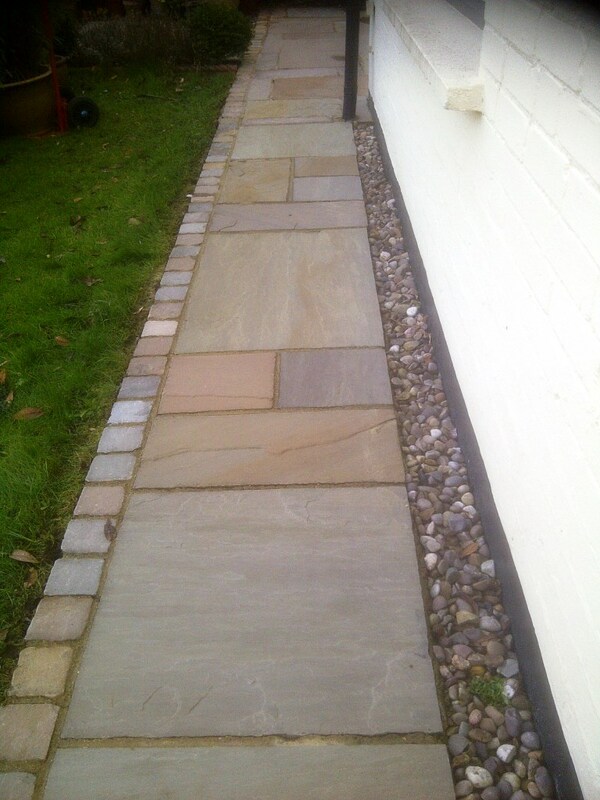 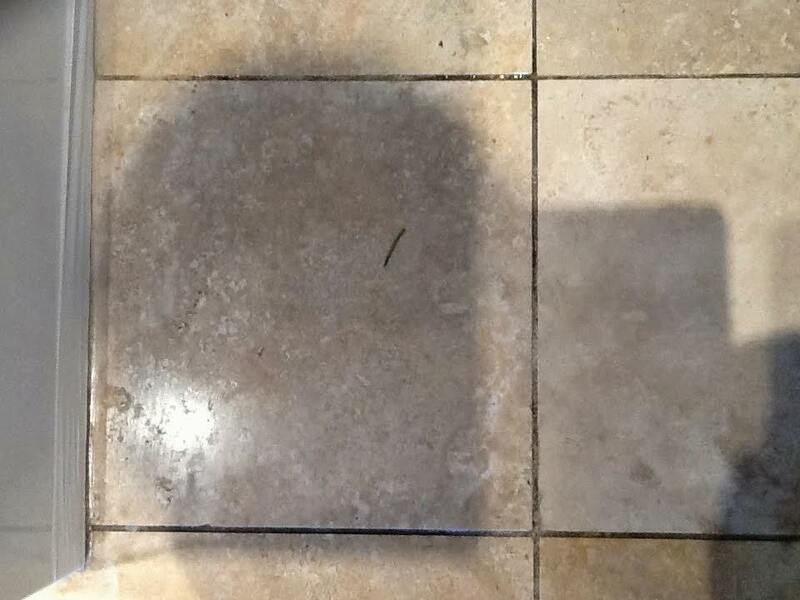 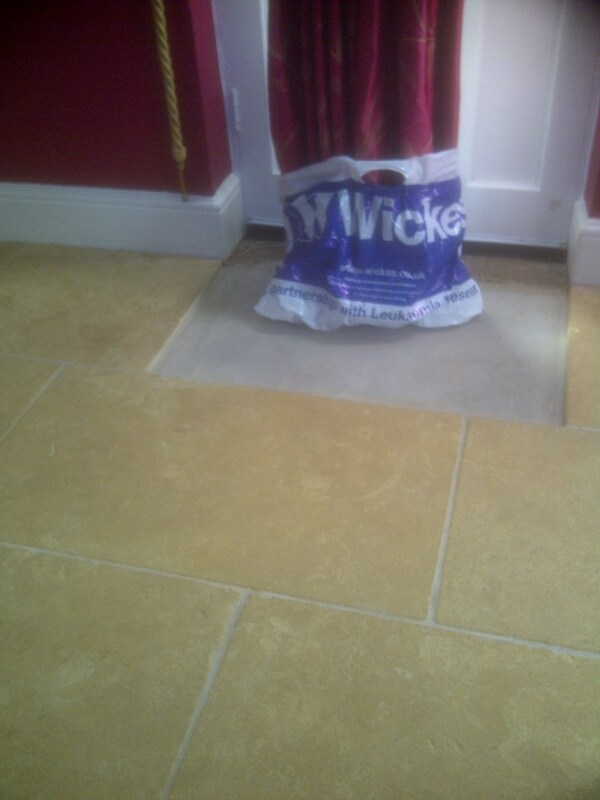 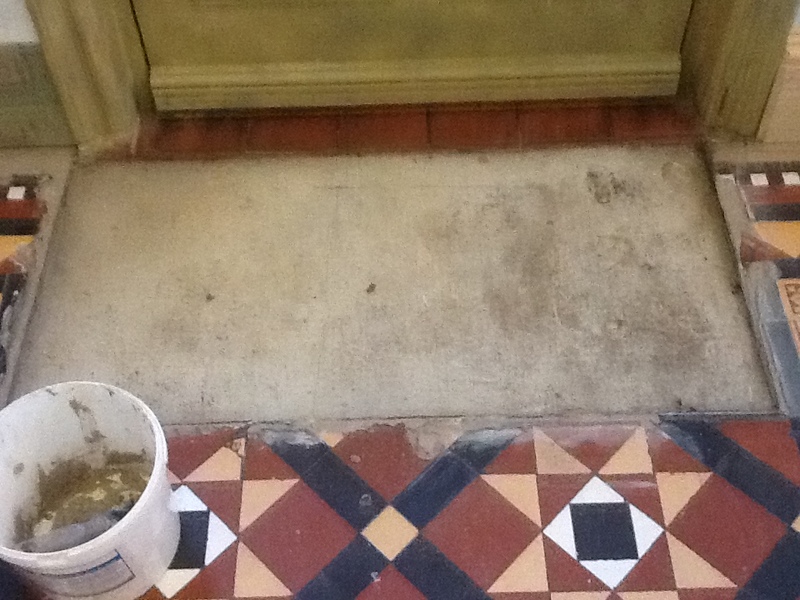 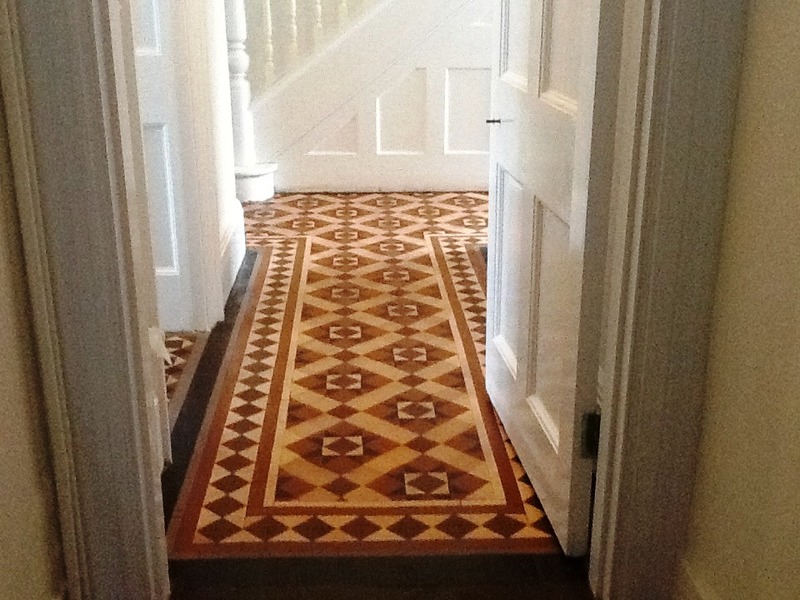 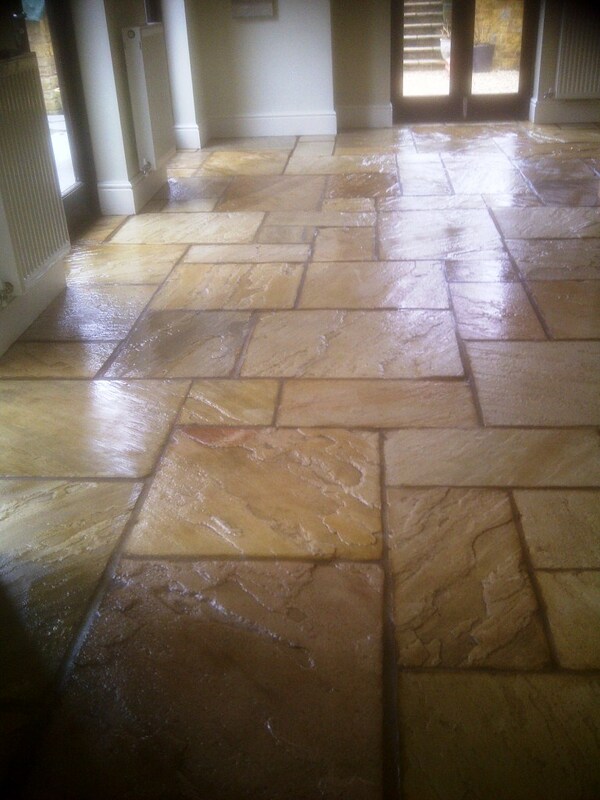 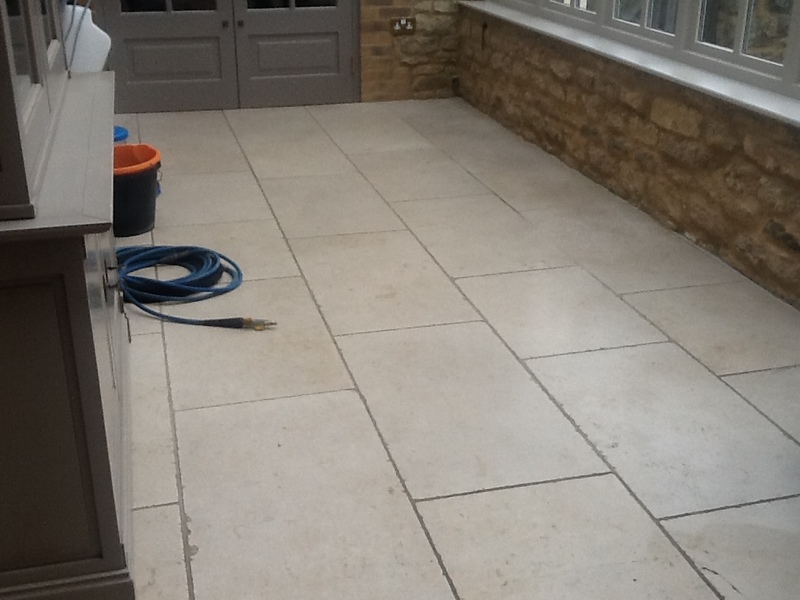 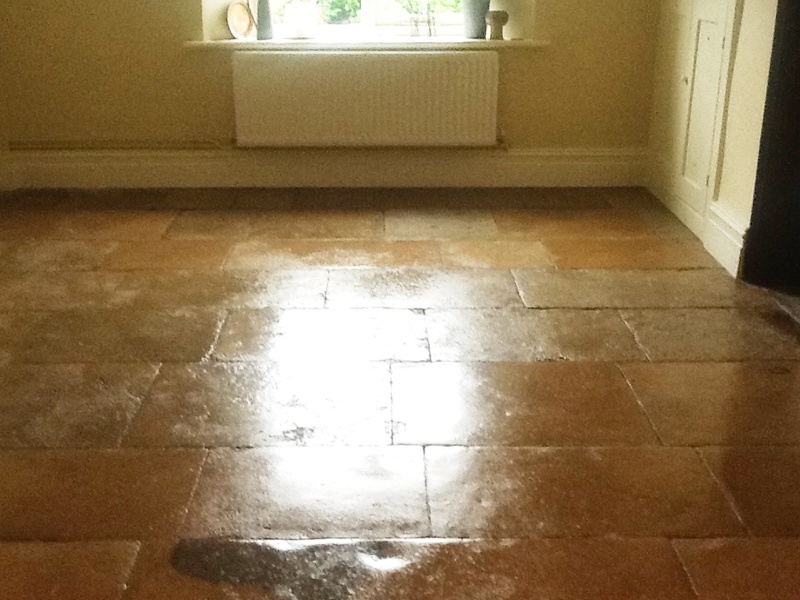 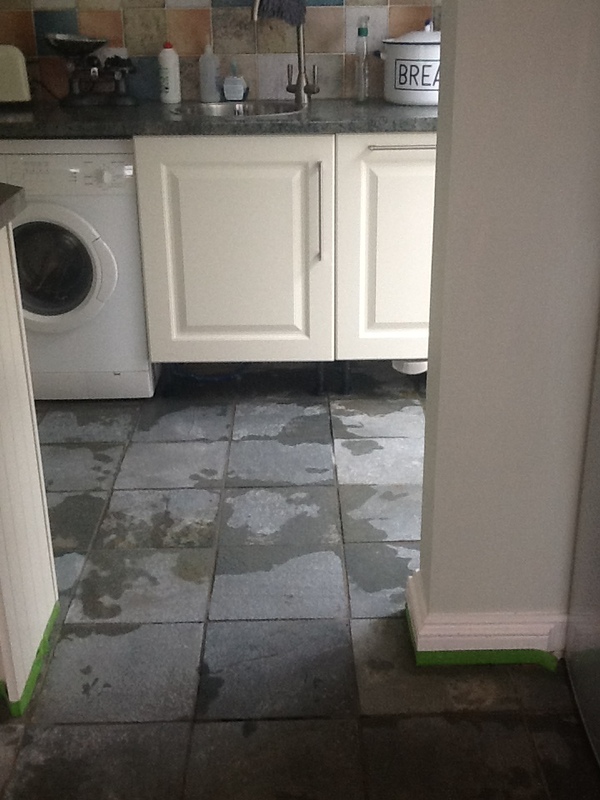 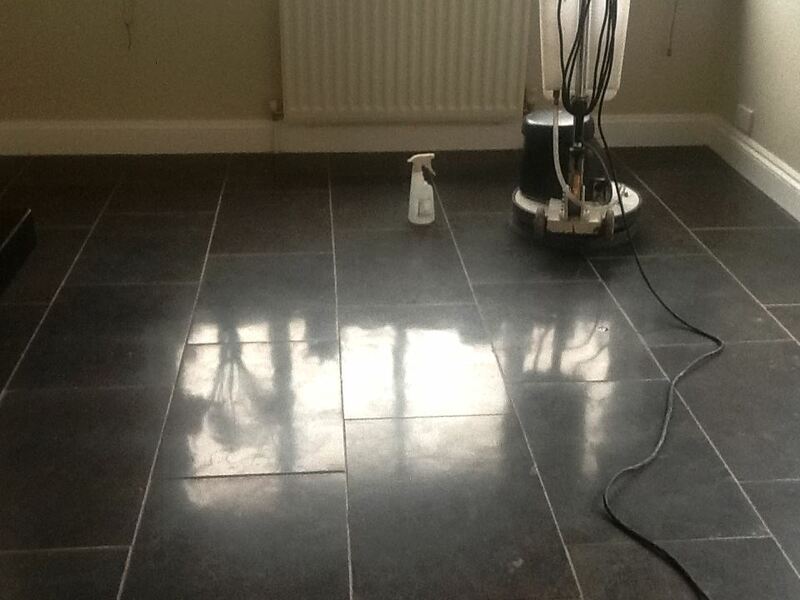 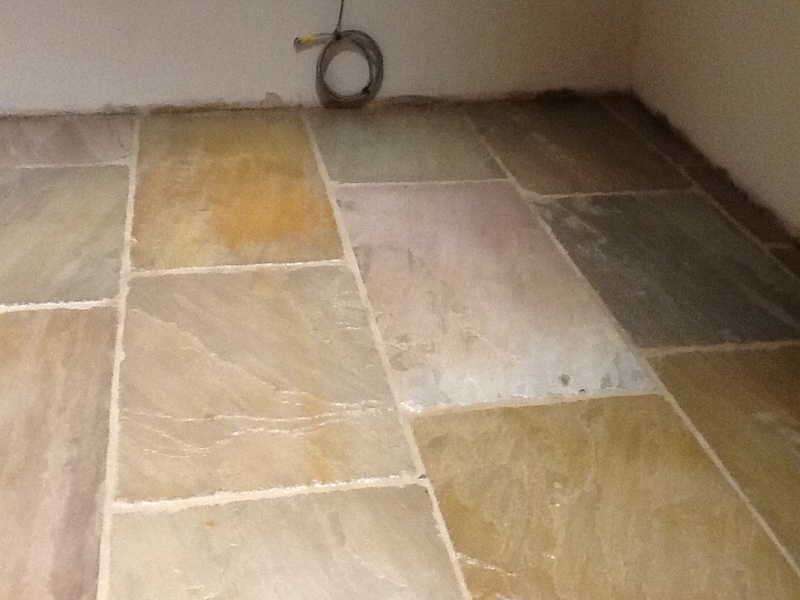 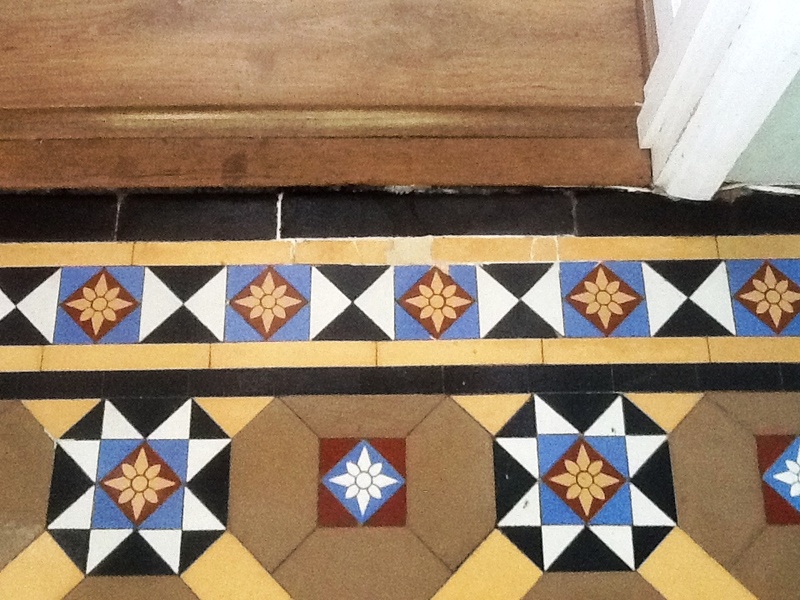 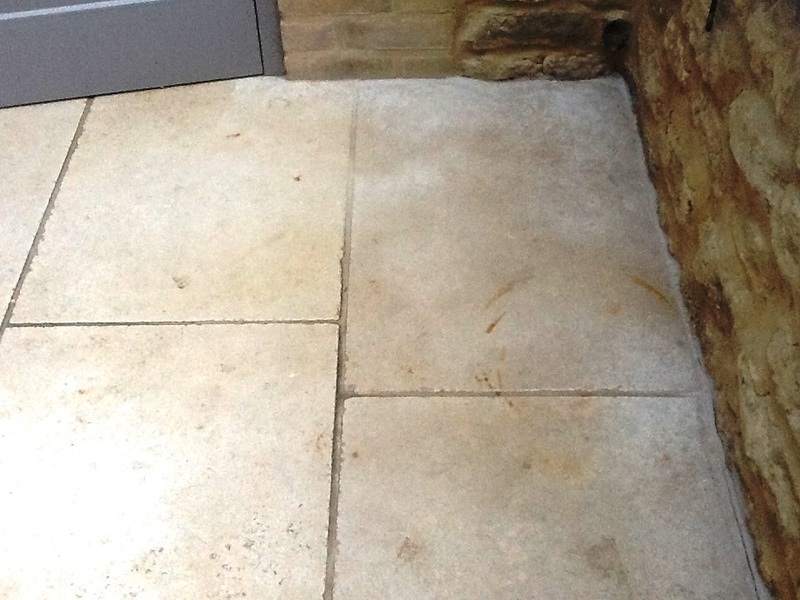 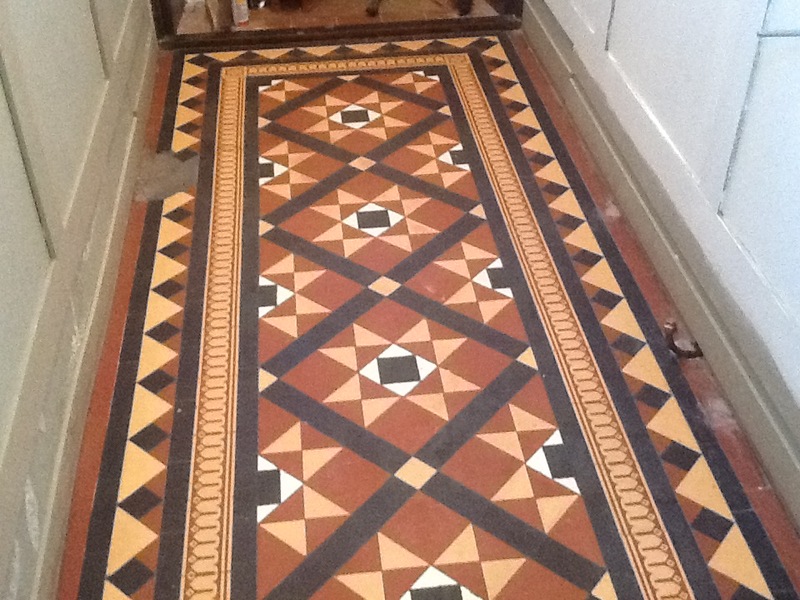 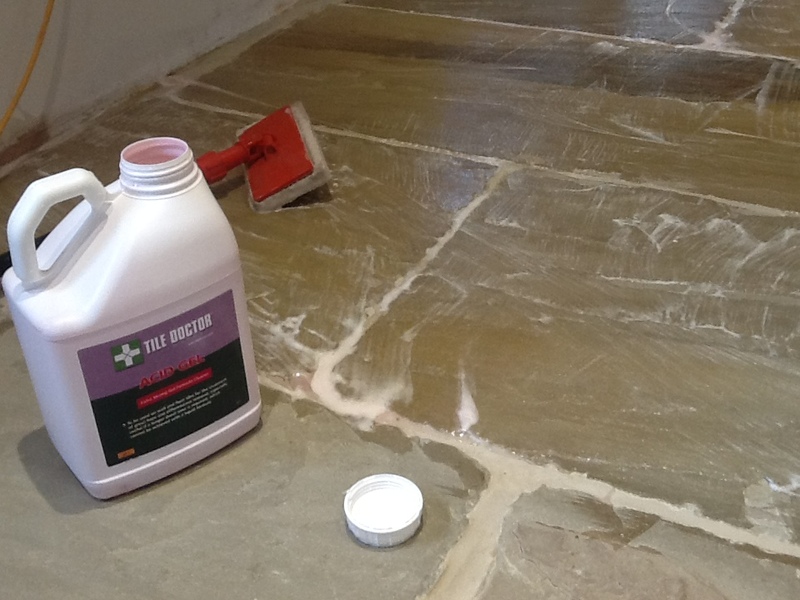 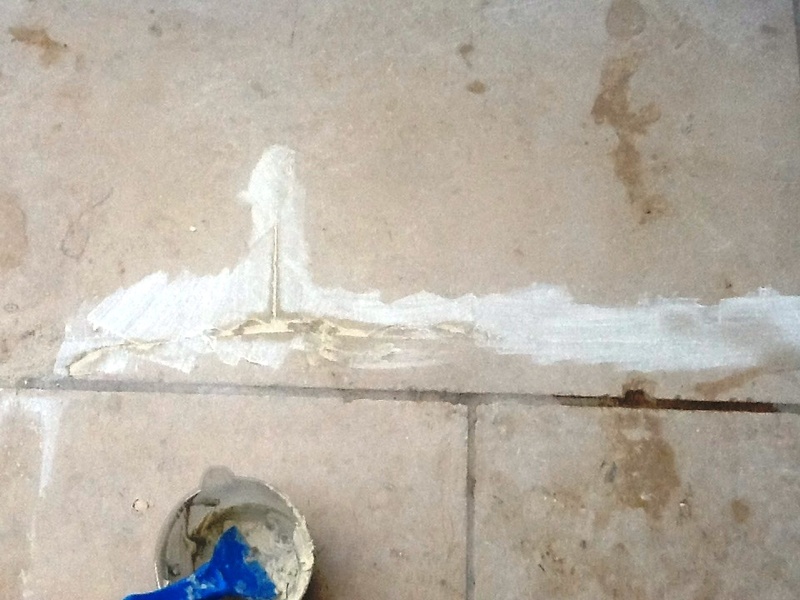 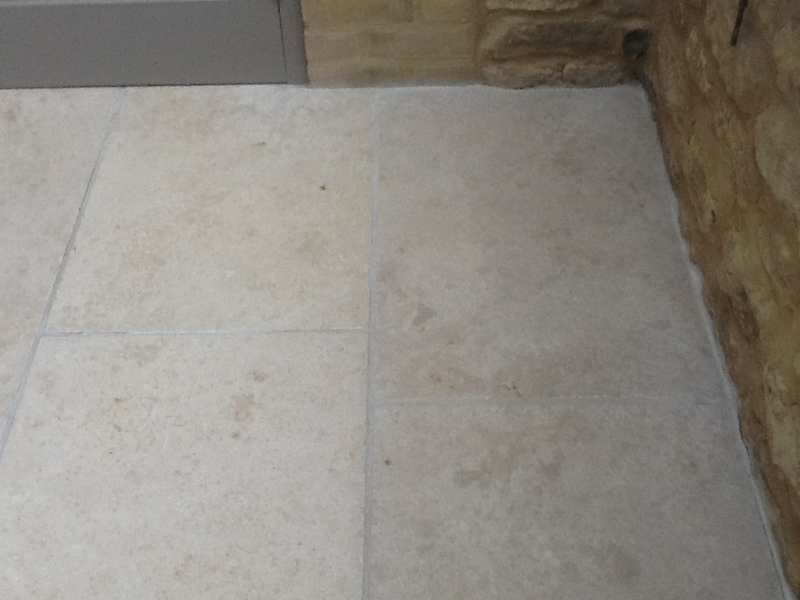 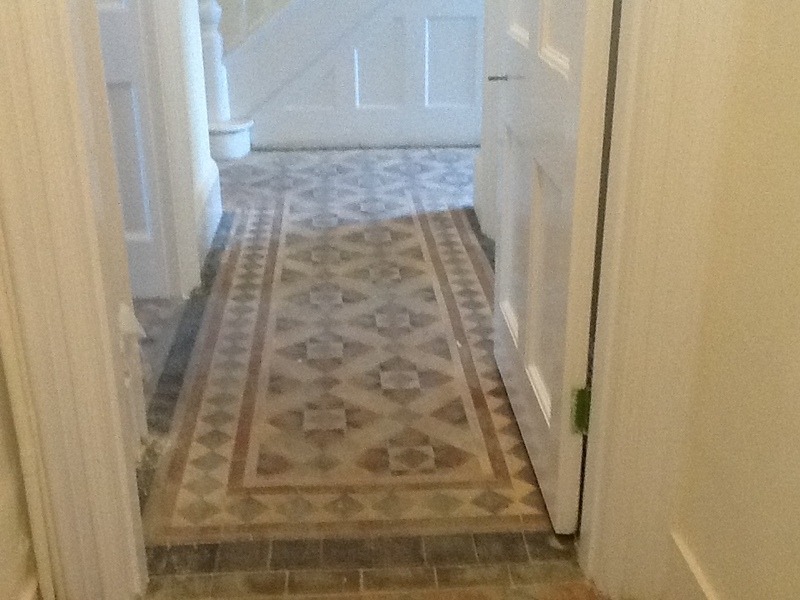 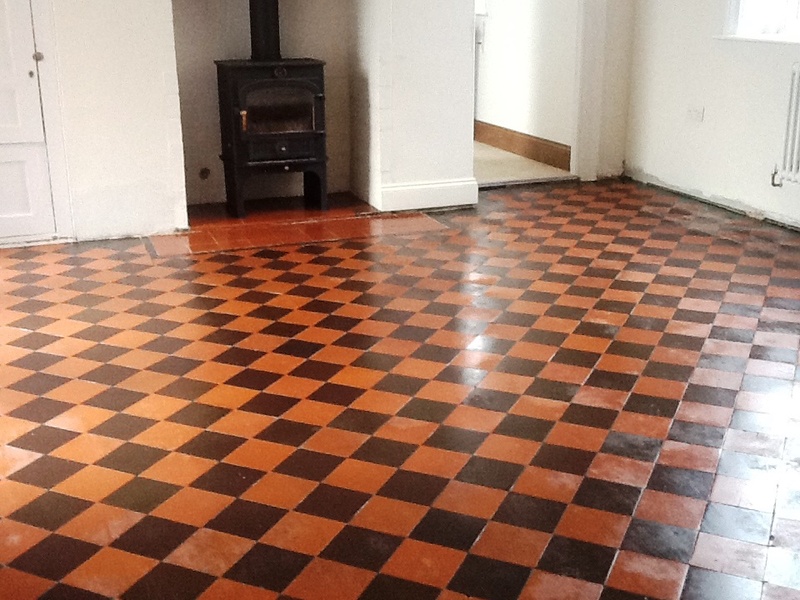 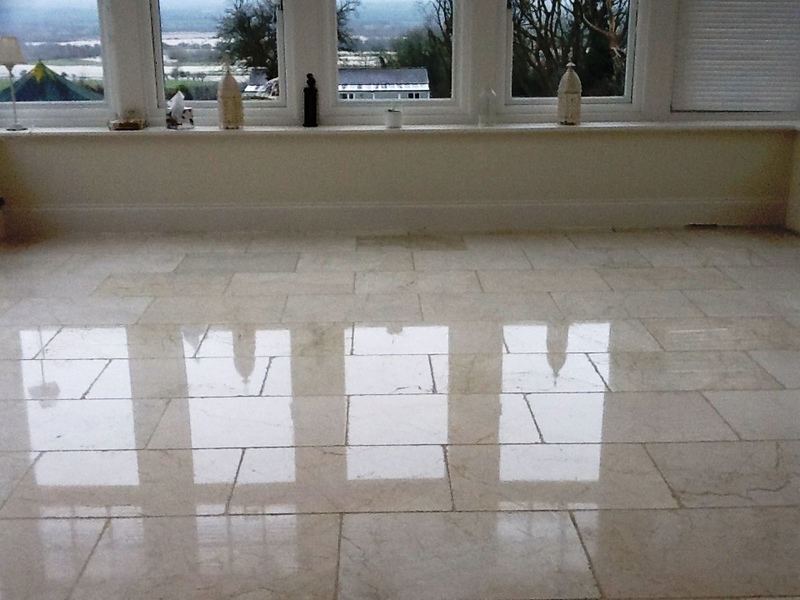 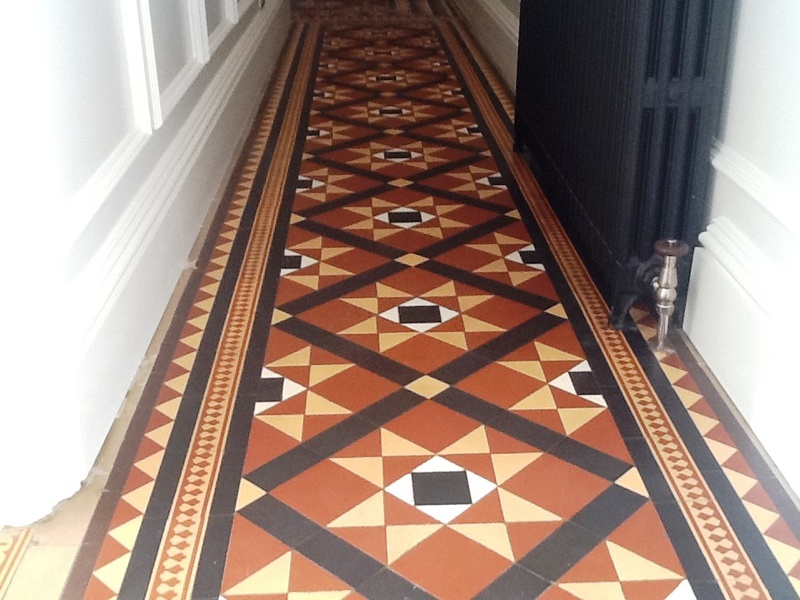 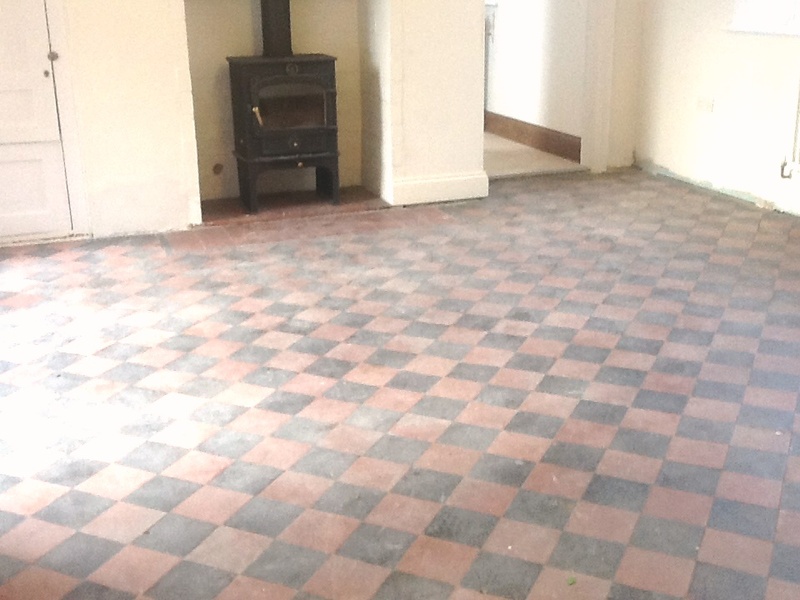 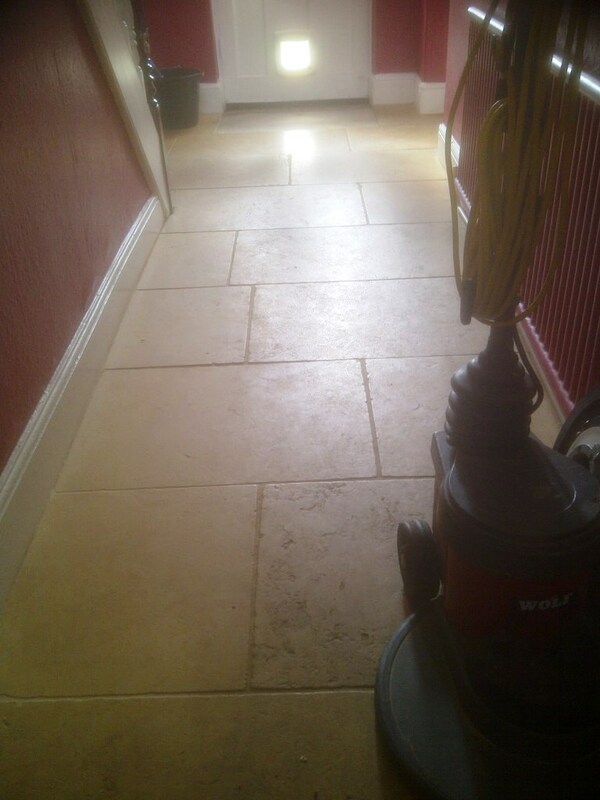 The next day I used a damp tester it to make sure the slate floor was fully dry and then proceeded to apply several coats of Tile Doctor High Shine sealer which gives a nice deep shine as well as providing stain protection. 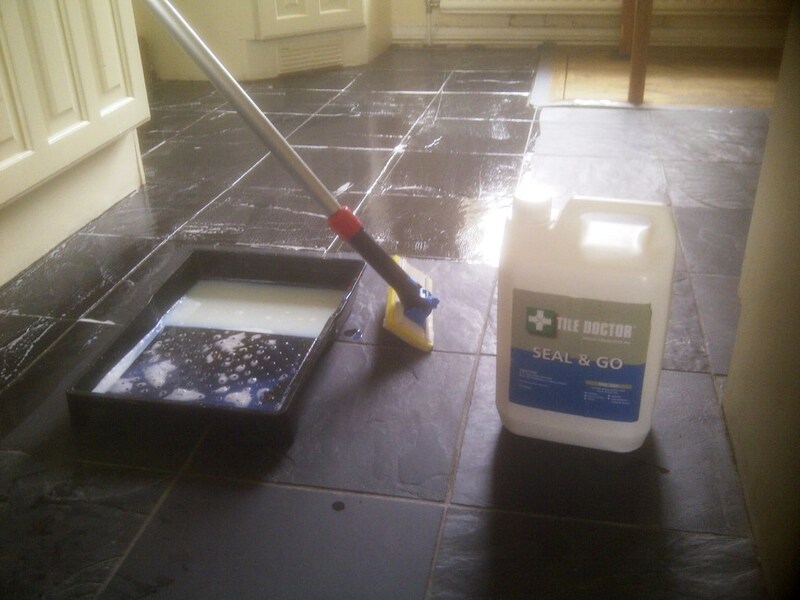 I mentioned to the customer about the free bottle of Ph Neutral Tile and Stone Cleaner that Tile Doctor send out on completion of customer feedback to ensure she had the right product to clean her newly sealed slate tiles going forward. 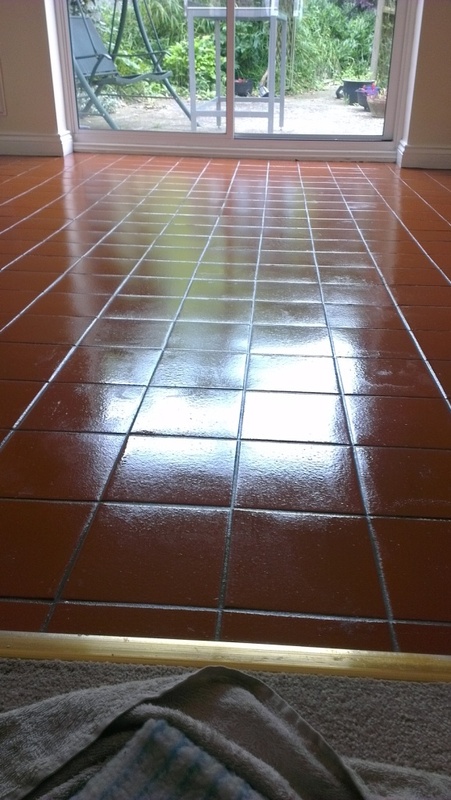 A lot of people don’t realise that many products available for tile cleaning in supermarkets are really designed for ceramic floors and that they can erode the sealers due to their high ph content. 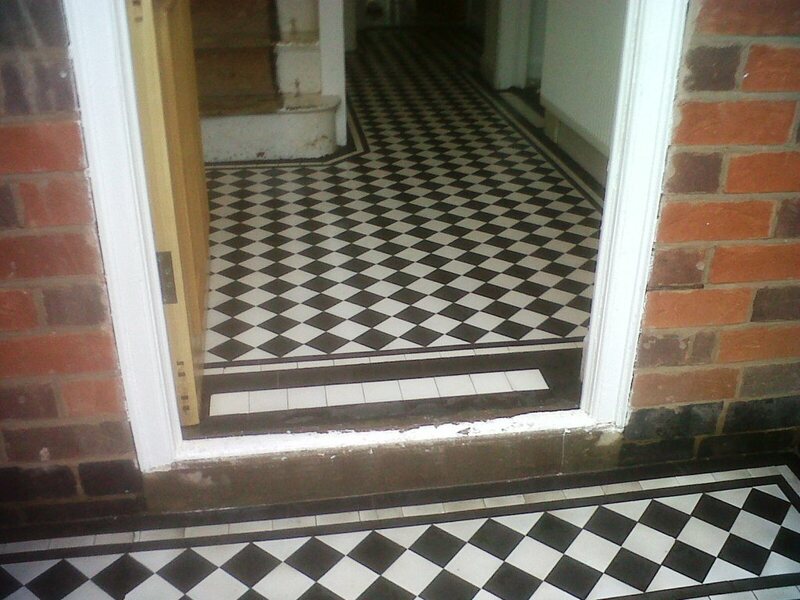 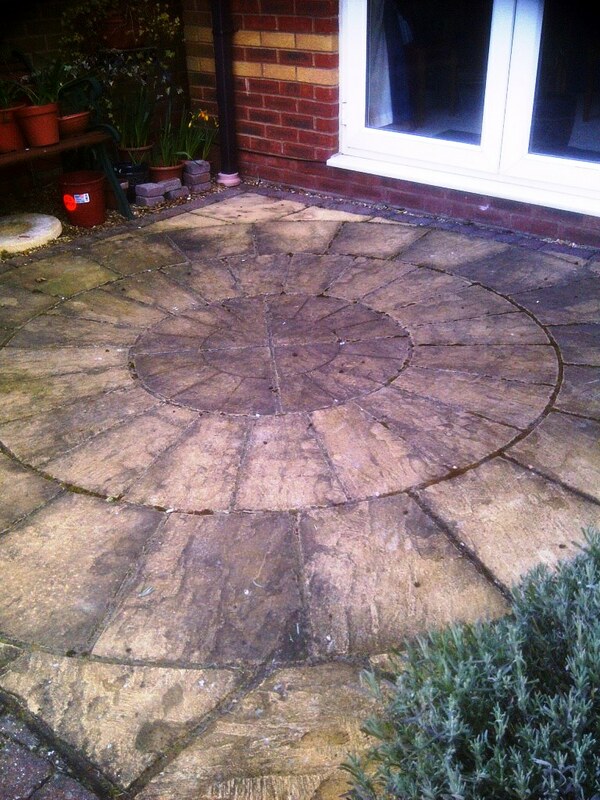 My customer Ms Hayes was very pleased with the results and left the following testimonial.